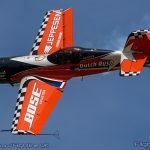 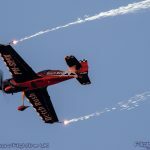 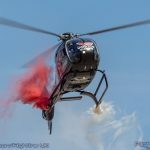 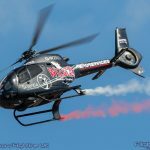 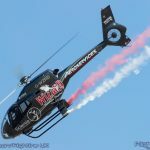 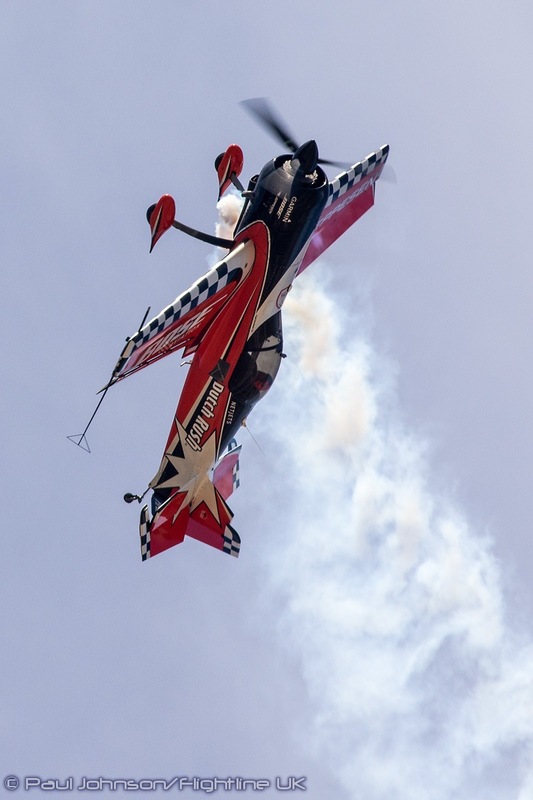 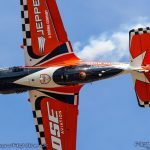 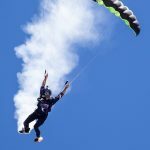 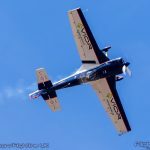 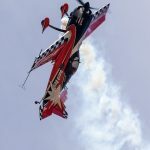 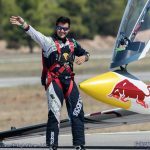 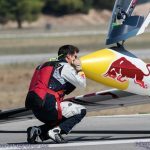 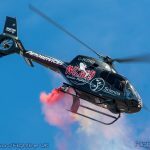 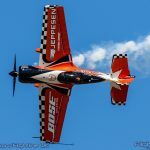 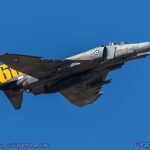 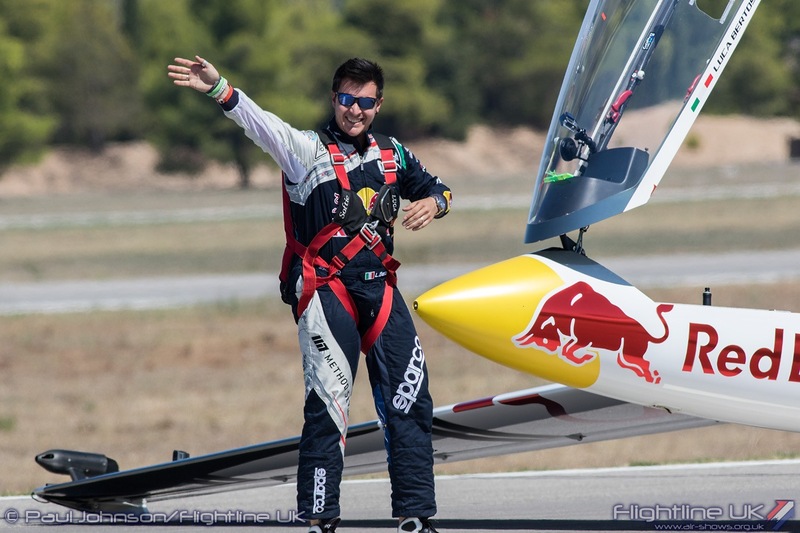 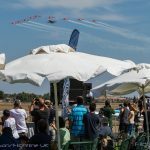 In just seven years, Athens Flying Week has become the host of one of the most anticipated international airshows in Europe. 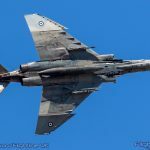 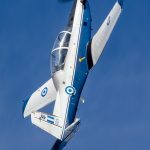 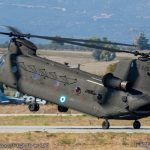 The “week” is not just an airshow with the preceding Wednesday seeing a major aviation conference in Athens covering a wide range of topics from commercial aviation through to major defence topics. 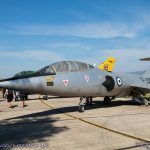 The weekend airshow is however the highlight of the event and this year returned to Tanagra Air Base which is about 65km north of Athens. 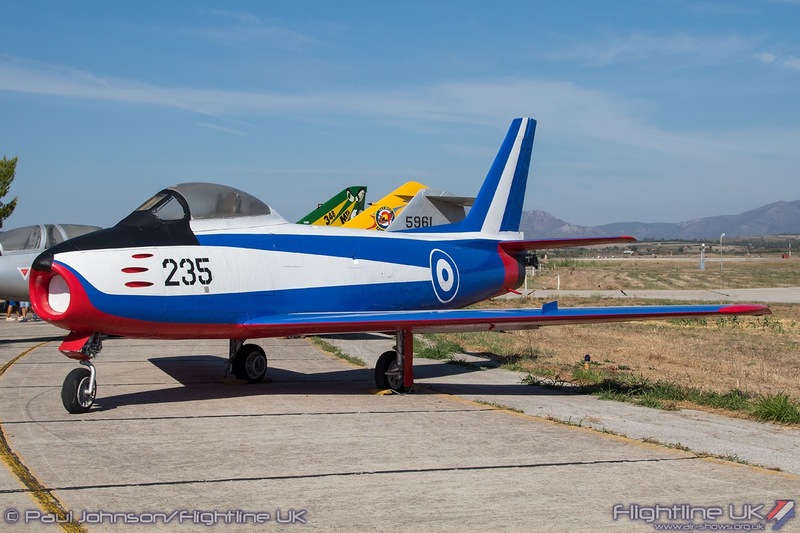 The show features civilian and military displays teams from across Europe but it is the Hellenic Armed Forces that take a starring role. 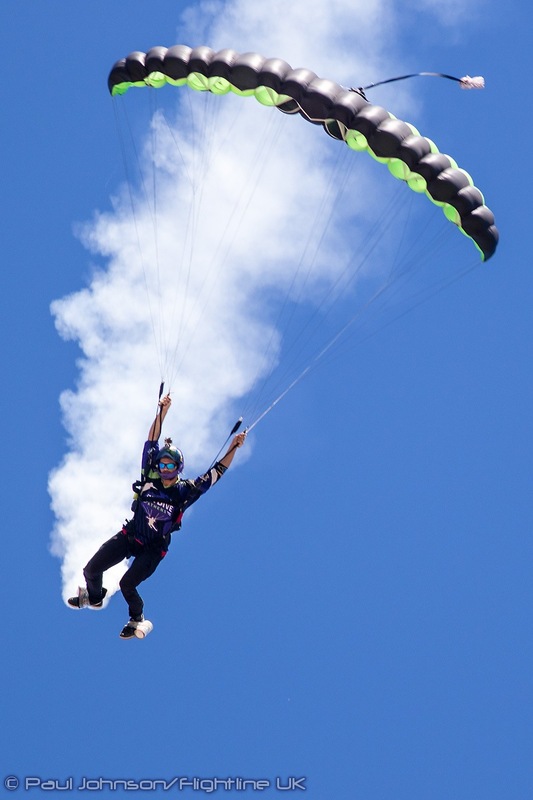 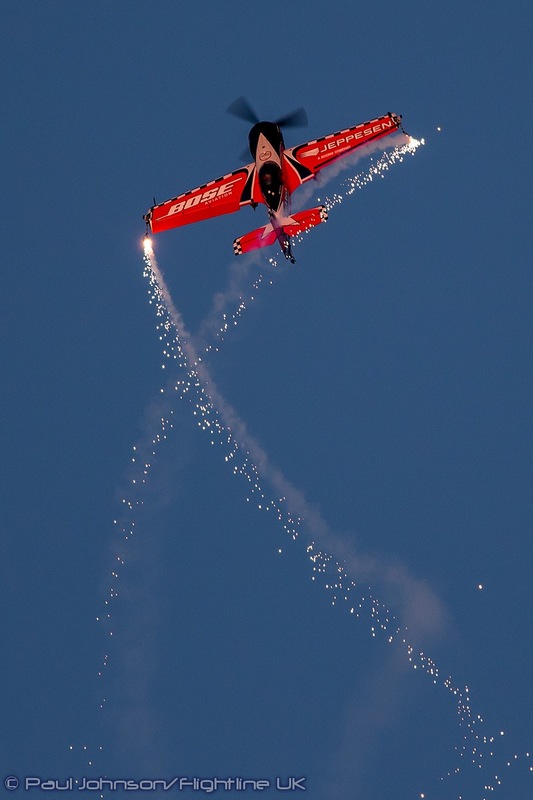 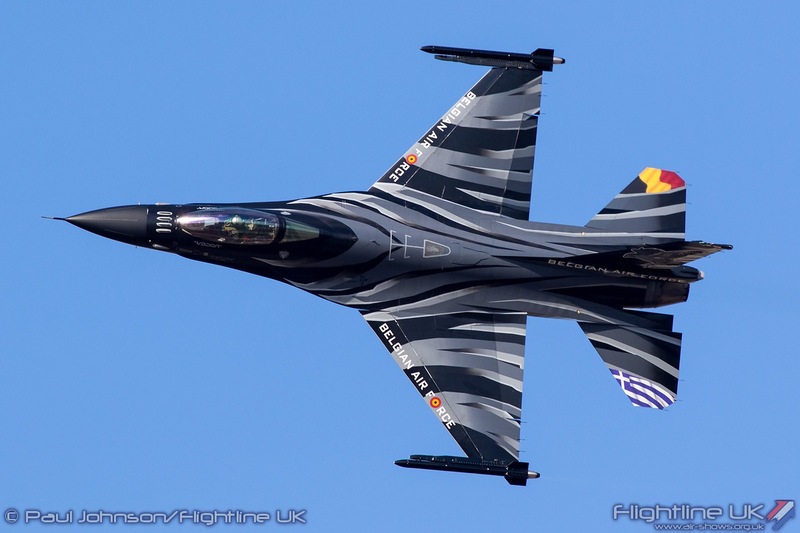 Major international airshows are a relatively new phenomenon in Greece. 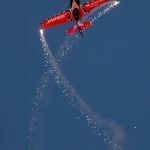 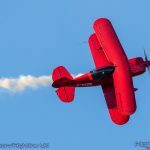 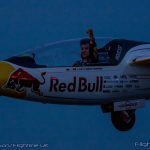 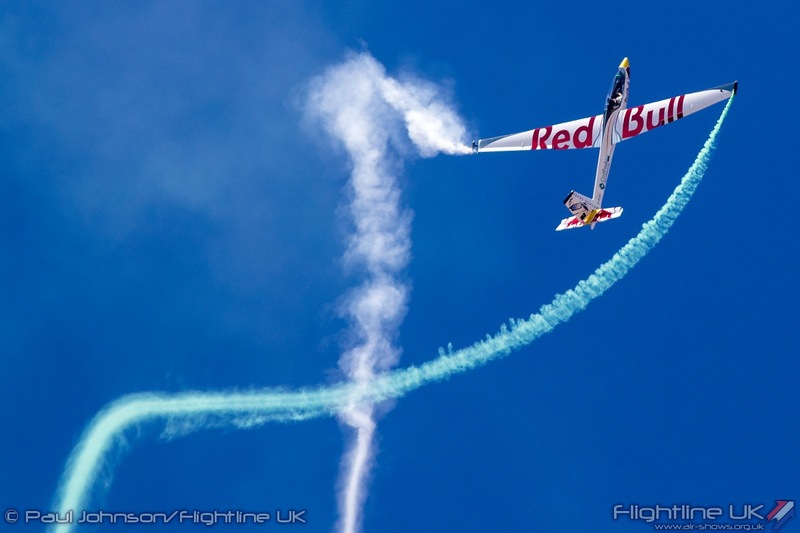 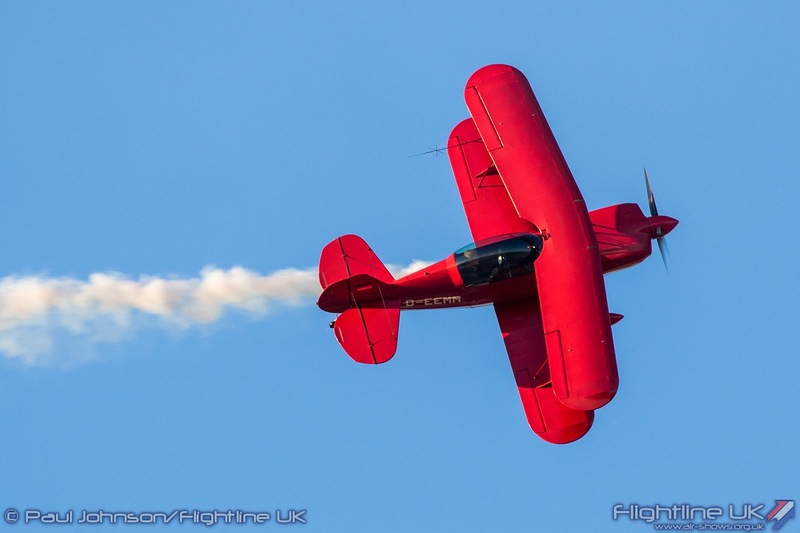 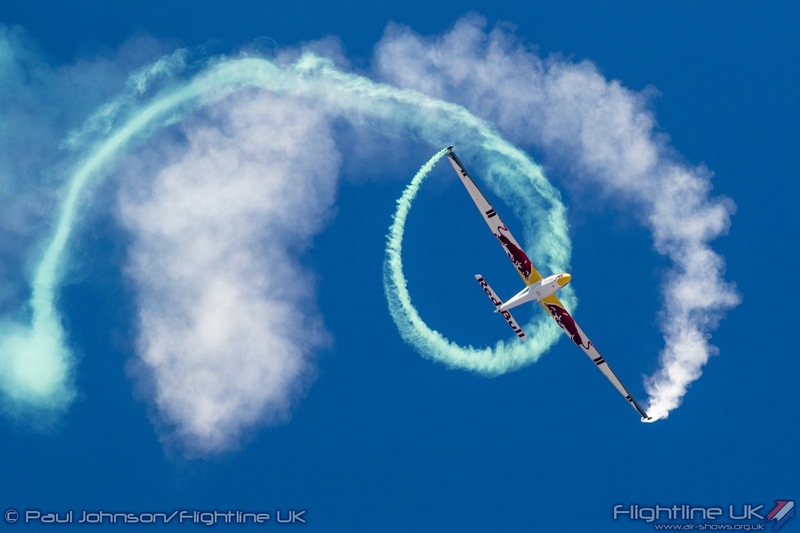 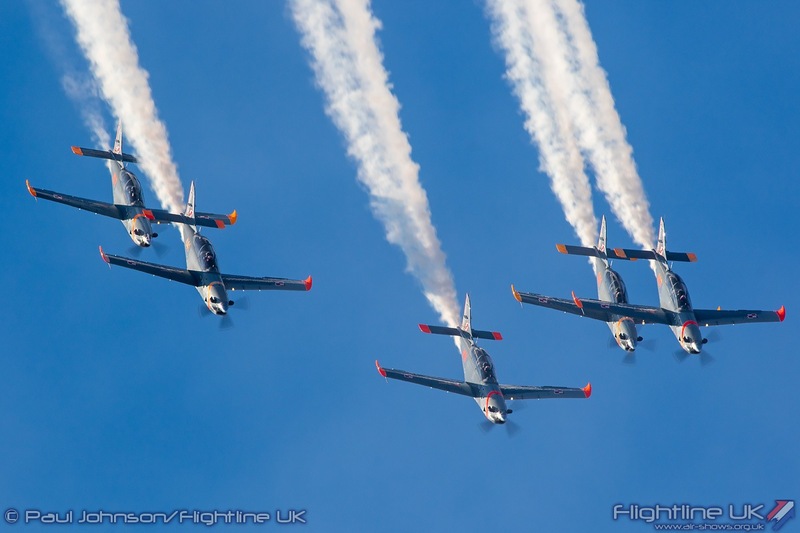 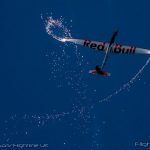 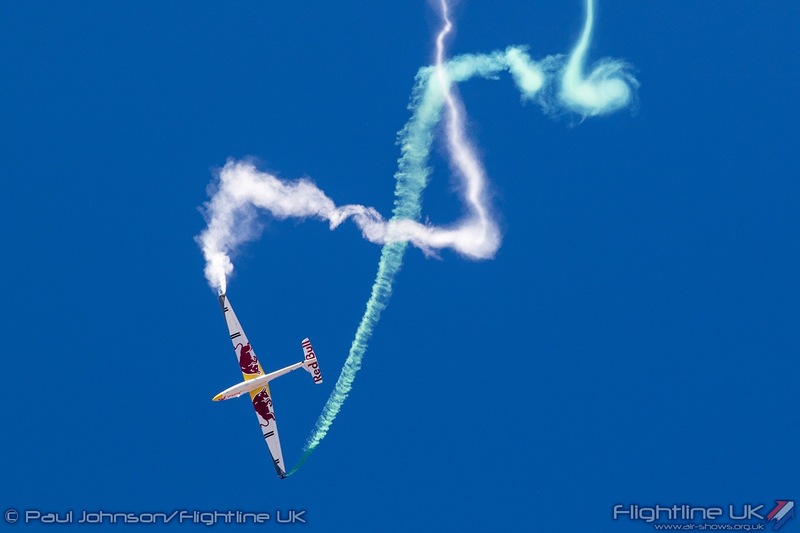 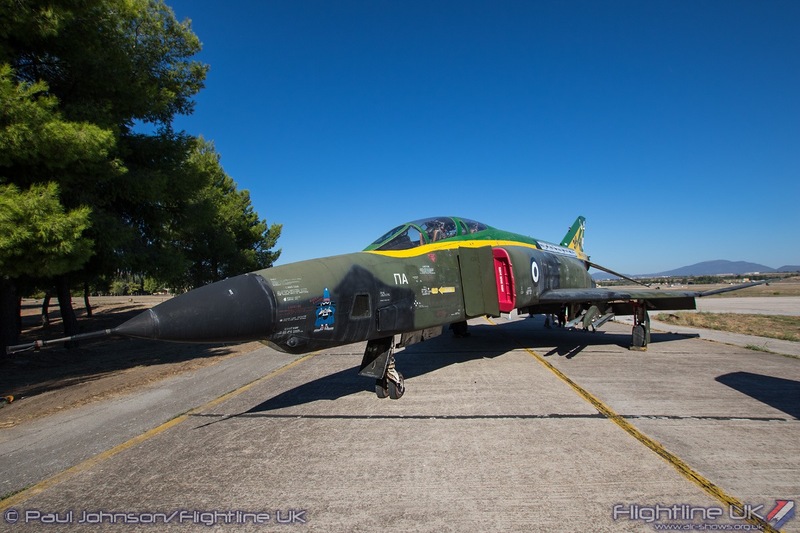 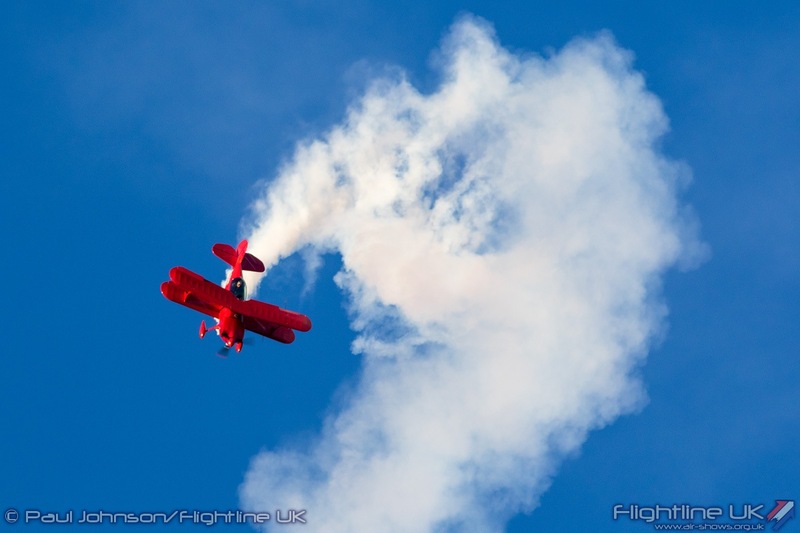 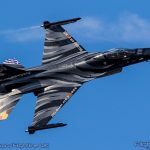 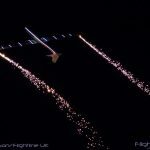 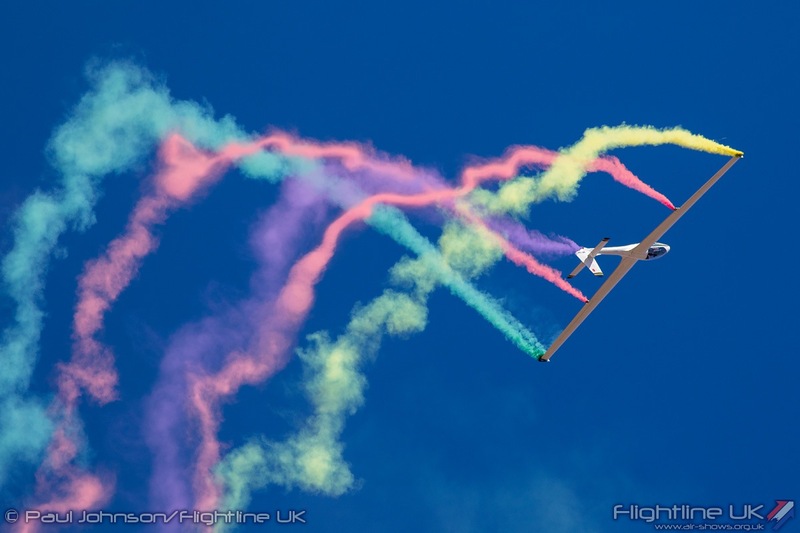 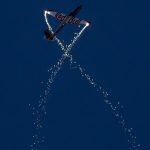 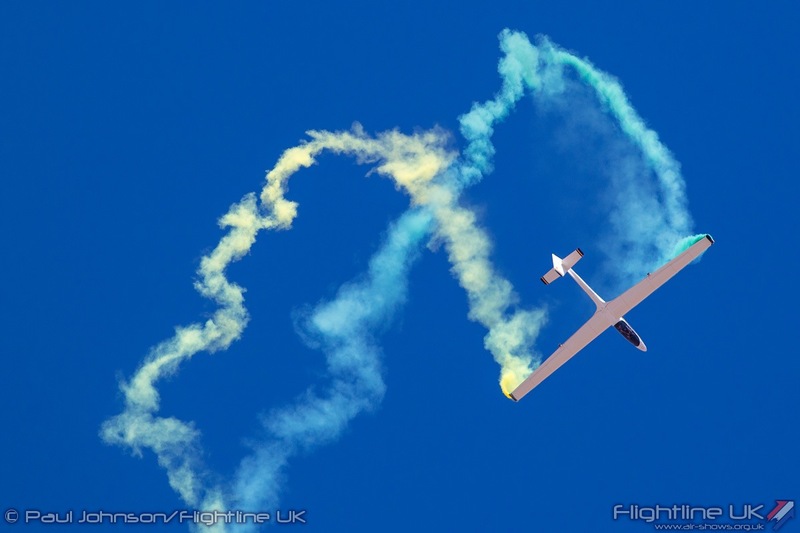 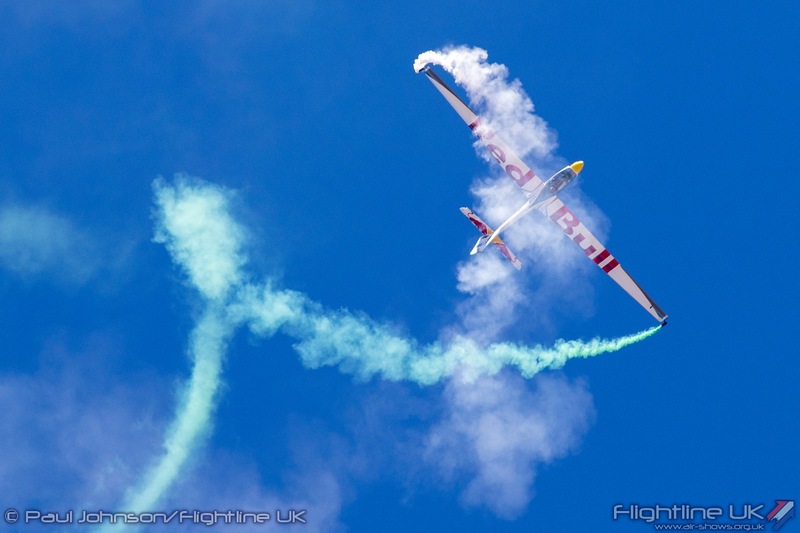 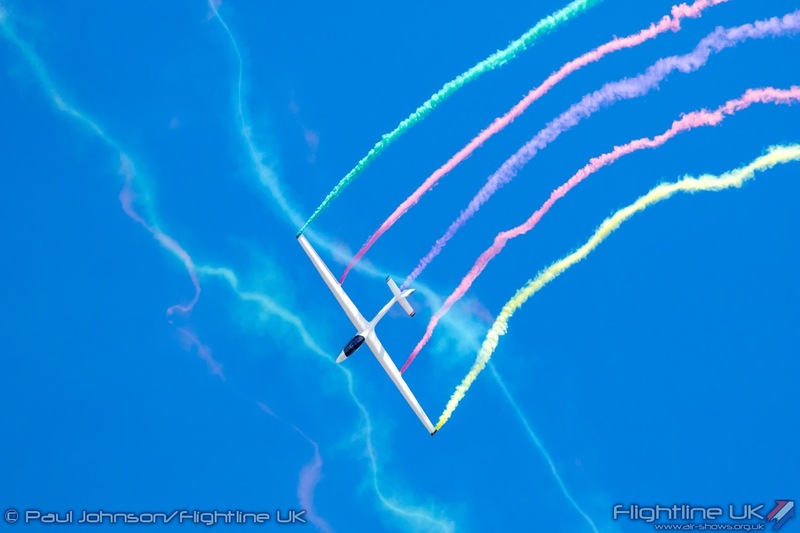 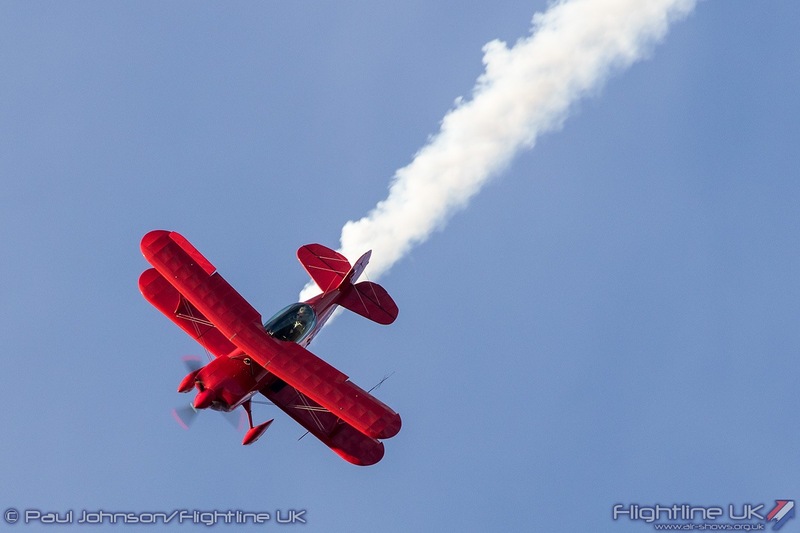 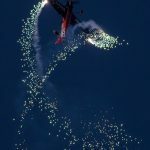 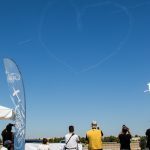 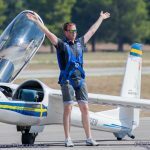 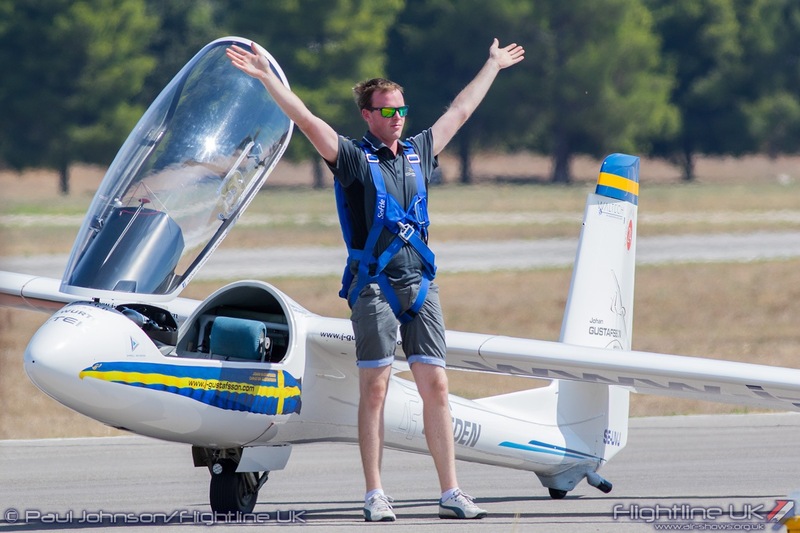 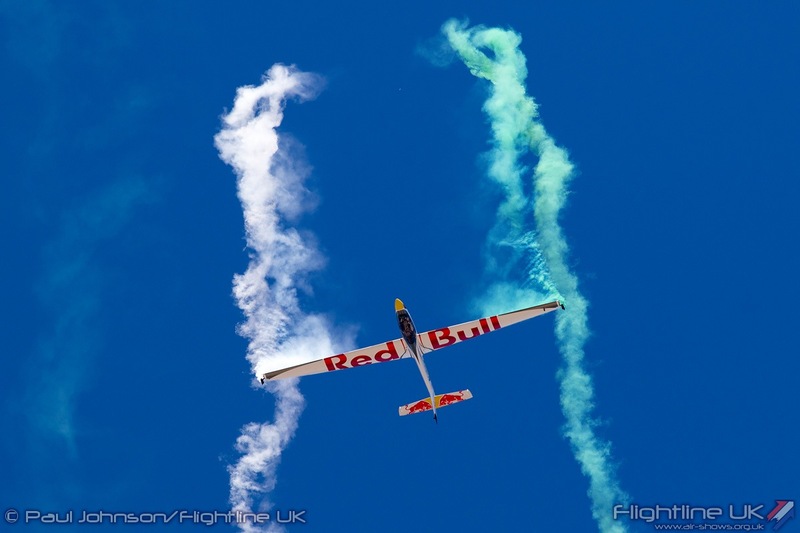 However, Athens Flying Week has risen quickly in just seven years to become one of Europe’s best known aviation spectaculars attracting display acts and visitors from across the continent and beyond. 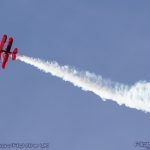 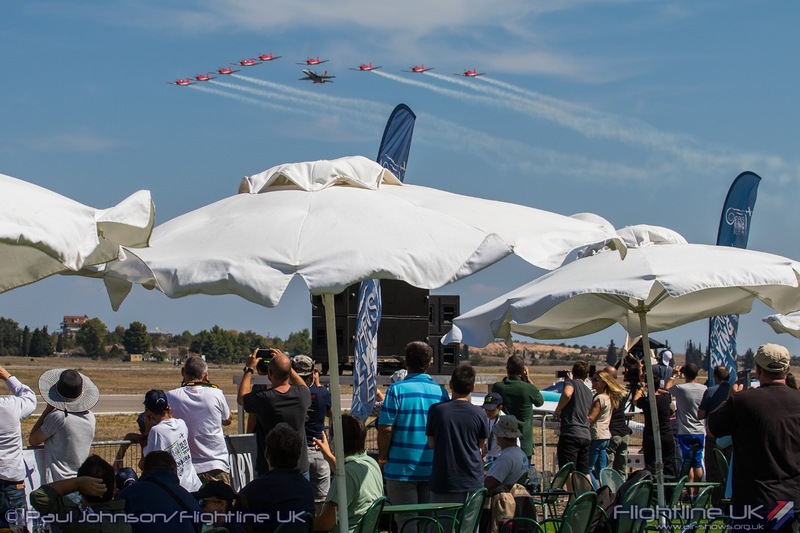 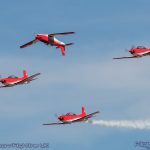 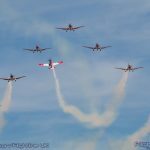 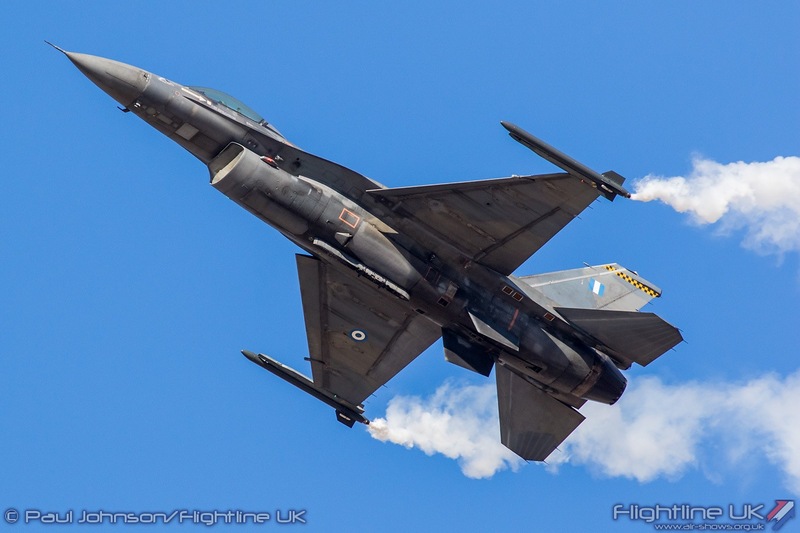 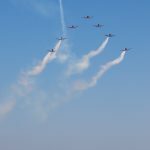 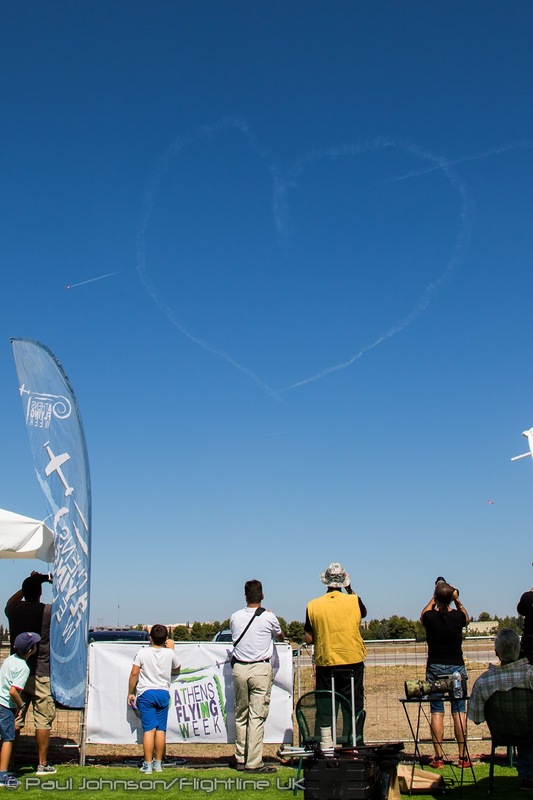 As the event title suggests, Athens Flying Week encompasses more than just a two day airshow with a major aviation conference held in the Greek capital during the week before the event. 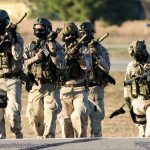 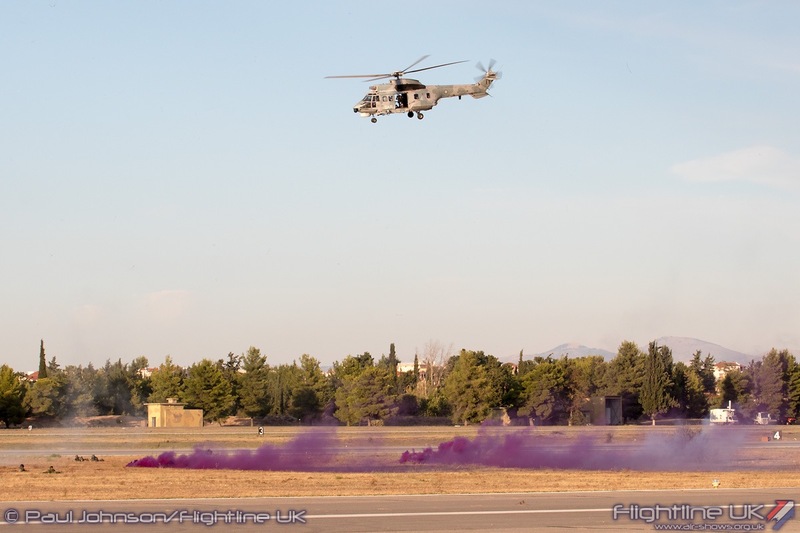 It is a civilian organised event, but does attract some significant support from the Hellenic Armed Forces, Local Government and other organisations. 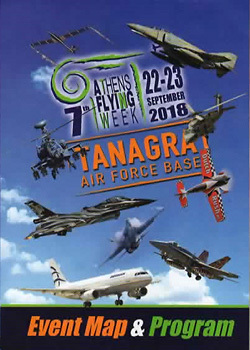 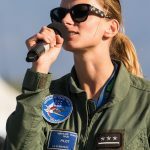 The two day Athens Flying Week airshow is hosted at Tanagra Air Base near the town of Schimatari about a one hour drive north of the capital. 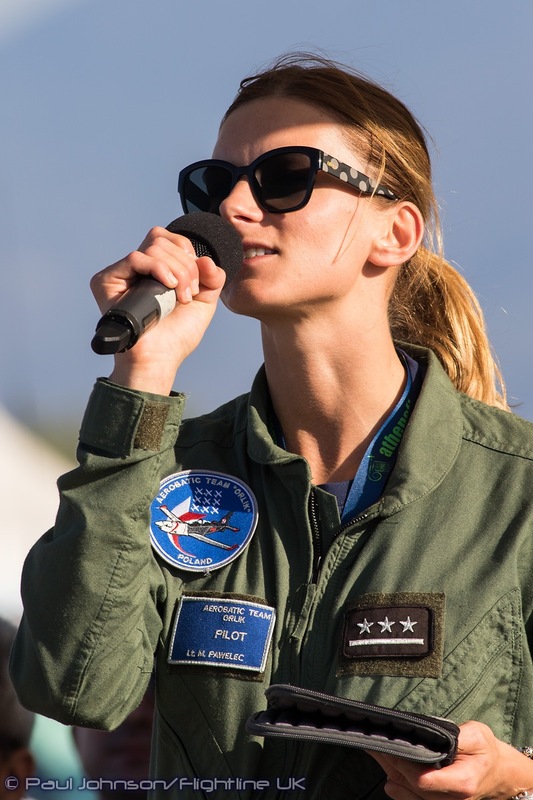 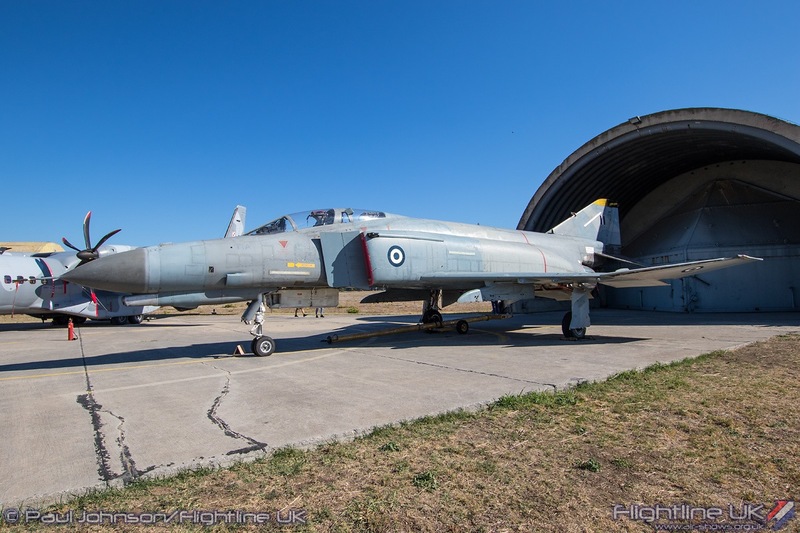 The event moved here in 2016 after the first editions were held at Tatoi Air Base, the home of the Hellenic Air Force Academy and Air Force Museum. 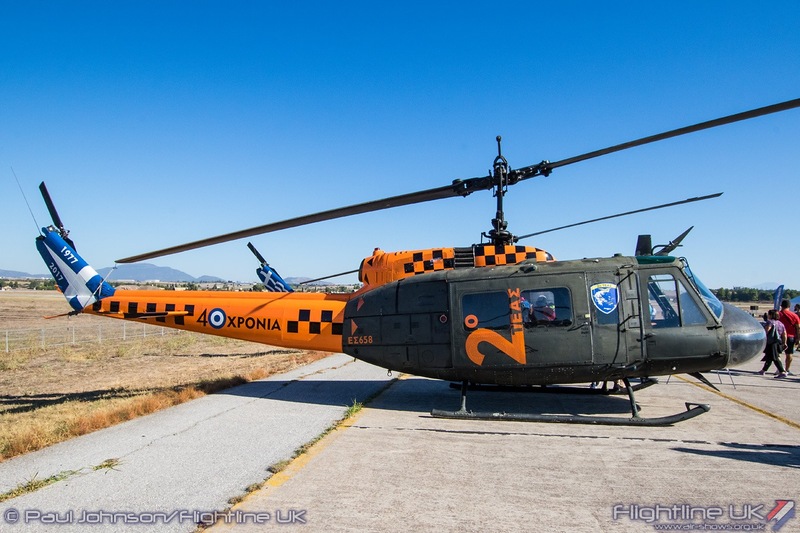 However, Tatoi which is just outside of Athens, is relatively small and surrounded by built up areas. 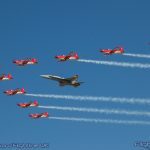 It also could not accept some of the fast jet participants which had to operate Tanagra for the display. 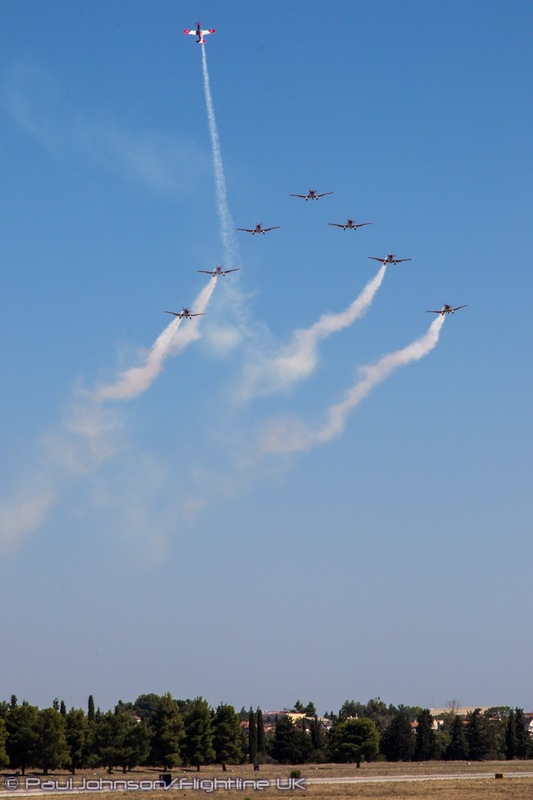 The move to Tanagra has allowed all the participants to be based together, more static aircraft to be invited plus means the show has much more space to grow into. 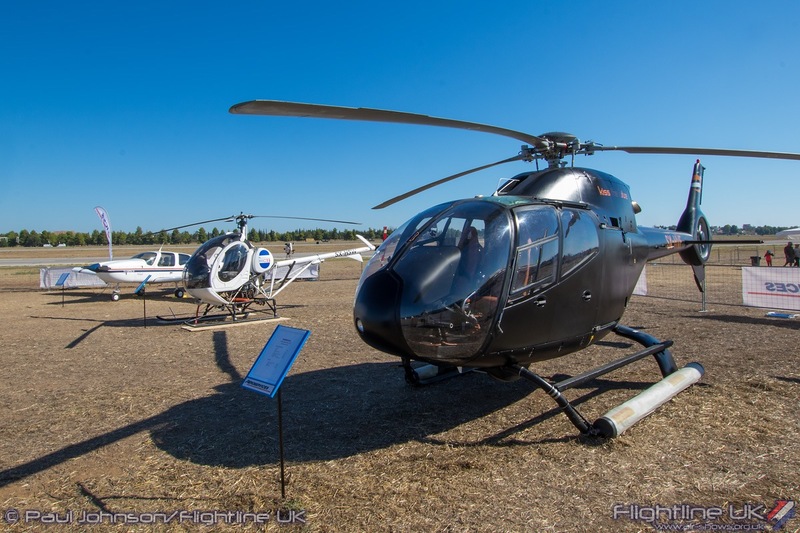 From a safety perspective, it also means there is plenty of sterile land under the display area. 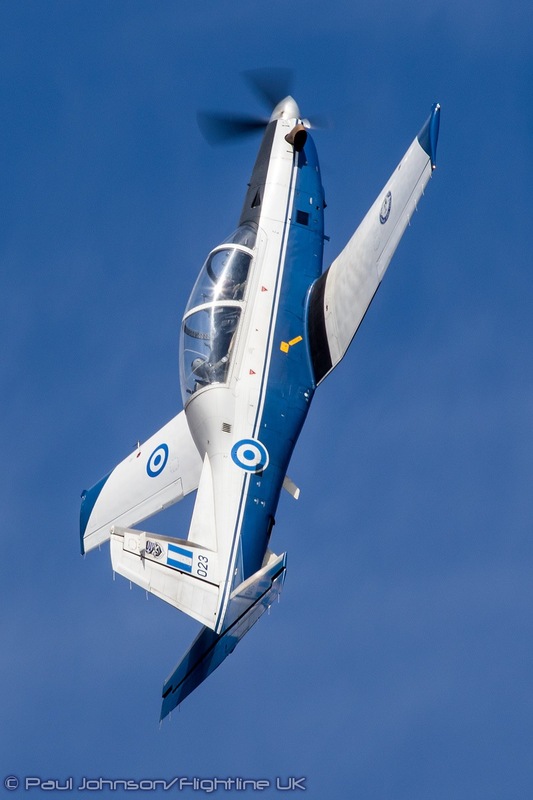 Tanagra does have some previous airshow history as in 2005, it hosted Greece’s first and only airshow. 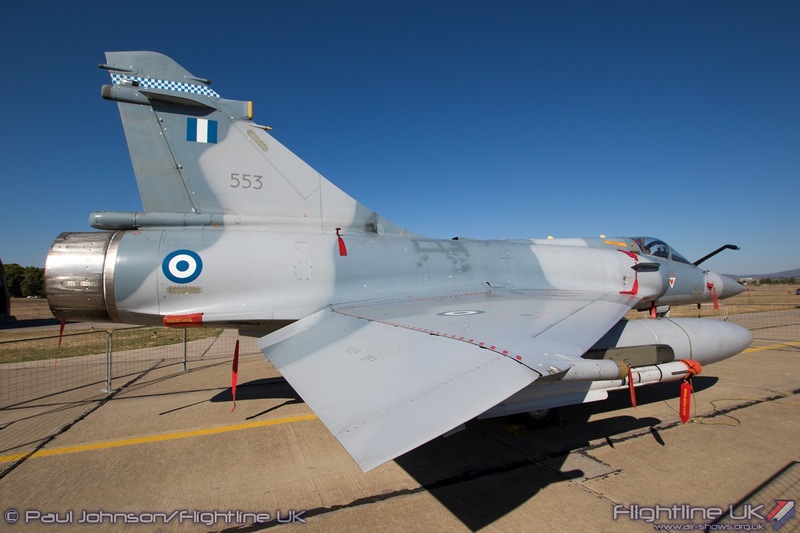 That event was hosted by the Hellenic Air Force. 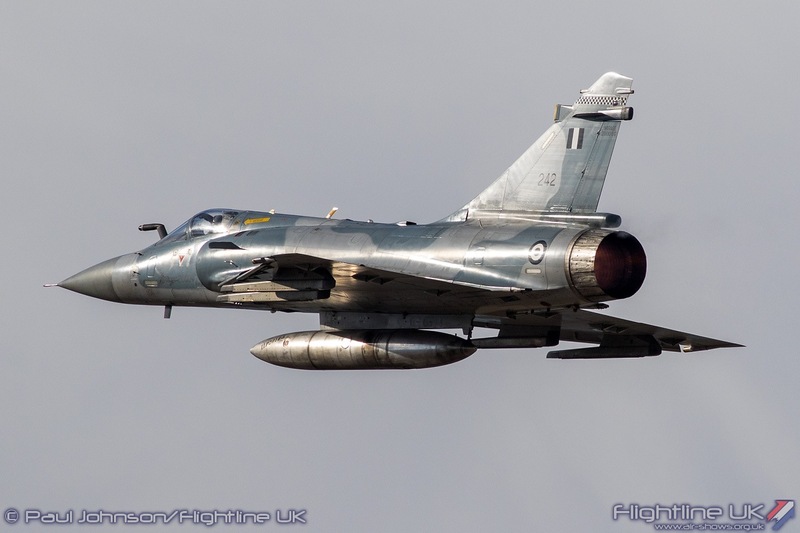 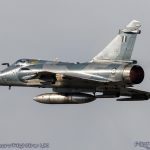 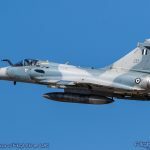 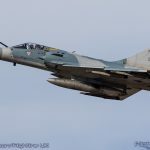 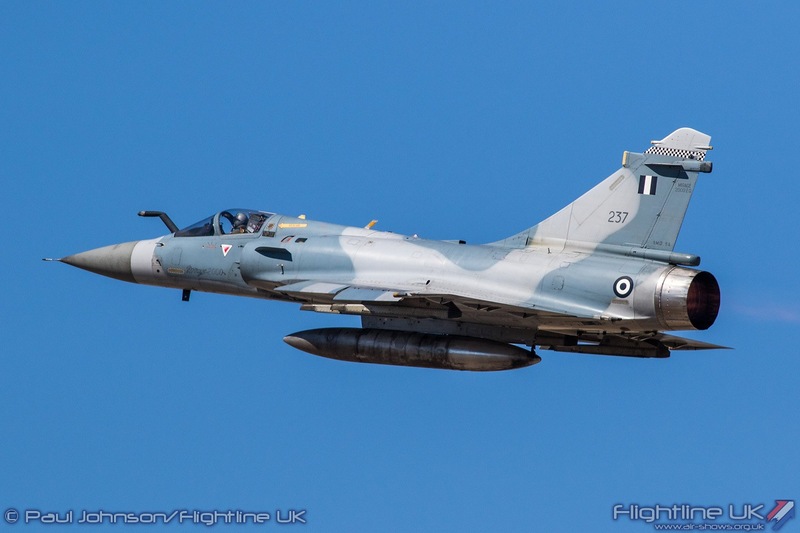 Tanagra is home to the 114 Combat Wing of the Hellenic Tactical Air Force with two squadrons of Dassault Mirage 2000EG and 2000-5 multi-role fighters. 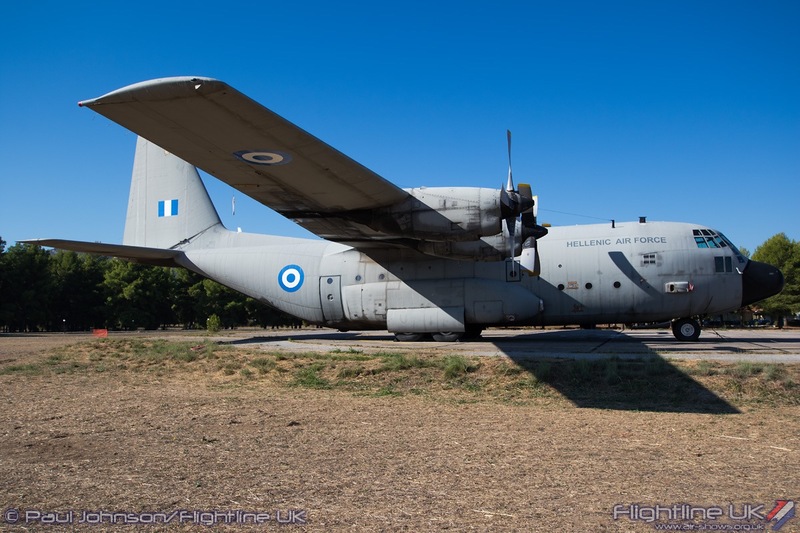 Adjoining the airfield is a large complex belonging to Hellenic Aerospace Industry which produces Unmanned Aerial Vehicles and also provides engineering maintenance and support services to the Hellenic Armed Forces aviation fleets. 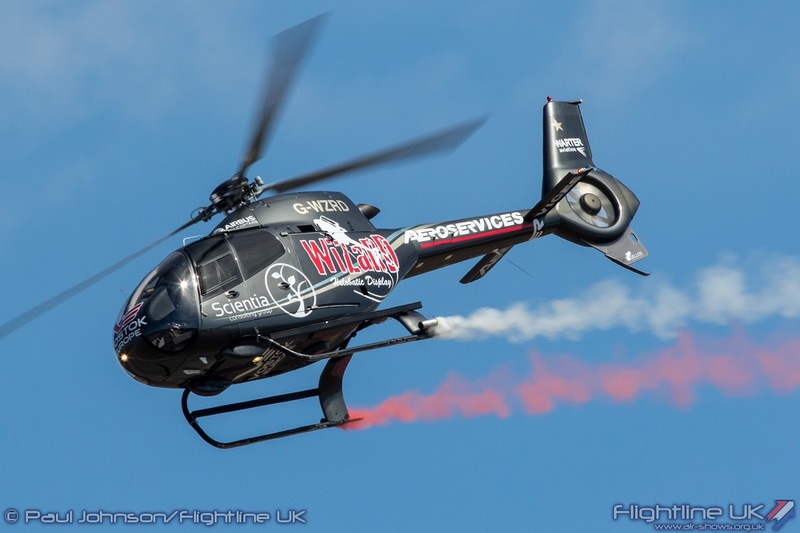 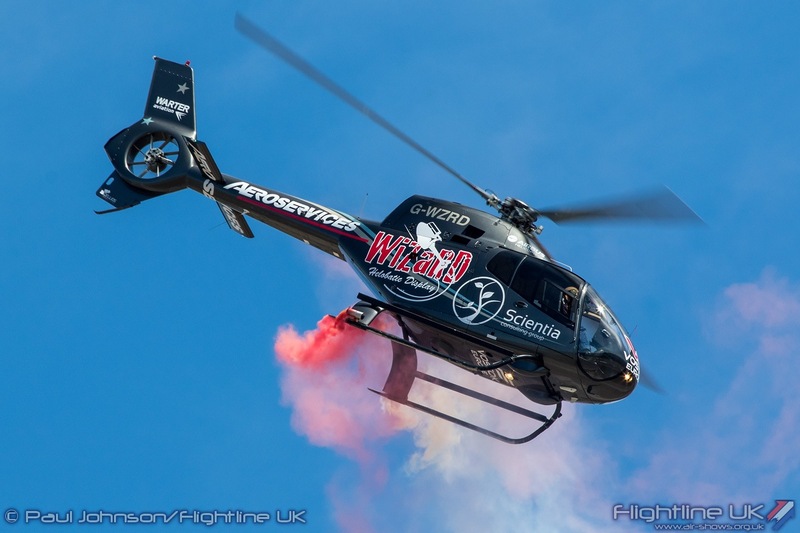 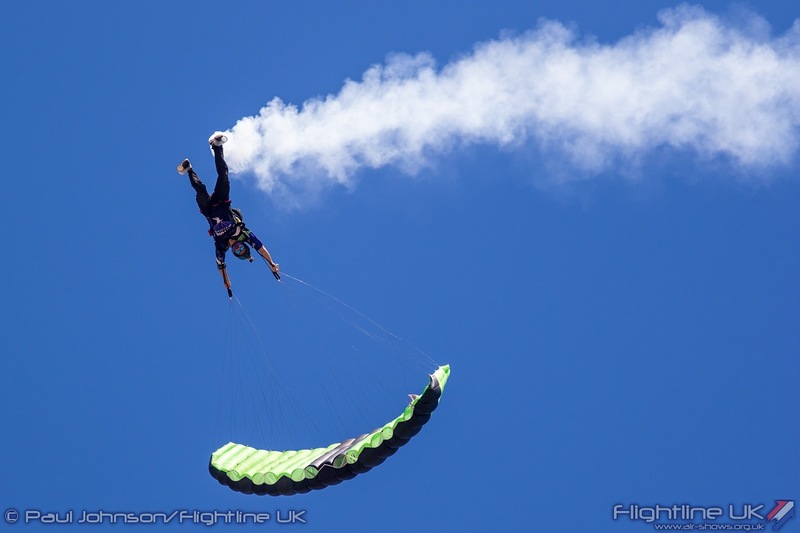 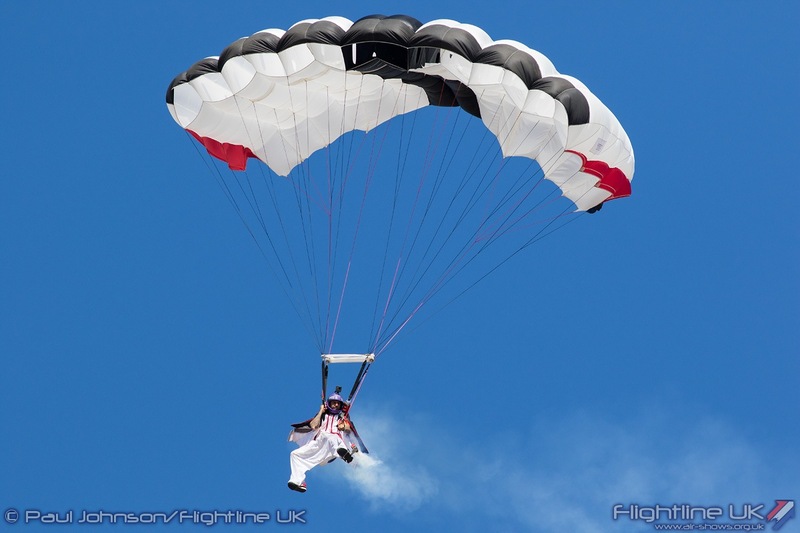 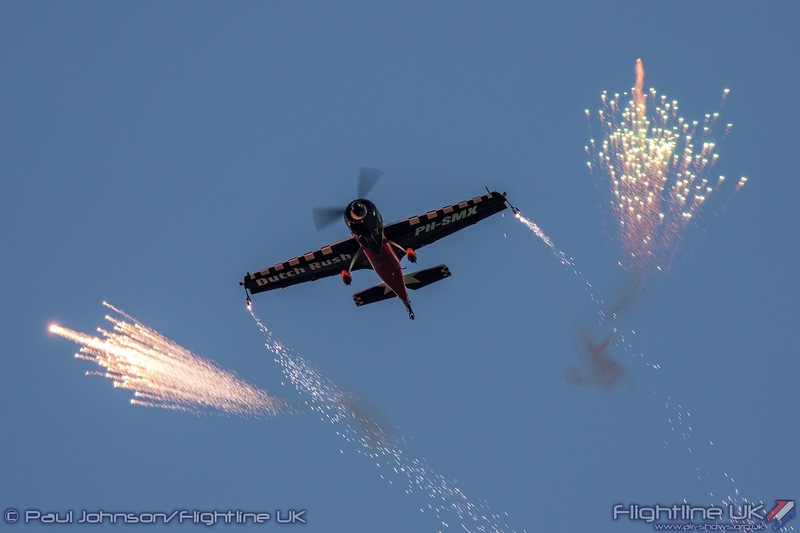 The AFW Airshow was a full day-long event with gates opening at 10am and flying displays taking place from just before midday right through to nearly 8pm in the evening. 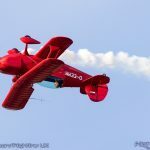 Considering the relatively low price of entrance (between €10-15 for adults depending on whether the tickets were bought in advance and the day you attended) that is very good value for money! 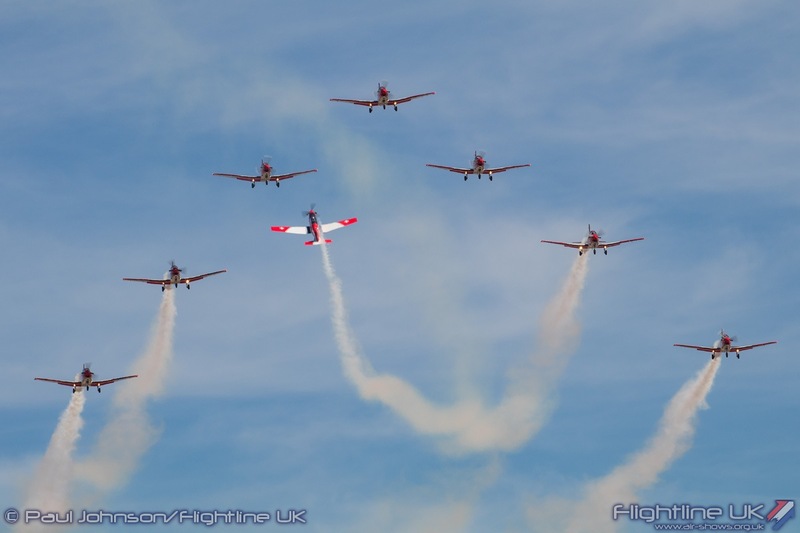 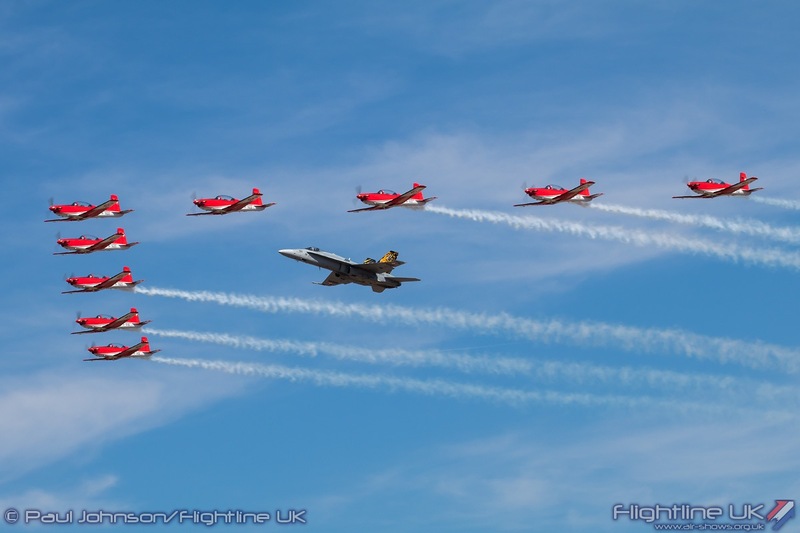 The show also offers Spotter packages which like RIAT offer the chance to catch arrivals, rehearsals and departures in the days before and after the event from a dedicated grandstand enclosure. 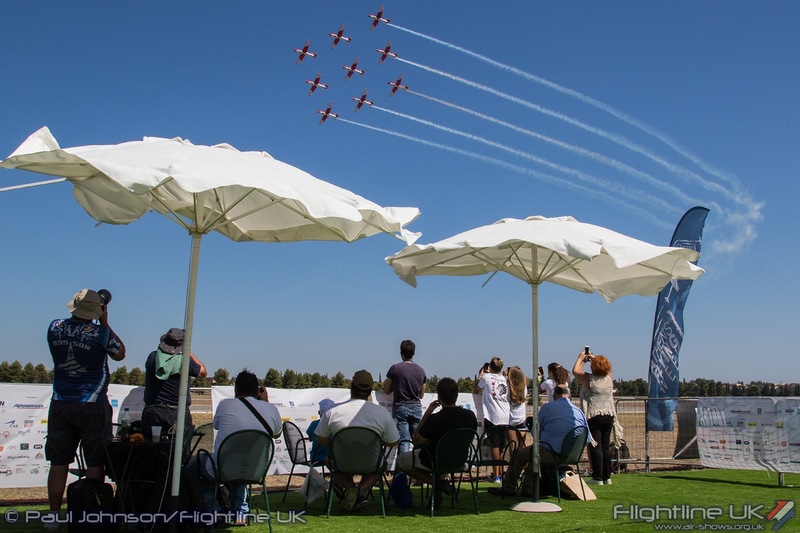 There are also two “Seat and Shadow” areas available for an upgrade fee which allows visitors some respite from the heat and sun as well as some unrestricted views of the action. 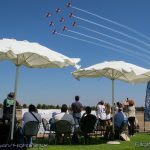 It is very noticeable (and unsurprising) that many spectators bring all manner of shelters from the sun including small pop-up gazebos and parasols! 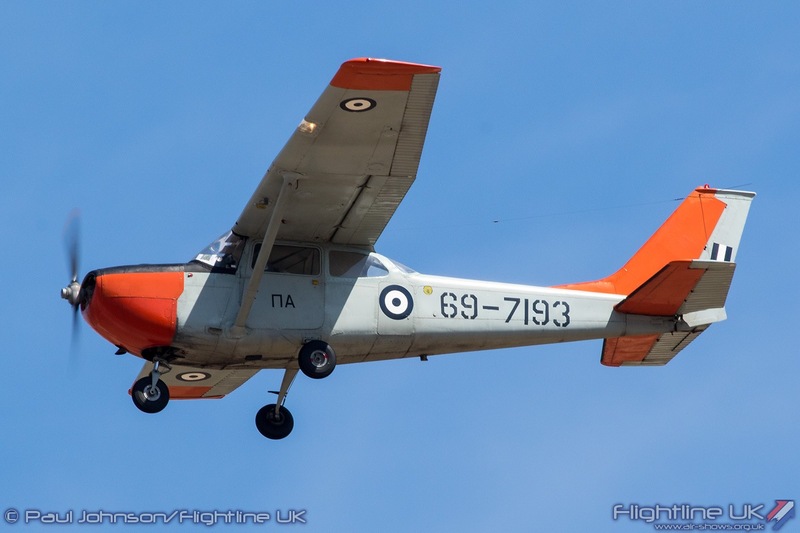 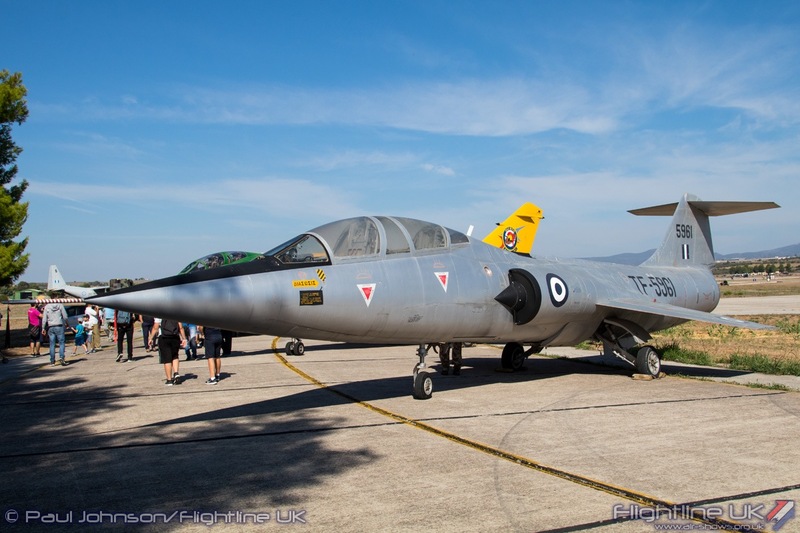 On the ground, static aircraft displays were joined by a number of aviation memorabilia stalls, a Hellenic military re-enactment display, industry displays and of course refreshments (which are all very reasonably priced!). 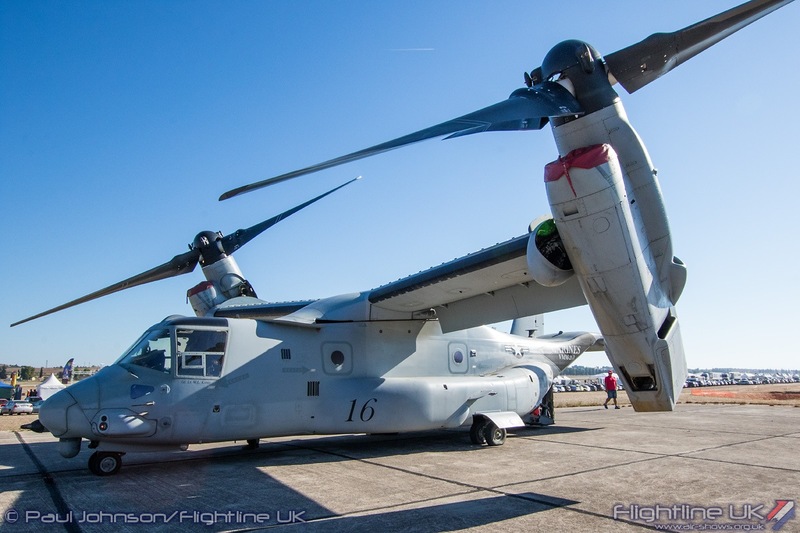 The aircraft static display was small but was full of quality. 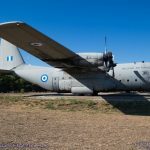 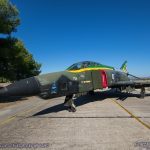 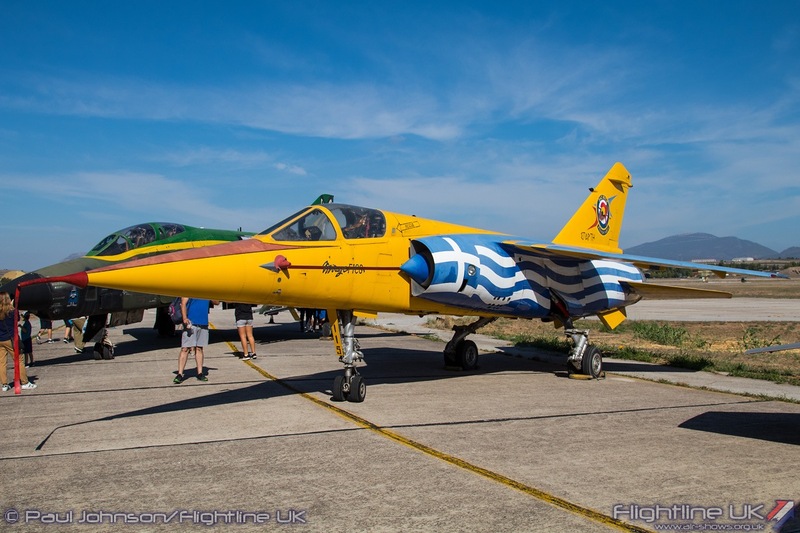 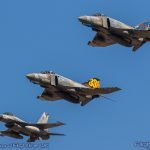 It included a number of well-preserved historic airframes from the Hellenic Air Force which are stored on the airfield, many of which wear colourful special markings. 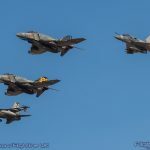 These included a North American F-86E Sabre, Lockheed TF-104G Starfighter, Dassault Mirage F1CG and McDonnell Douglas RF-4E Phantom II. 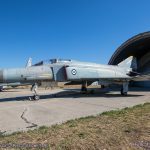 It was a shame however that more historic airframes could not have been included as elsewhere on the airfield examples of a F-102 and F-84 were spotted. 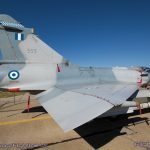 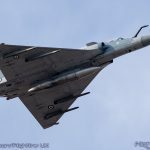 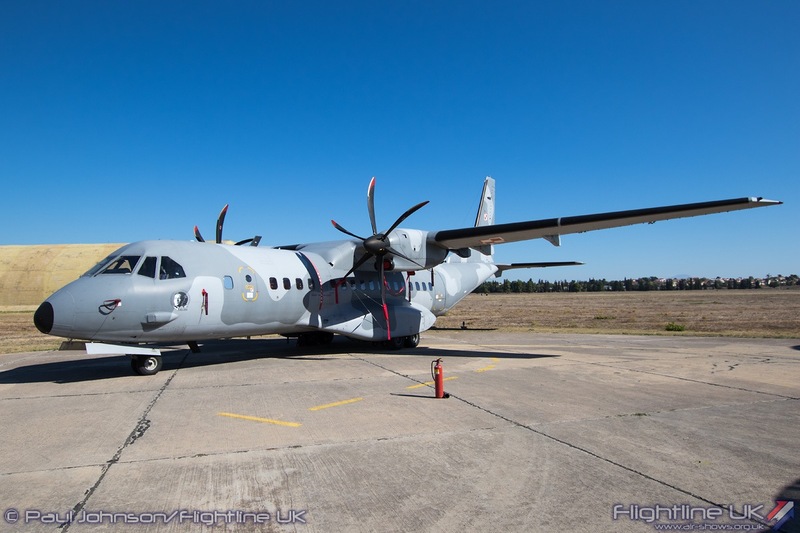 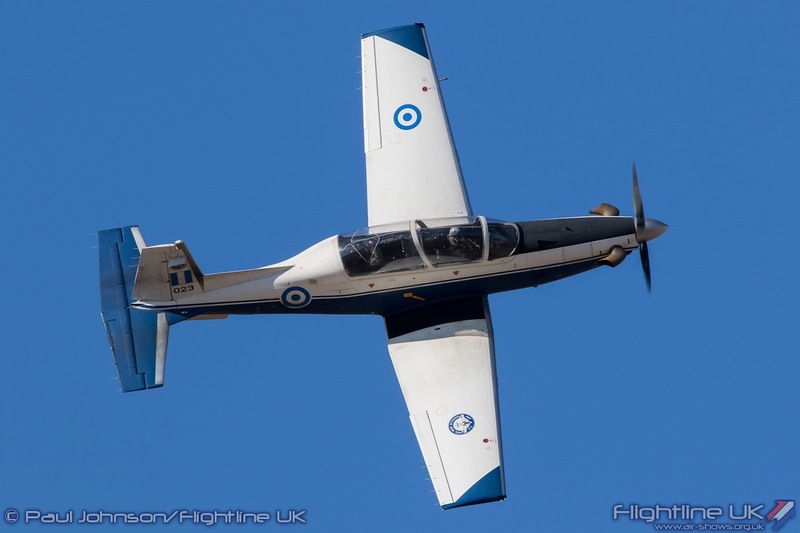 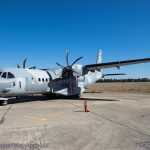 The current Hellenic Armed Forces presented a wide variety of aircraft. 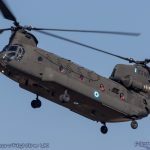 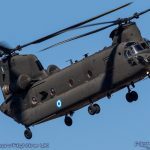 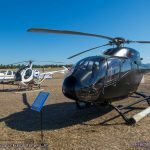 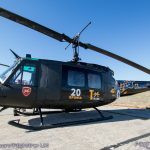 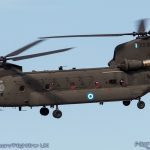 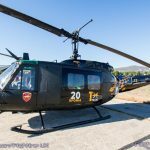 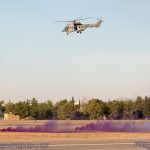 The Hellenic Army displayed examples of the Boeing AH-64DHA Apache and CH-47D Chinook alongside a pair of very colourful Bell UH-1H Iroquois helicopters. 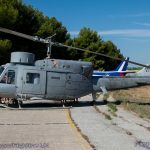 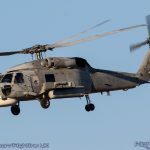 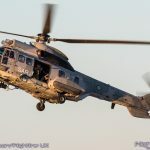 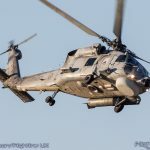 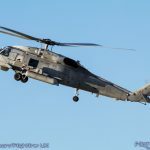 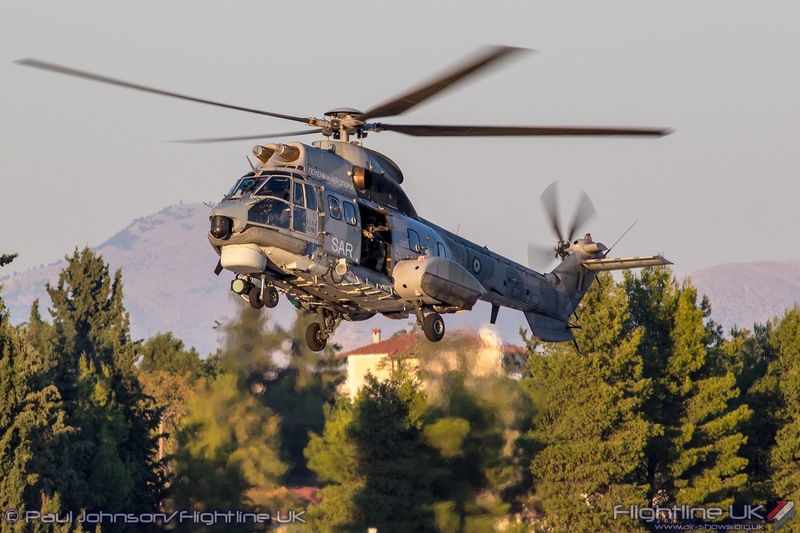 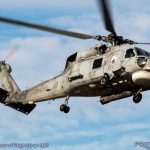 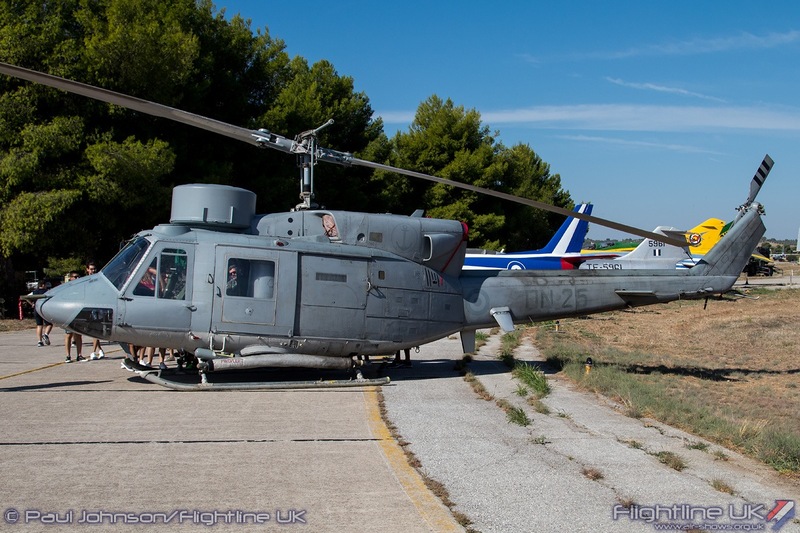 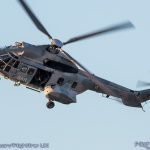 Further static helicopters came from the Hellenic Navy with a Sikorsky S-70B-6 Aegean Hawk displayed alongside an Agusta/Bell AB212 Anti-Submarine Warfare aircraft. 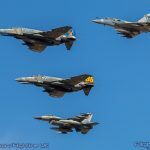 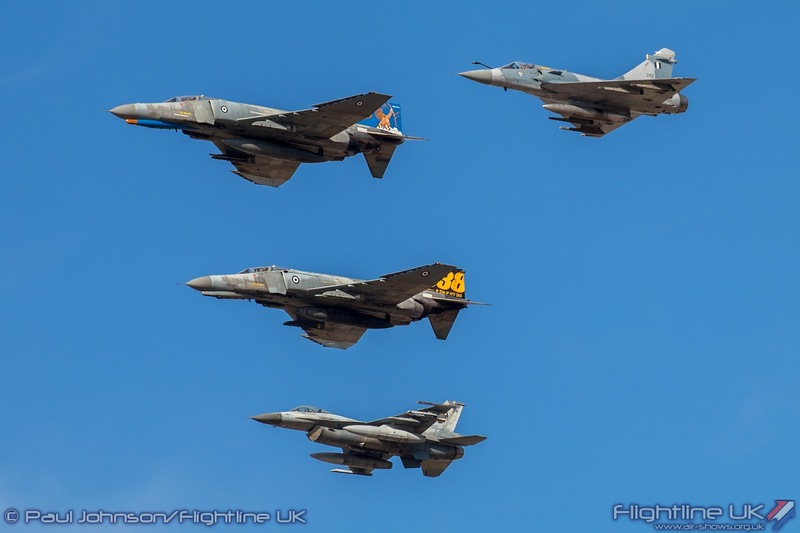 Completing the modern day line-up was the Hellenic Air Force with examples of the Dassault Mirage 2000-5, McDonnell Douglas F-4E(HUP) Phantom II and a Lockheed C-130H Hercules. 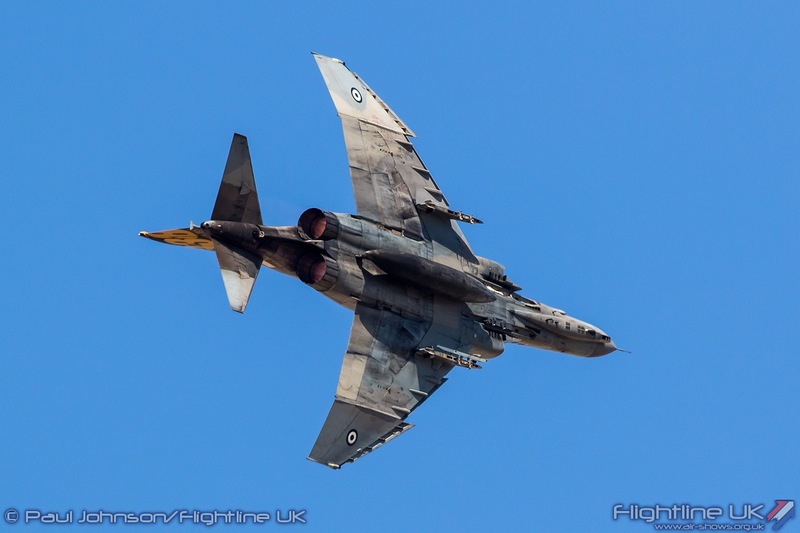 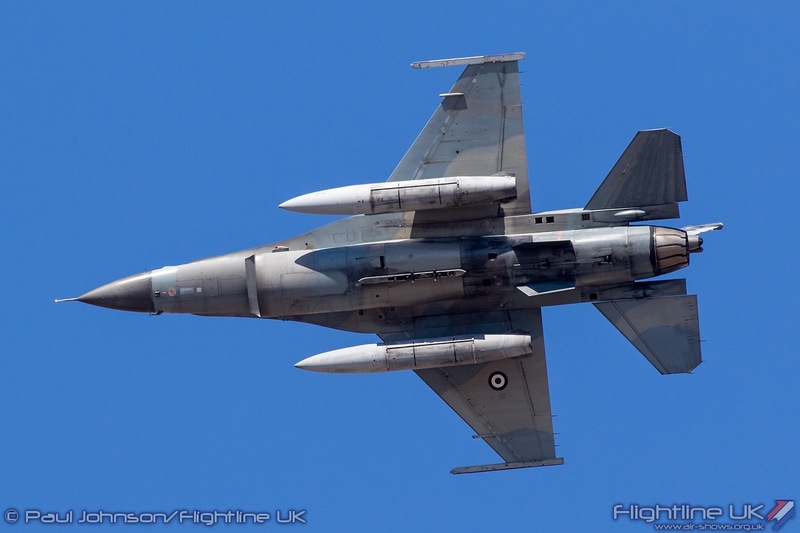 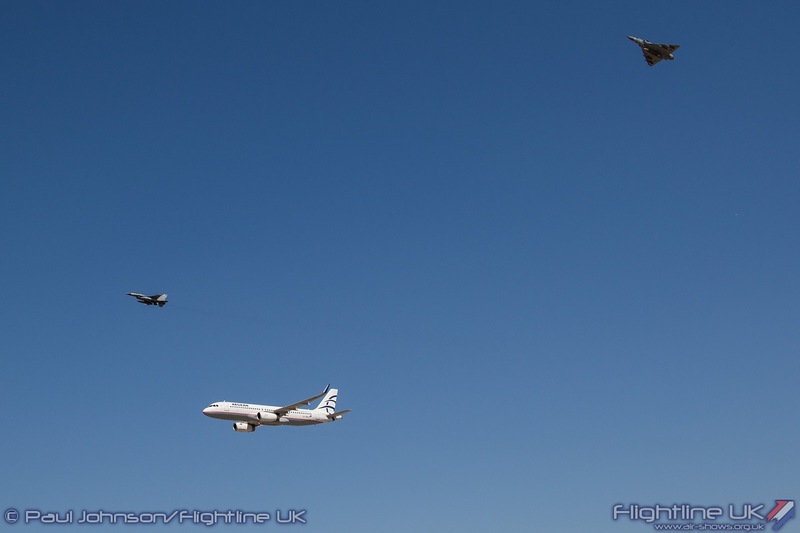 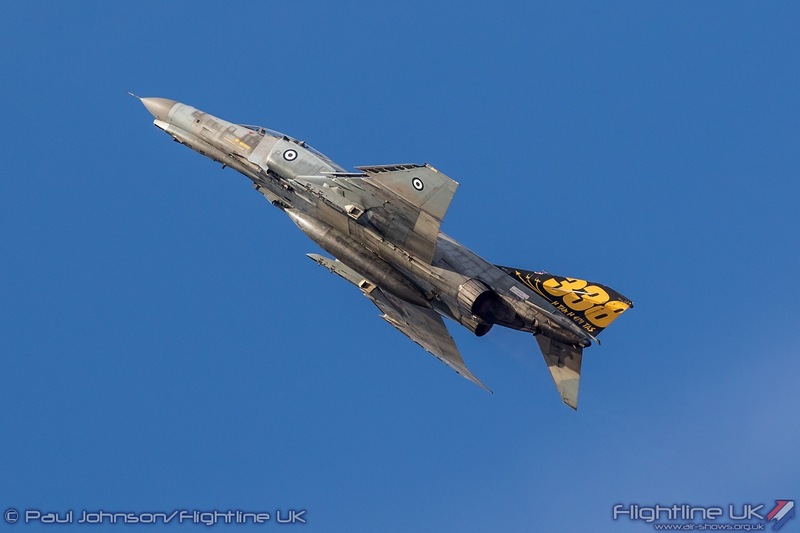 The Hellenic aircraft were joined by some very interesting international military visitors. 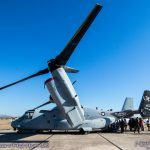 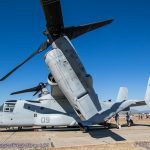 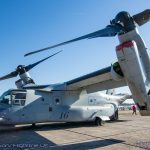 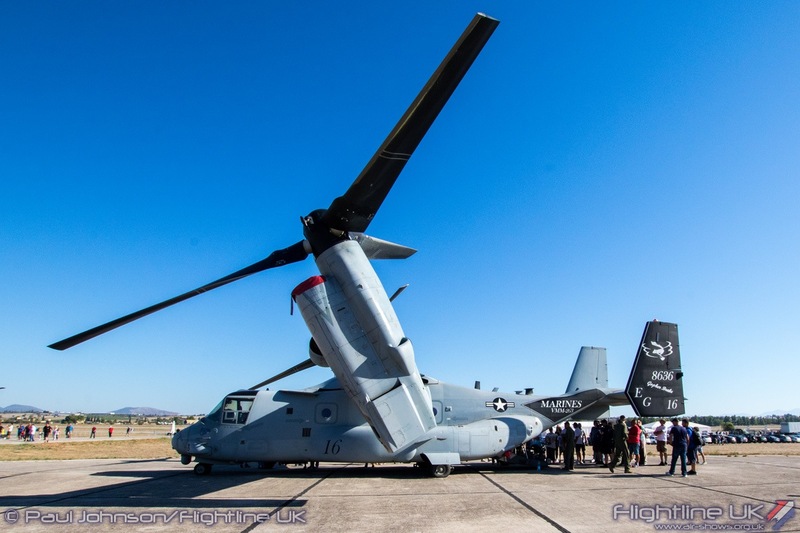 The highlight for the crowd were two Bell/Boeing MV-22B Osprey from VMM-263 “Thunder Chickens” of the United States Marine Corps. 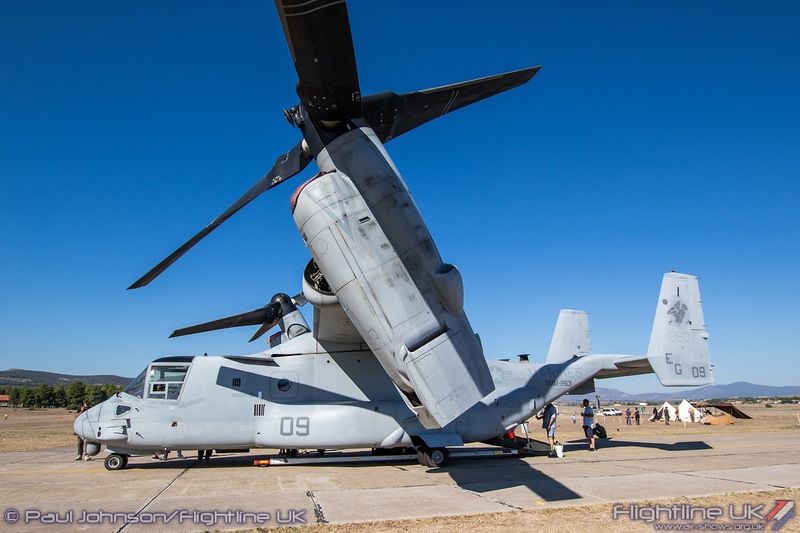 The unit is usually based at MCAS New River, North Carolina and was the first operation squadron on the MV-22. 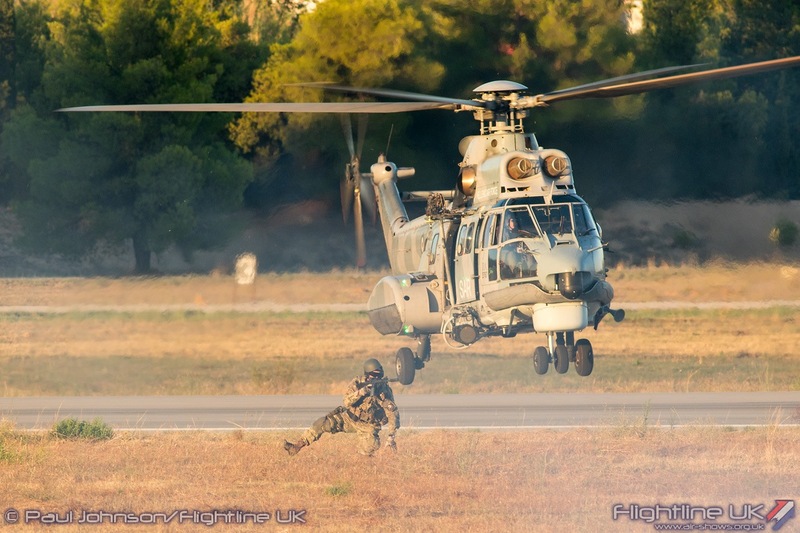 They are currently on deployment to the Mediterranean and Southern Europe operating from Moron in Spain. 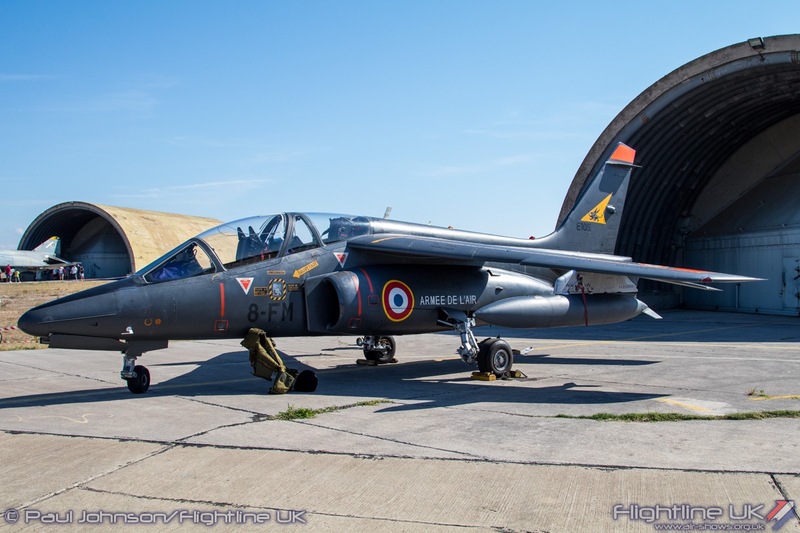 Both the Italian and French Air Forces were also present showing off two different generations of jet trainers. 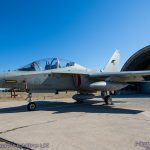 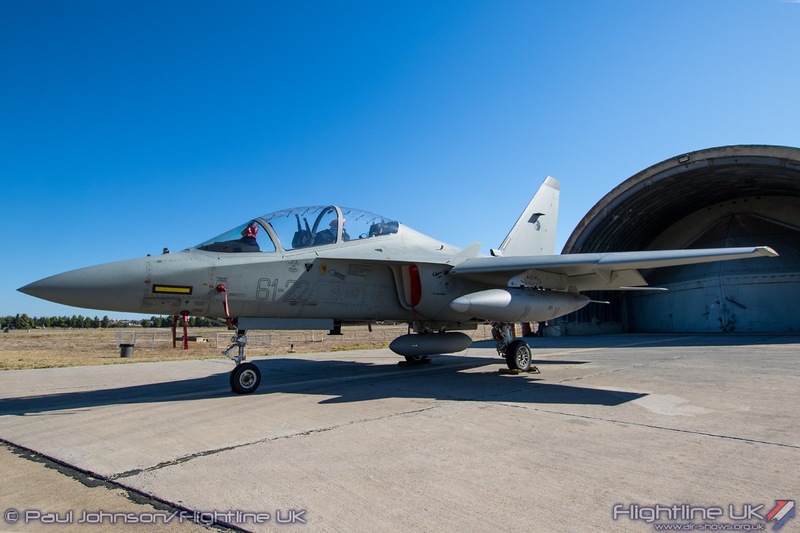 The Italian Air Force’s 61º Stormo based at Galatina exhibited a Leonardo T-346 Master which is part of a new generation of training aircraft designed to prepare student pilots for the glass cockpits of the Eurofighter Typhoon and F-35 Lightning II. 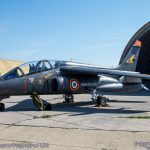 The French Air Force brought an older Dassault Alpha Jet E from EE 3/8 Côte d’Or based at Cazaux. 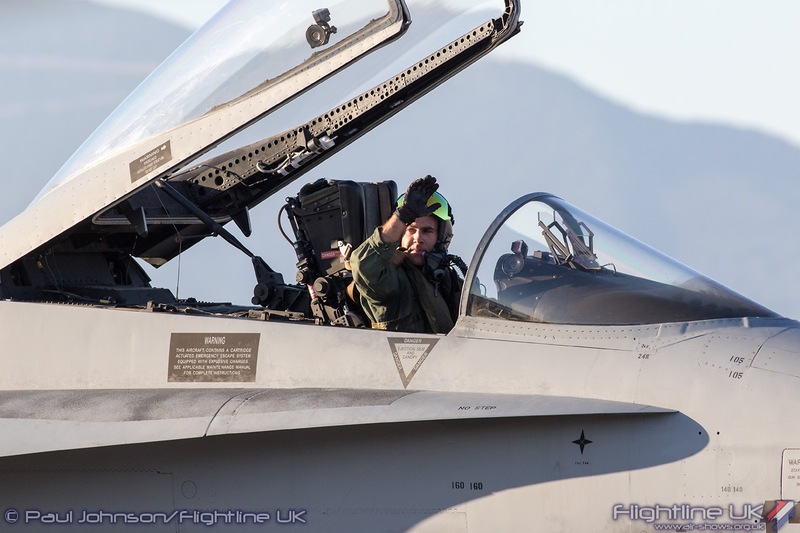 The unit provides combat training and is part of the 8th Fighter Wing. 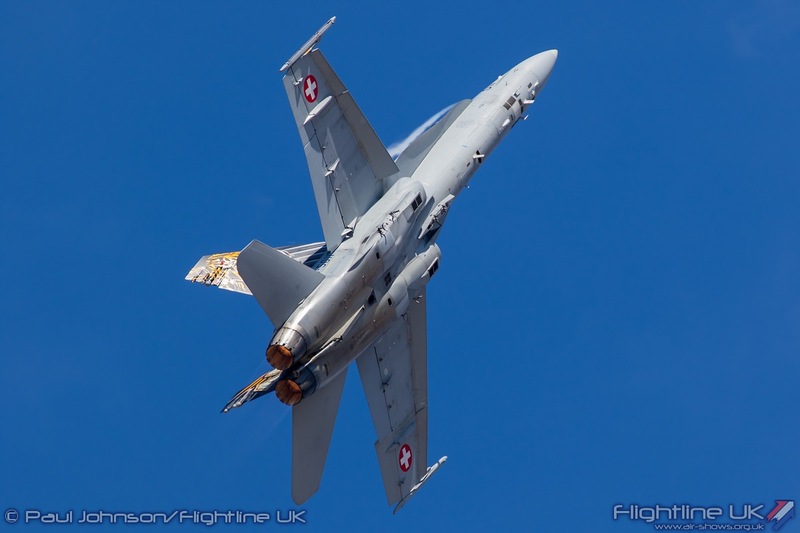 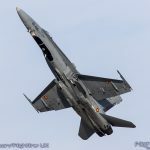 Adding to the international line-up were some of the flying display support and spare aircraft which included a Polish Air Force Airbus DS CN295M and a Spanish Air Force McDonnell Douglas (C.15) EF-18M Hornet. 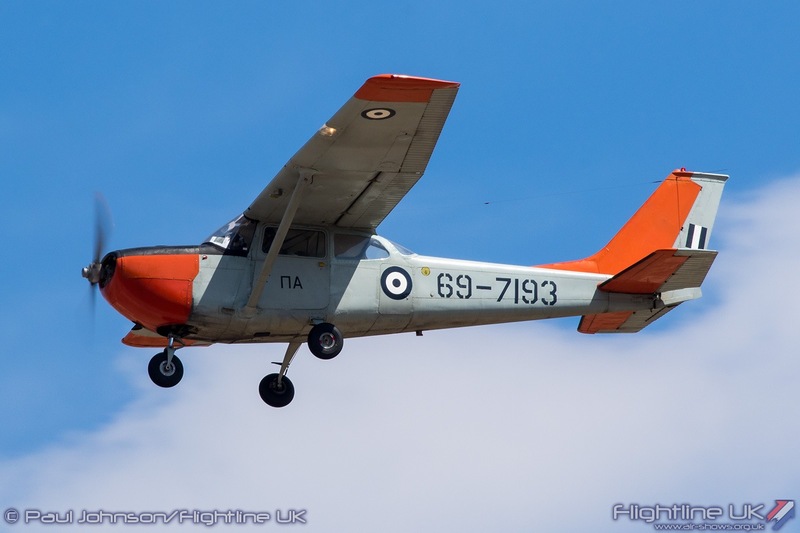 A small selection of civilian aircraft was also on show in the showground from local aero clubs and companies supporting general and commercial aviation. 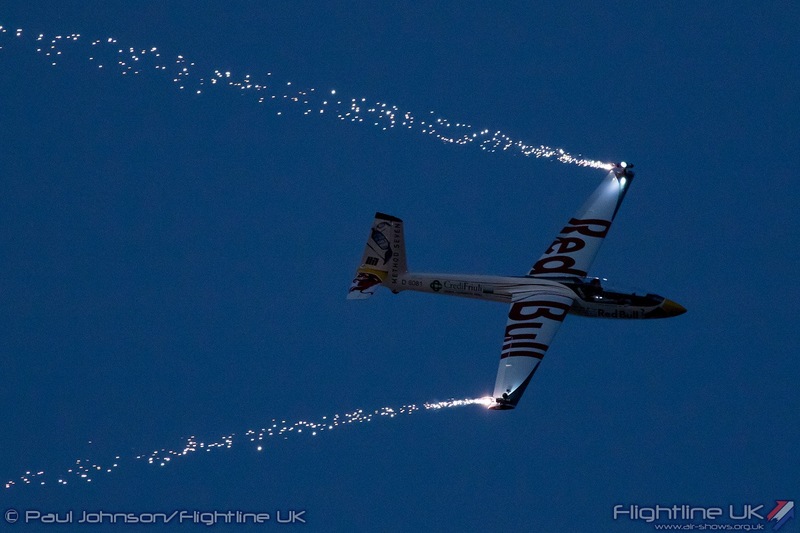 The flying displays last for over eight hours starting just before mid-day on both days and closing just before 8pm. 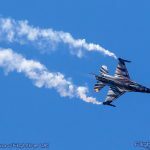 Unlike big military shows however, the displays were far more relaxed with some quite periods between displays allowing for plenty of time to get refreshments or take a few minutes shelter from the heat. 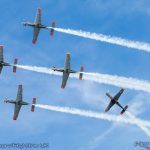 The flying this year did not feature historic aircraft, but was still incredibly varied showcasing a wide variety of aerial action. 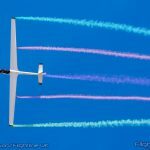 Taking equal billing in the displays to their full sized counterparts were radio-controlled model teams which showed off aerobatic displays and a very fast jet model. 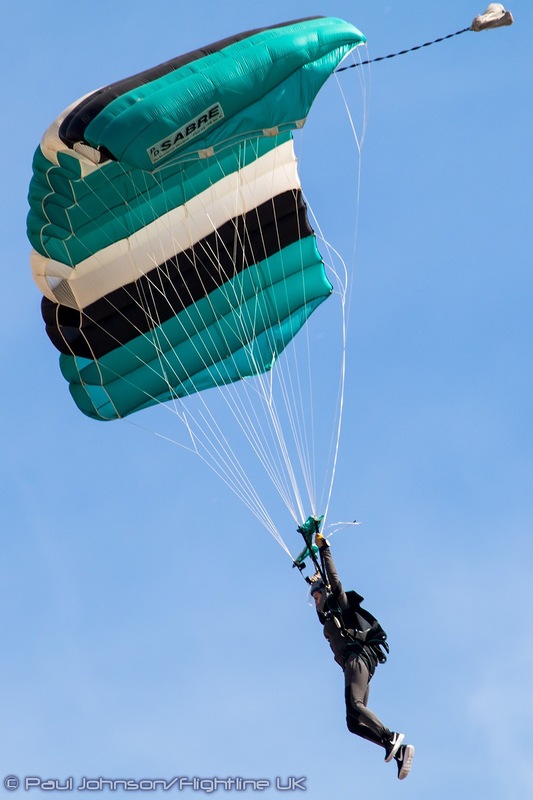 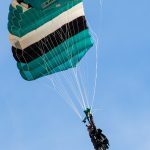 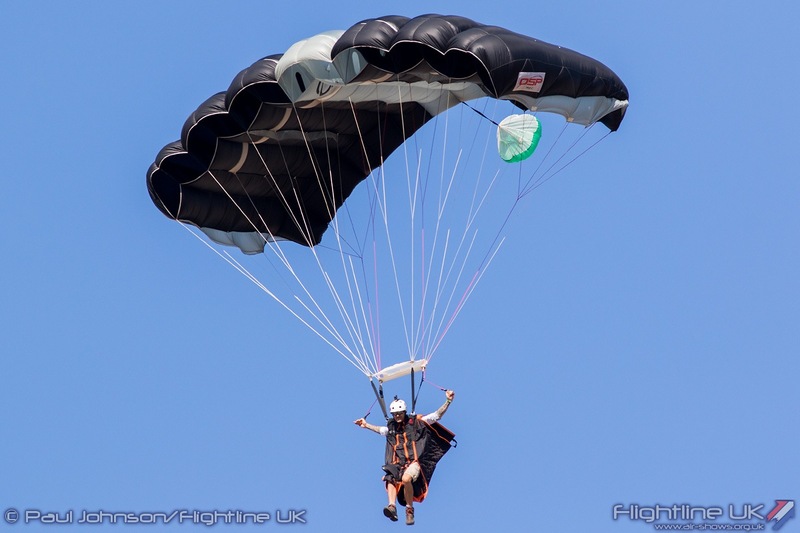 Skydiving and parachute displays also featured well in the flying with three different civilian teams appearing over the weekend. 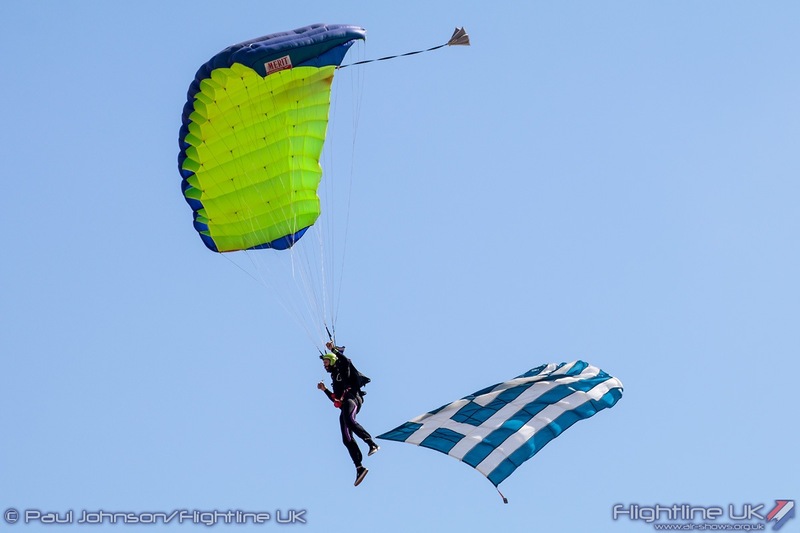 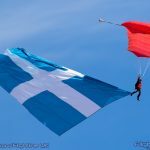 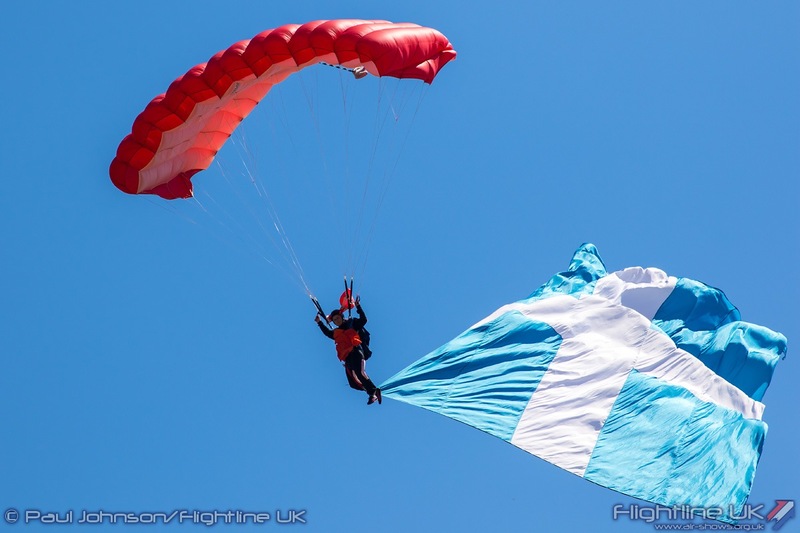 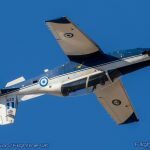 The weekend flying displays were opened by the Hellenic Skydivers who dropped in from a Cessna C182 trailing Hellenic Flags. 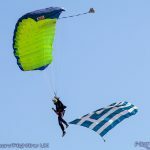 A formation wingsuit demonstration came from Skydive Attica while Skydive Athens demonstrated some high speed parachute canopies. 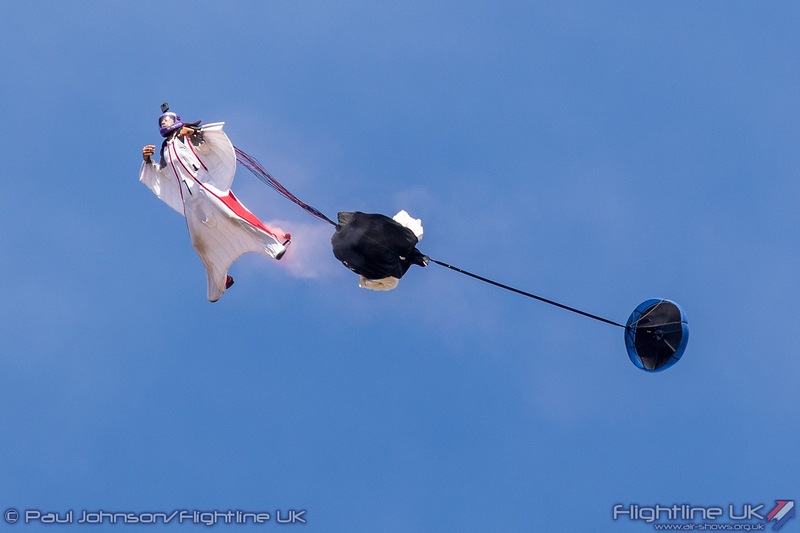 An unusual participant from the home nation was “Wizard Helobatics”. 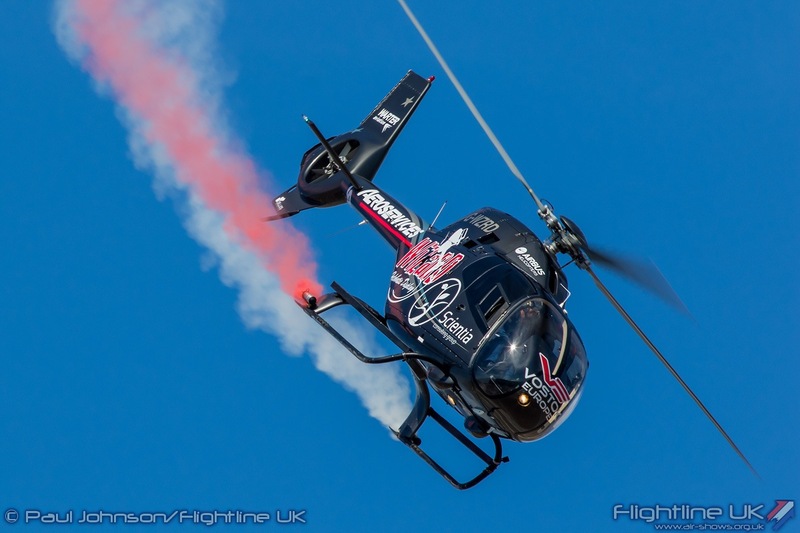 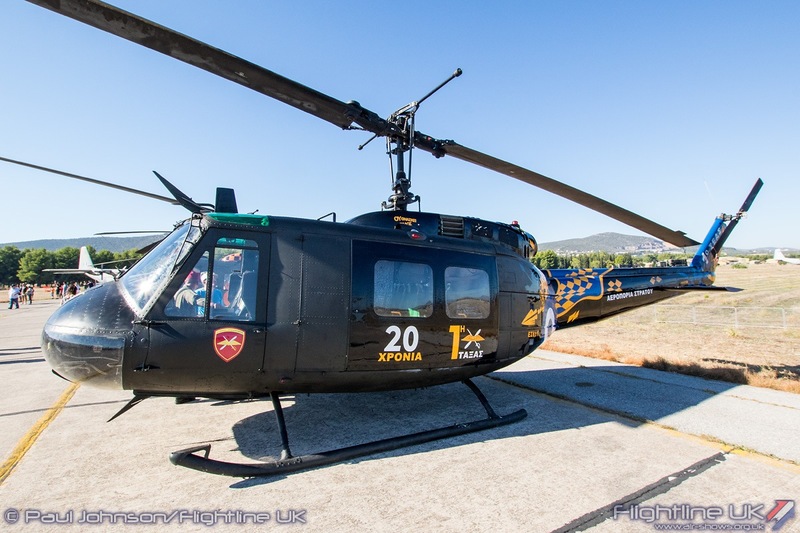 This was a civilian and very smart looking Eurocopter EC120B Colibri flown by Dimitris ‘Wizard’ Ververelis. 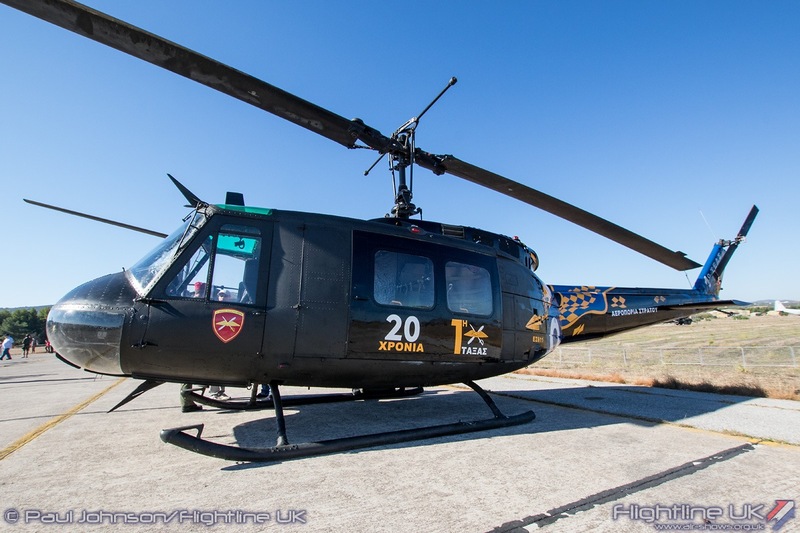 Dimitris is commercial helicopter pilot and instructor. 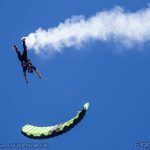 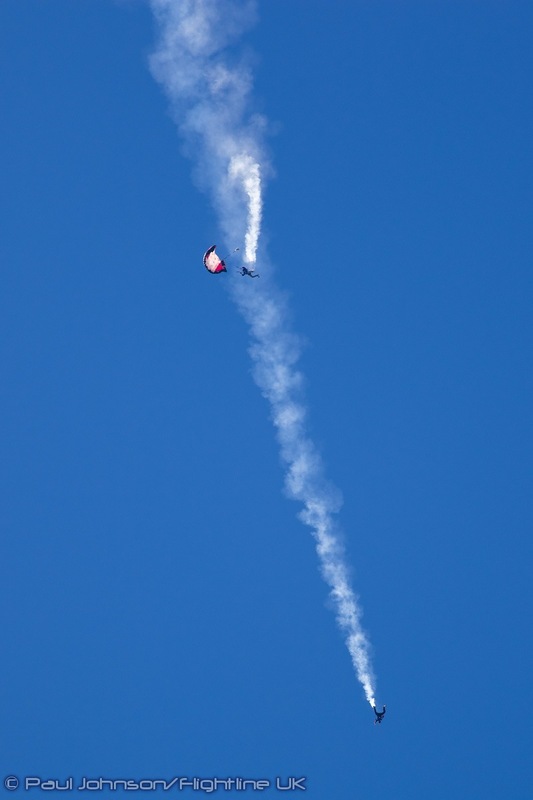 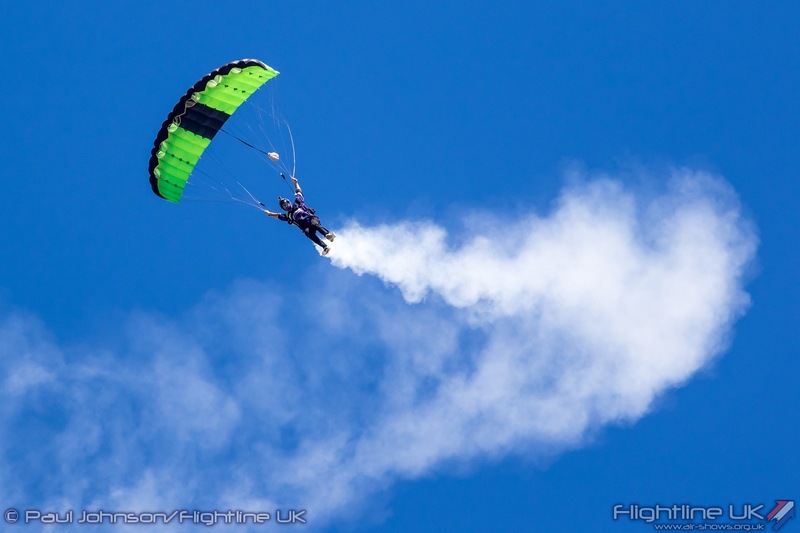 He has also flown and instructs on paragliders and paramotors It was a really impressive display too showing off some oblique loops and really tight turns with smoke streaming from the landing skids of the helicopters. 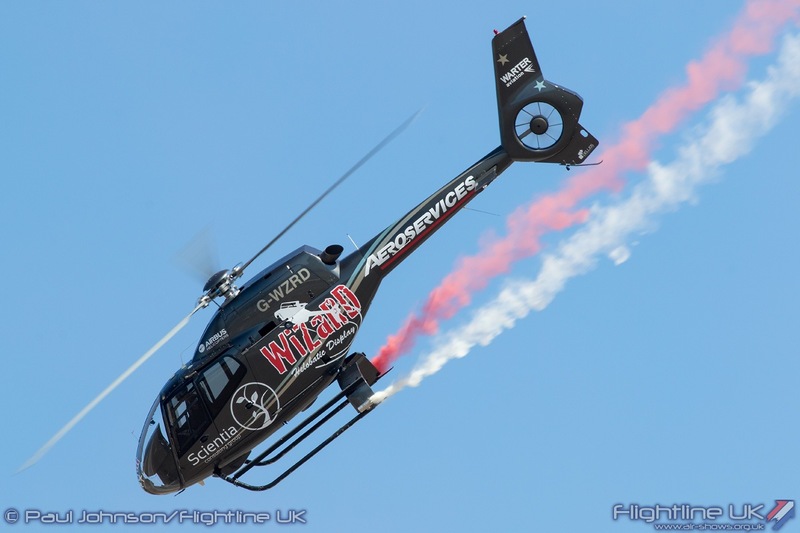 Joining the Wizard were further civilian acts from Germany, Italy, the Netherlands and Sweden. 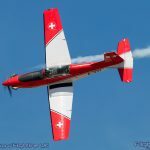 Some elegant aerobatics came from a Christian Eagle II flown by Dr. Martin Graef and a Mudry CAP21DS known as the “Silver Chicken” piloted by Luca Salvadori. 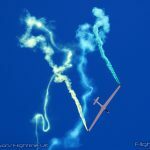 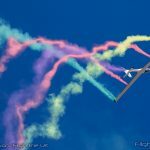 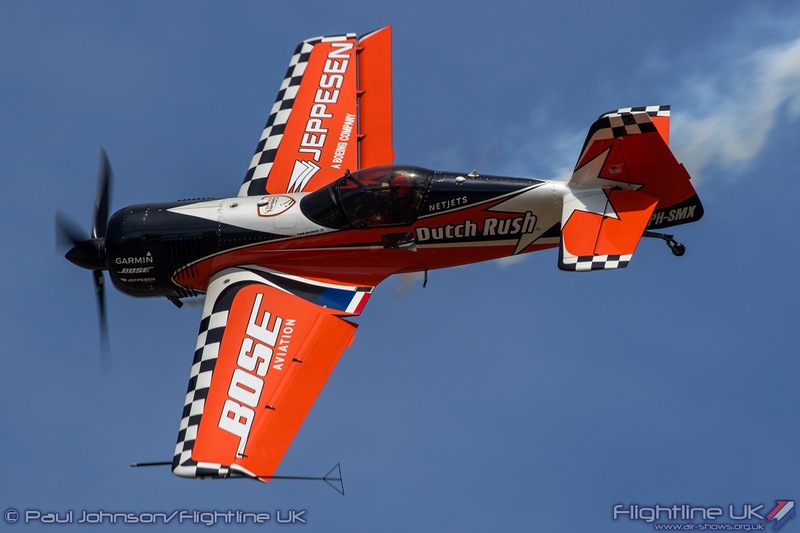 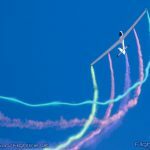 Unlimited aerobatics came from Dutch Rush pilot Frank Van Houten flying his colourful Sukhoi Su-26M. 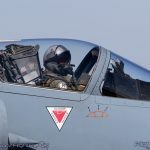 Frank learnt to fly on gliders at the age of 12 and went on to fly the SH-14D Lynx and P-3C Orion with the Royal Netherlands Navy. 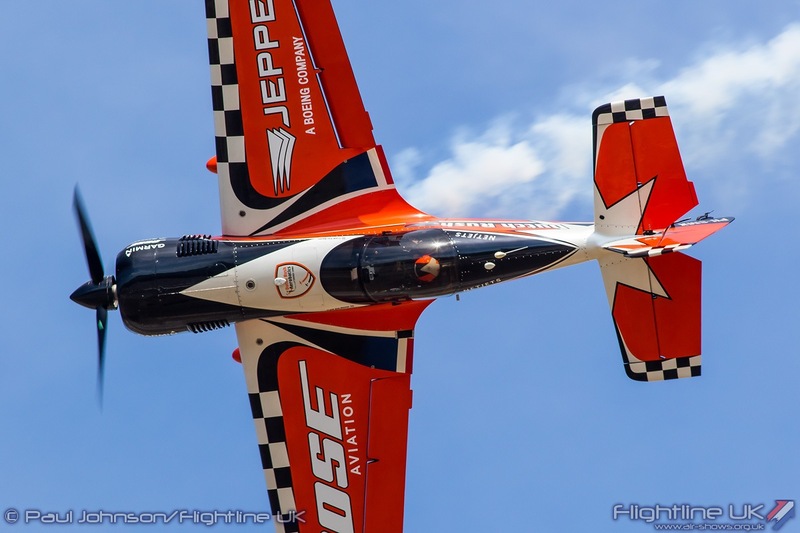 In civilian life he now flies corporate jets as well sharing his passion for aerobatics. 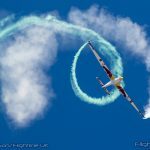 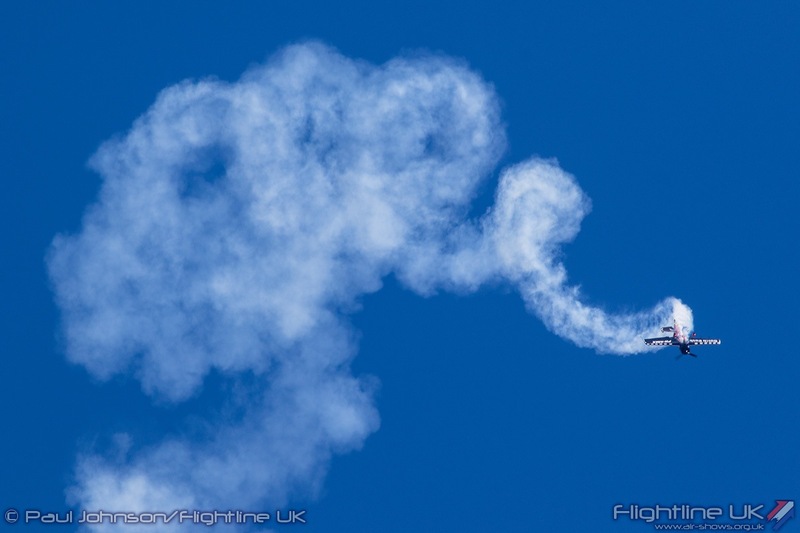 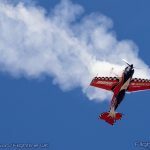 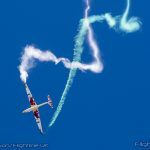 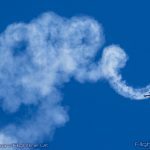 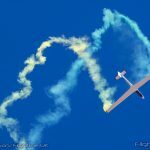 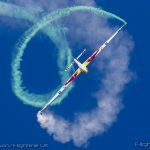 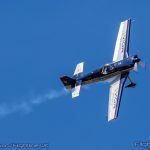 The Su-26 has become an increasingly rare airshow performer these days which is a great shame as it has a big presence in the sky thanks to its radial engine and is still a highly capable aerobatic performer as Frank really demonstrated in the blue Greek skies. 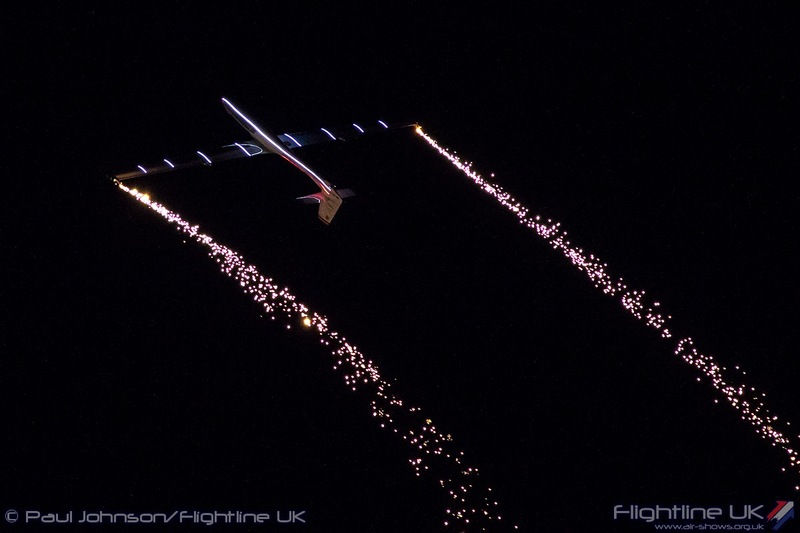 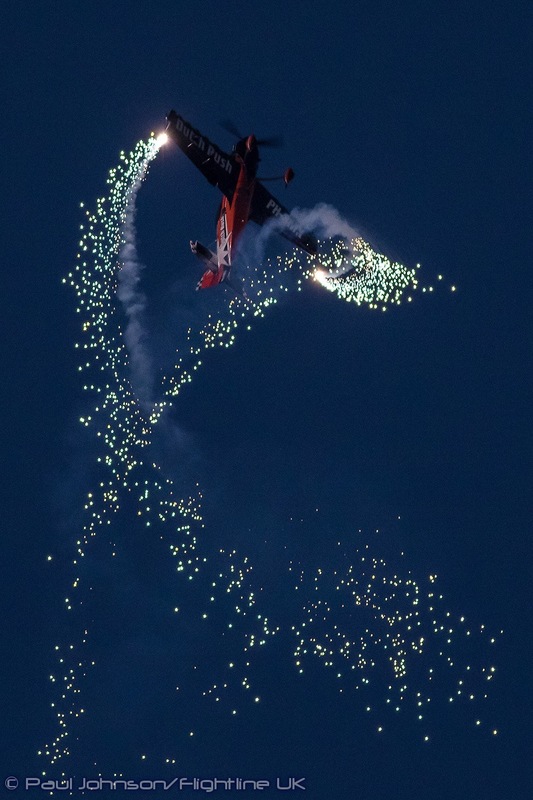 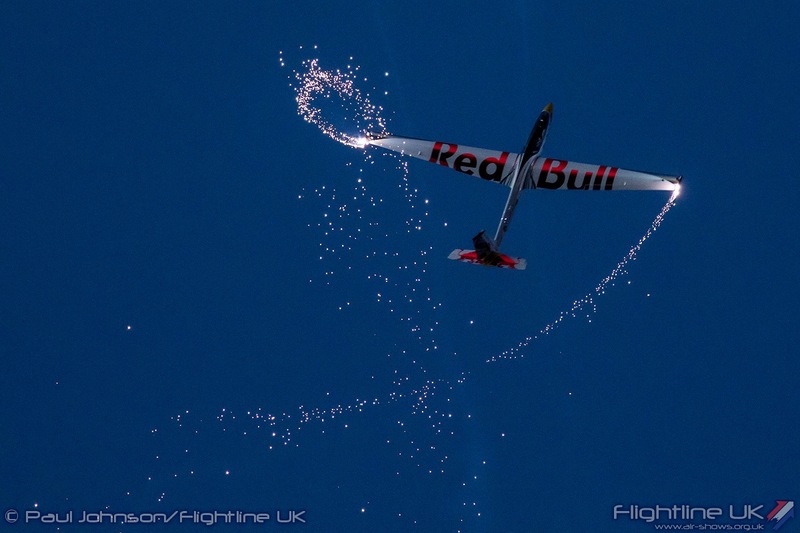 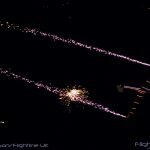 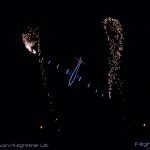 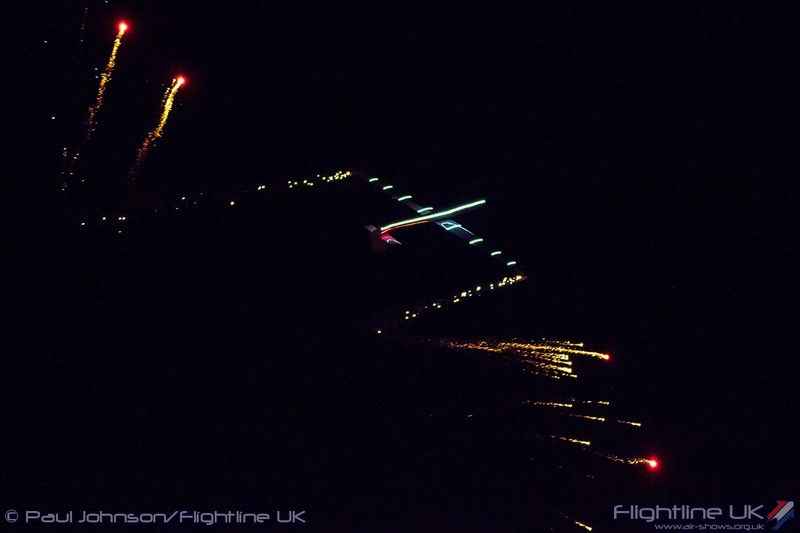 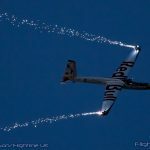 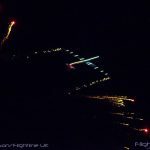 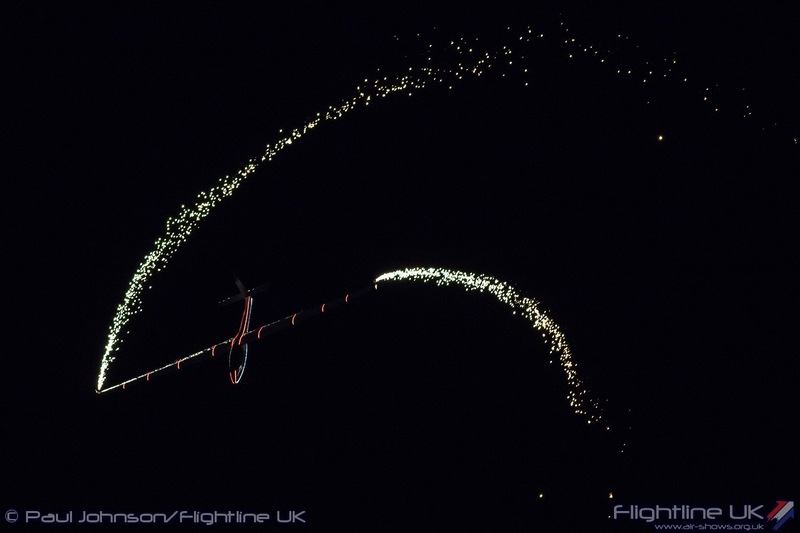 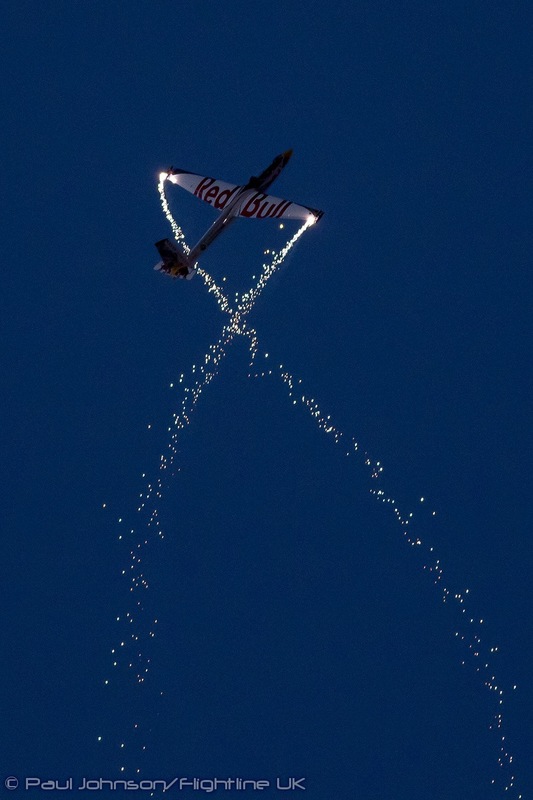 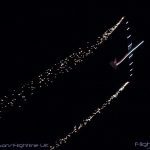 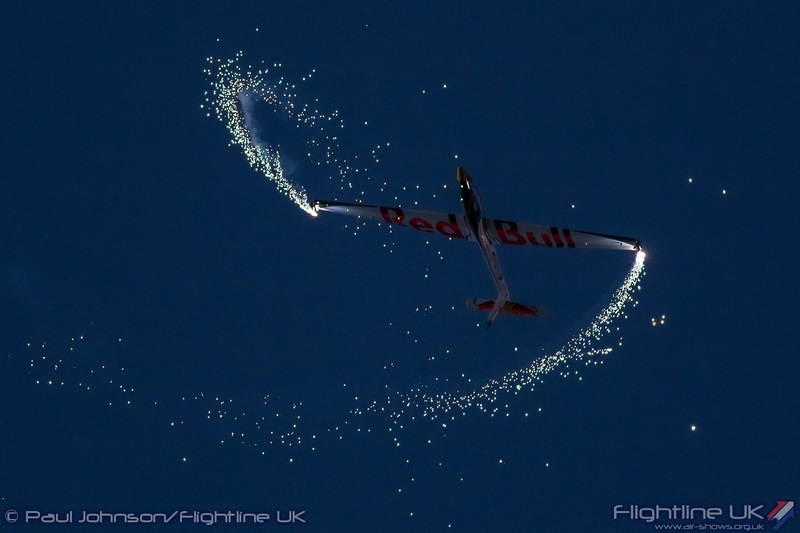 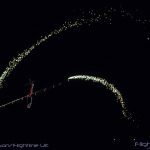 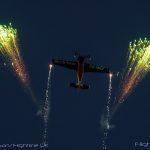 Frank also flew during both night shows with fireworks fitted to his wingtips creating some beautiful spiral effects in the sky and he performed multiple vertical rolls. 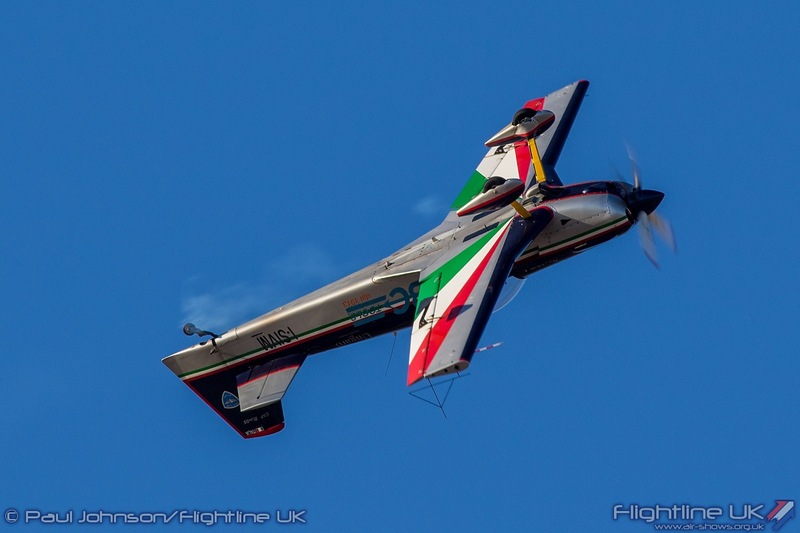 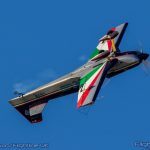 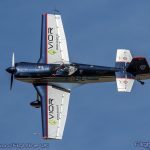 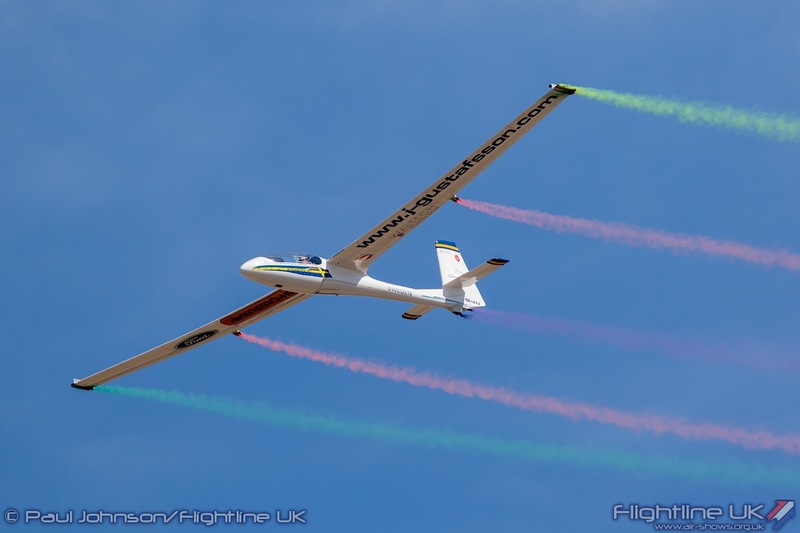 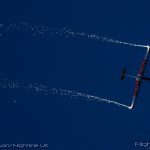 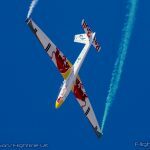 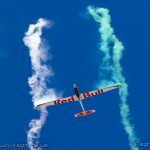 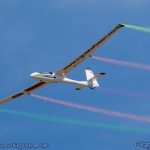 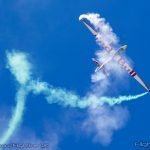 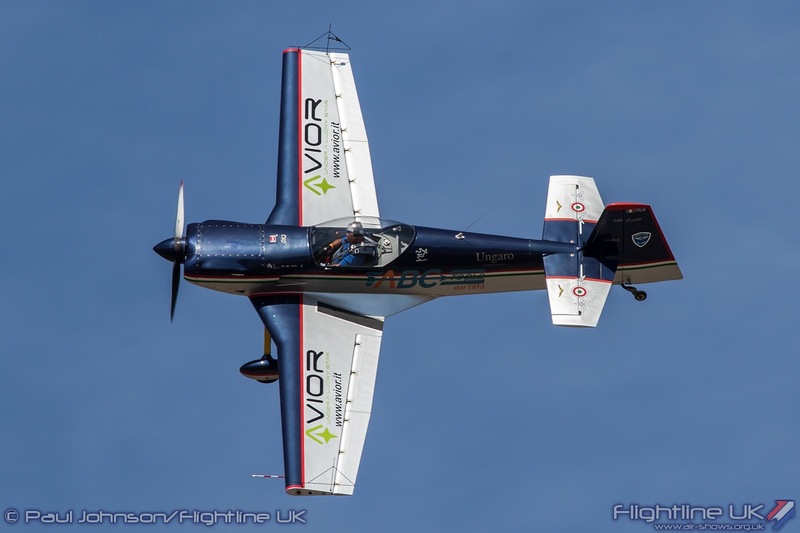 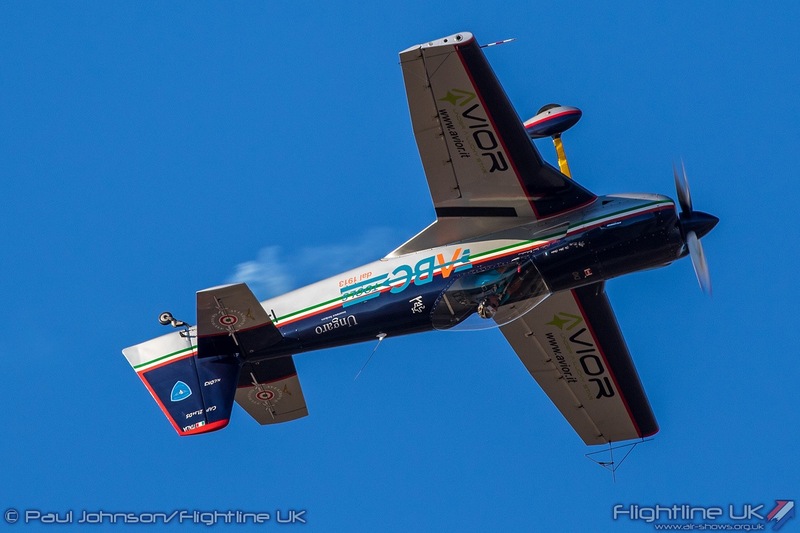 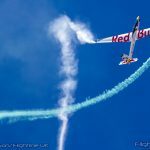 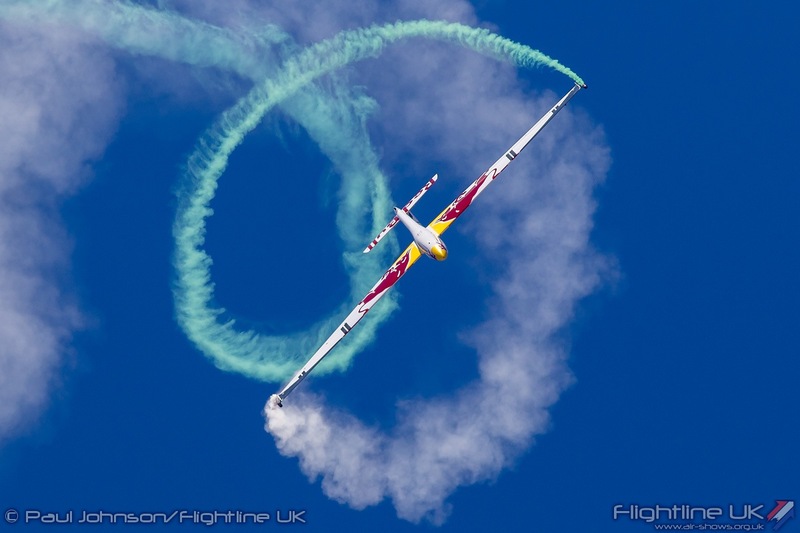 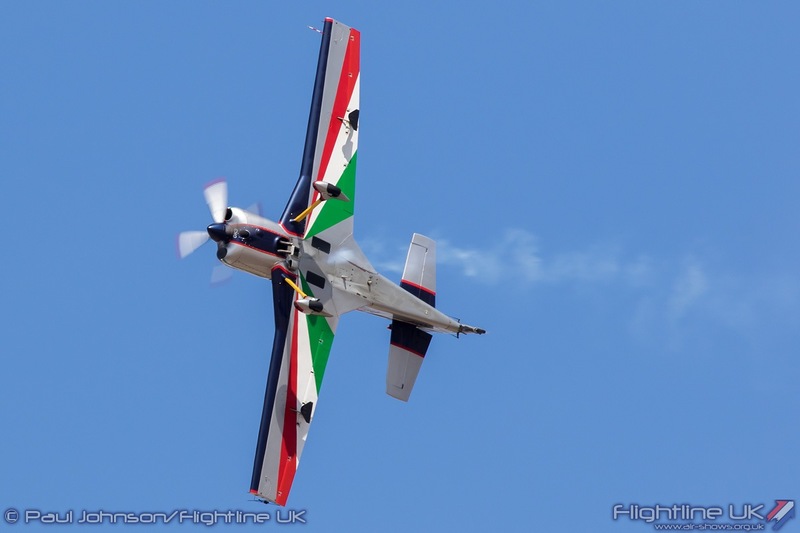 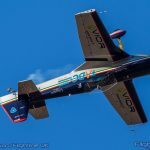 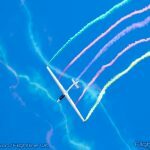 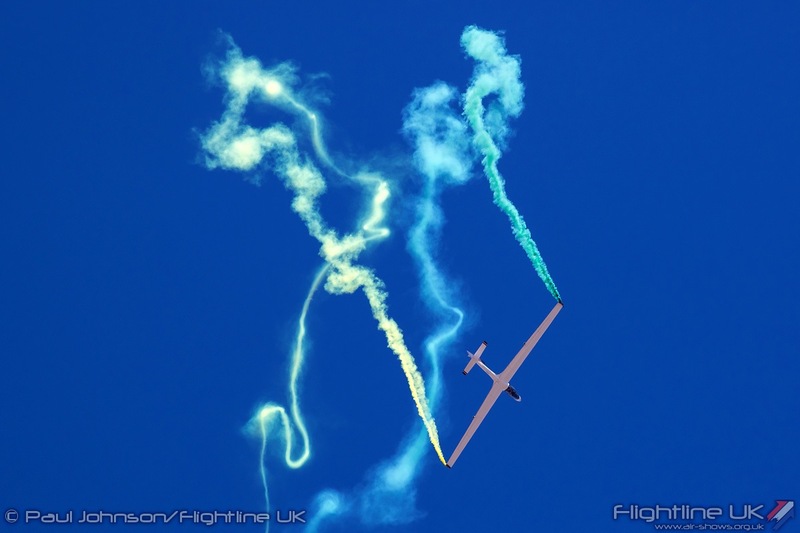 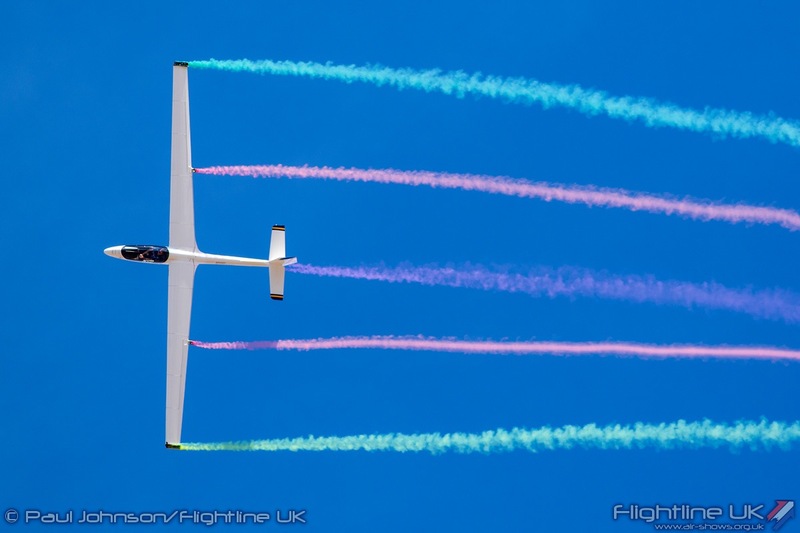 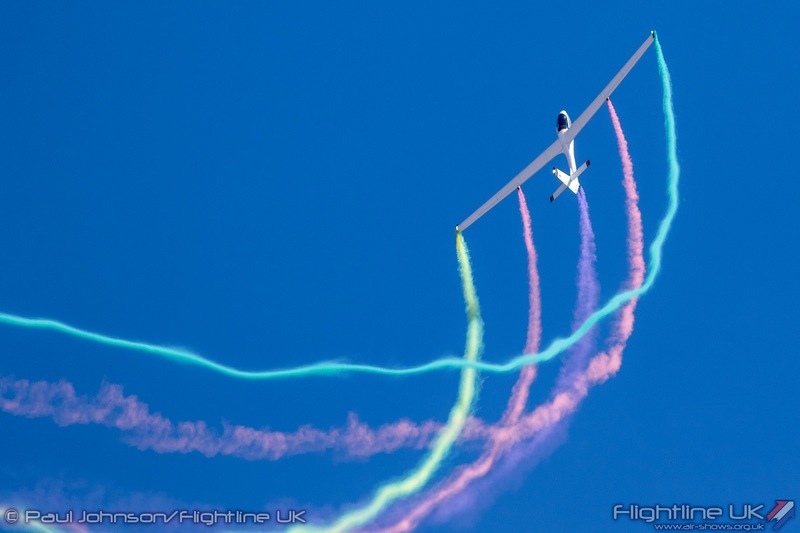 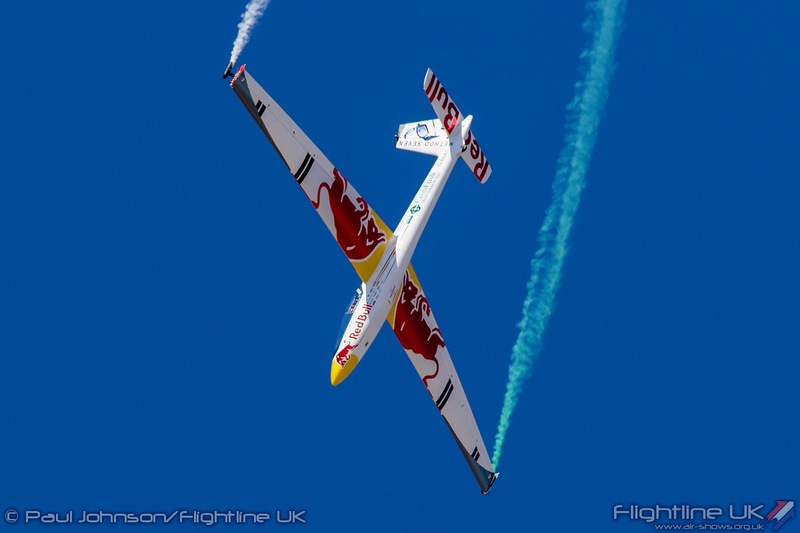 The Italian and Swedish displays were both demonstrations of unlimited glider aerobatics with Luca Bertossio flying the Red Bull X-Glider (a Marganski S-1 Swift) and Johan Gustaffson flying his own PZL SDZ-59 Acro. 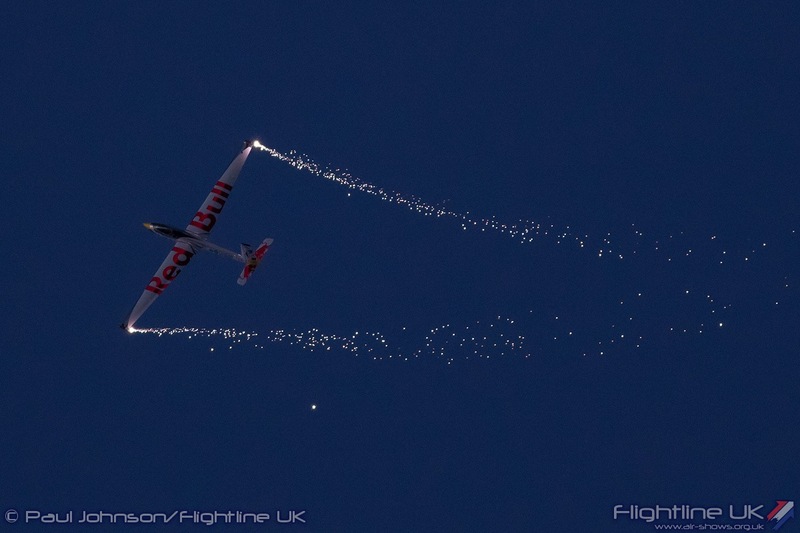 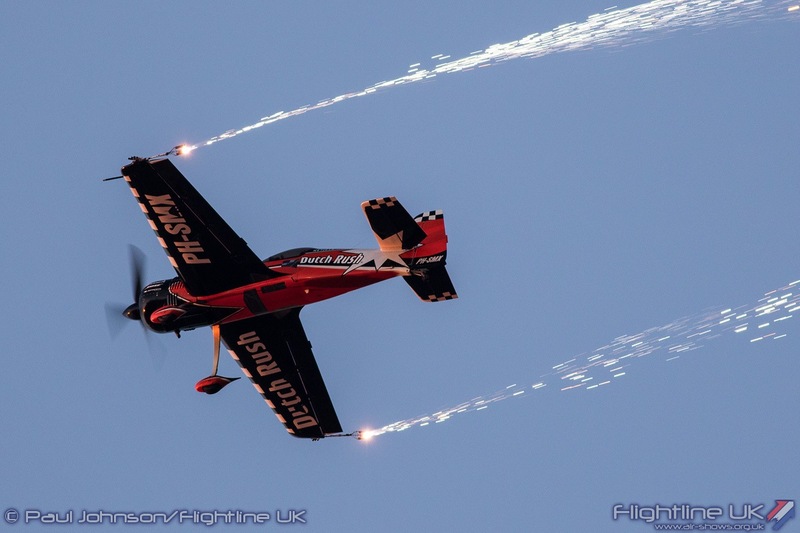 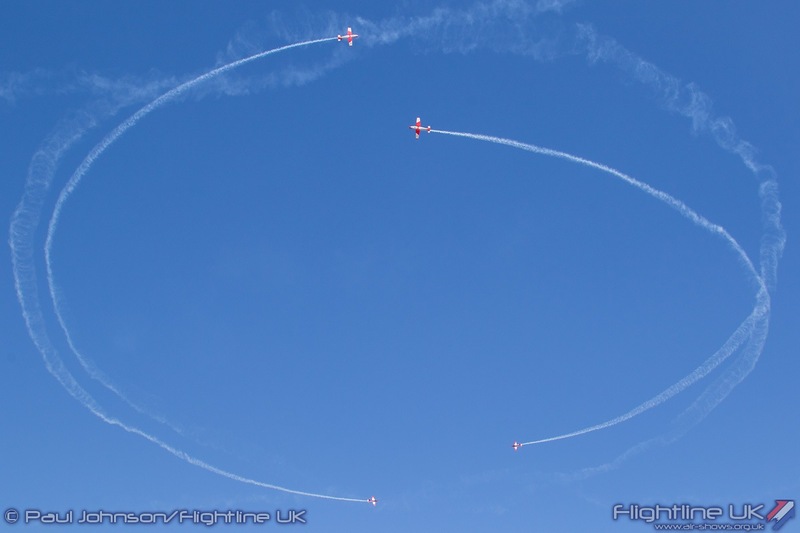 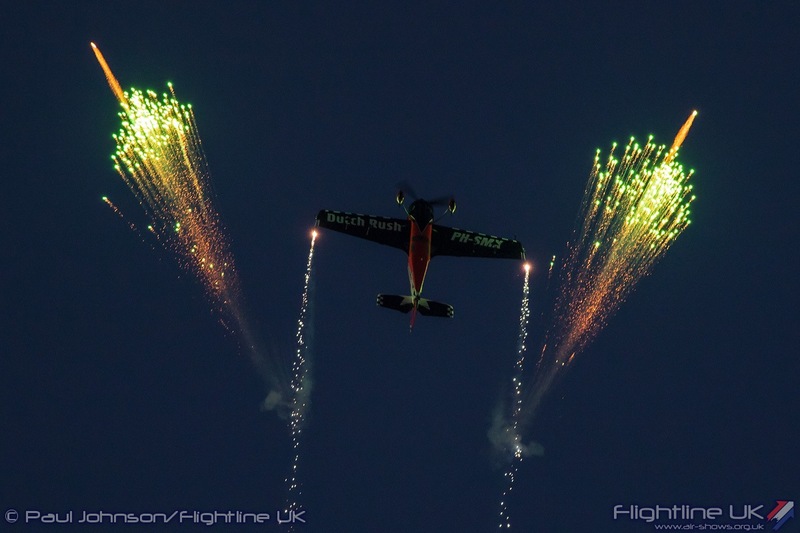 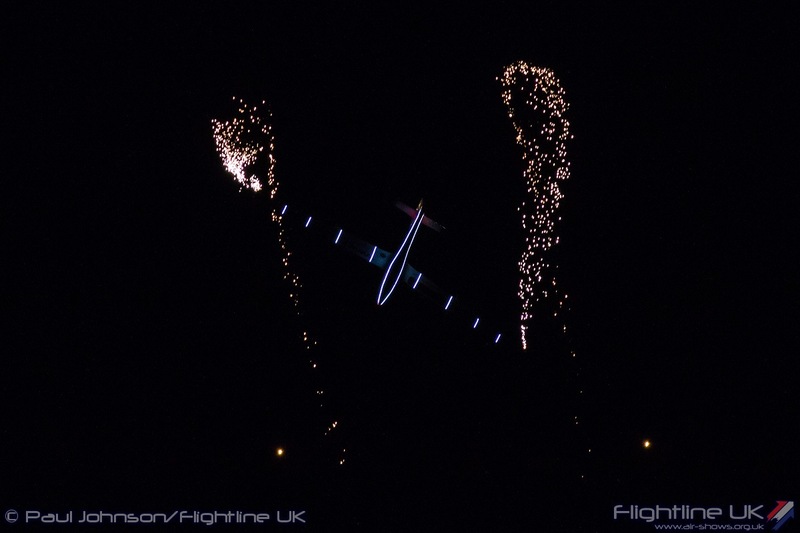 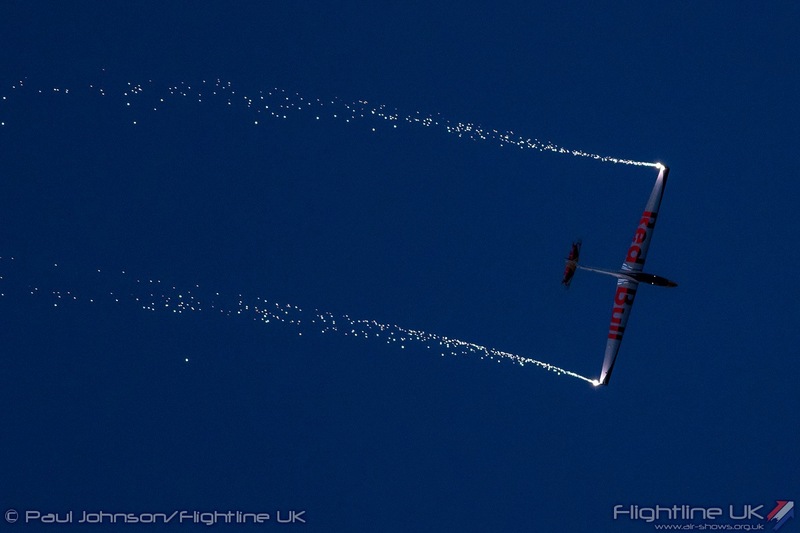 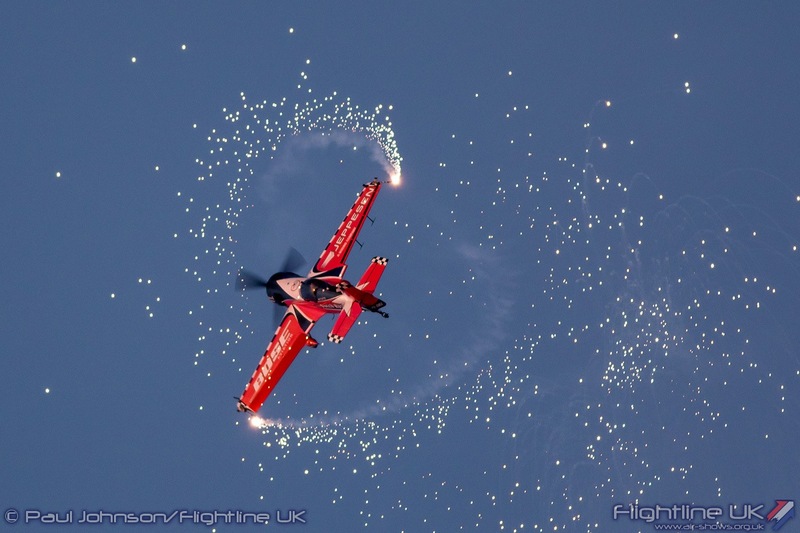 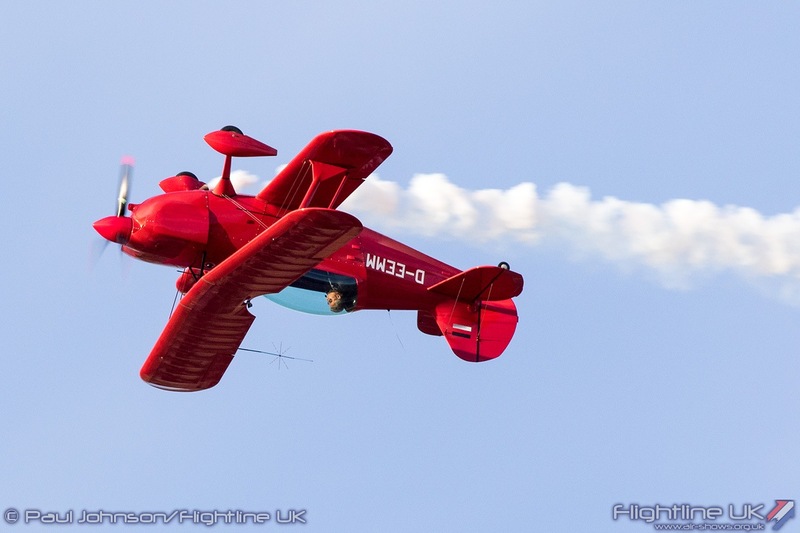 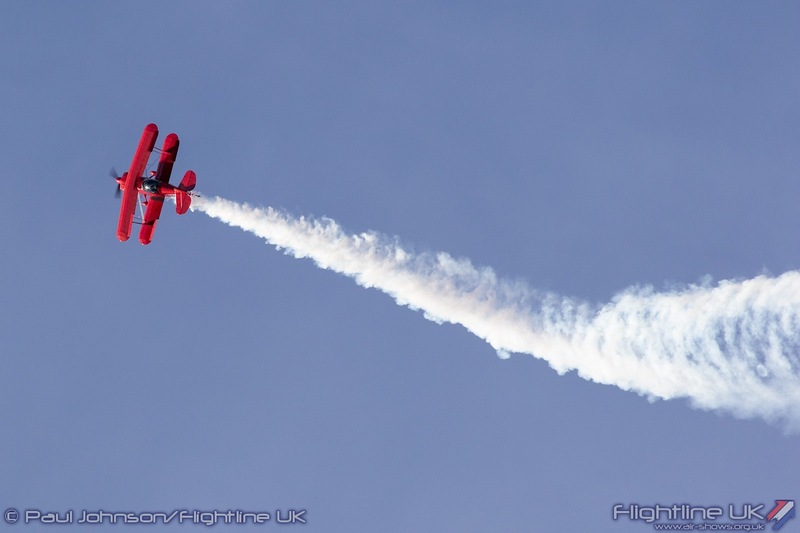 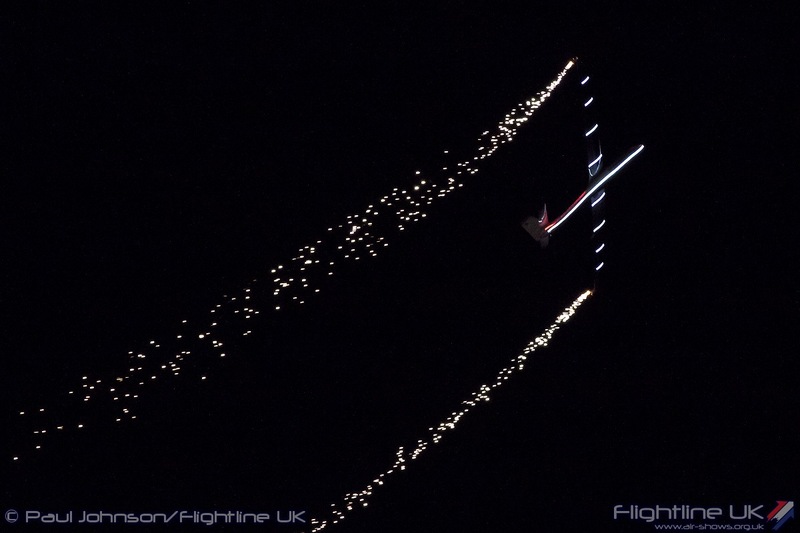 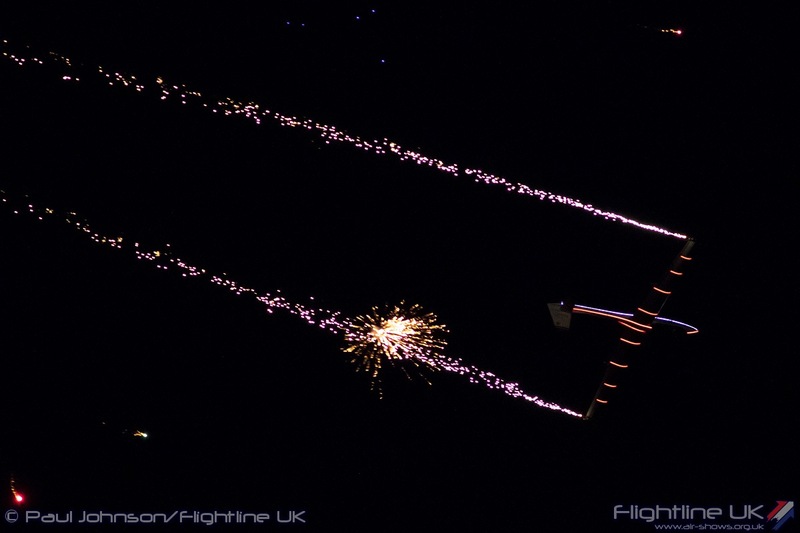 The two pilots are both aerobatic champions and shared the honours of flying day and night shows over the weekend. 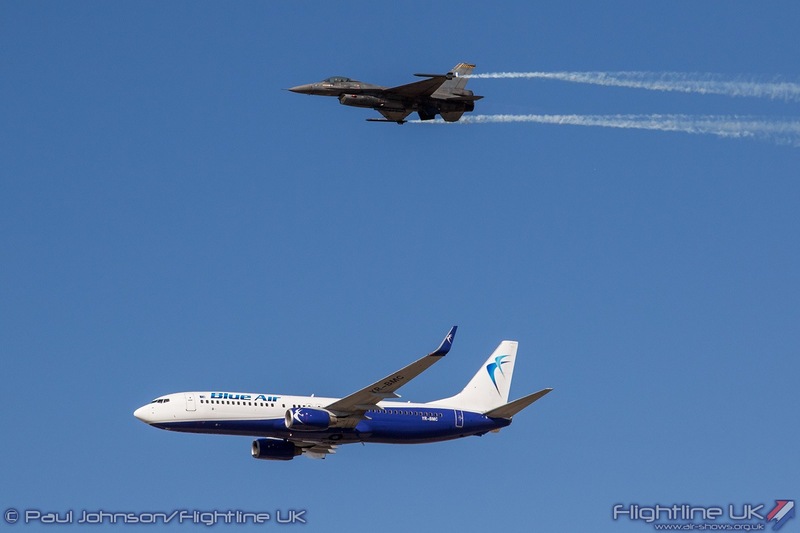 Both were very popular with the crowd too landing on the parallel taxiway right on the crowd line and greeting the crowd as they came to a halt. 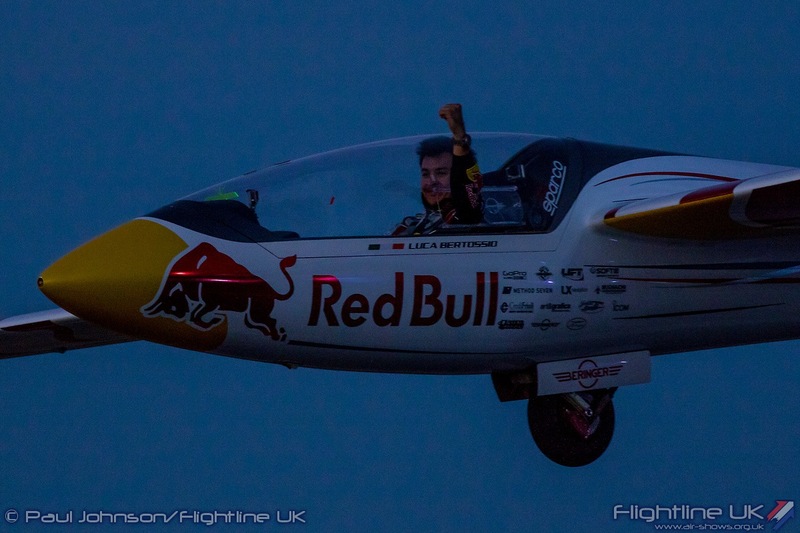 Luca’s landing on the Sunday was particularly flamboyant as he opened the canopy and stood up saluting the crowd before his Swift had even come to a halt! 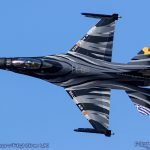 Athens Flying Week also enjoyed good support from international military displays. 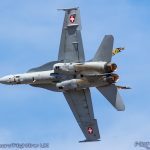 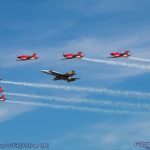 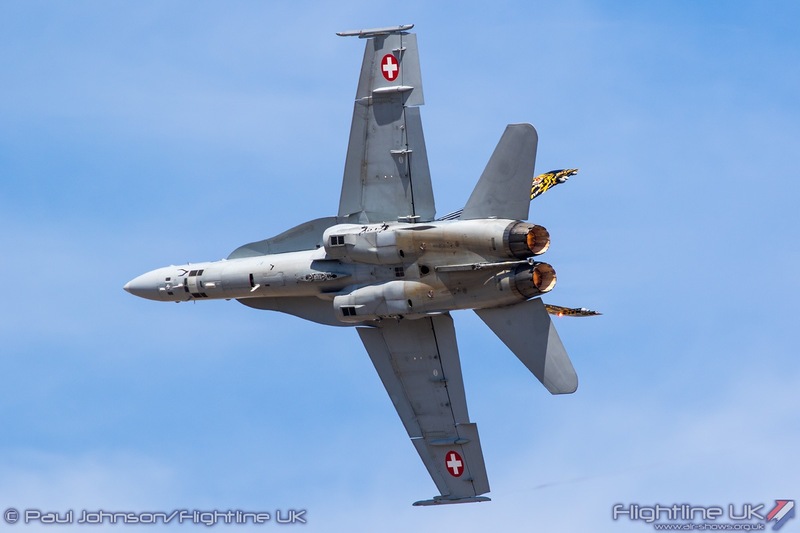 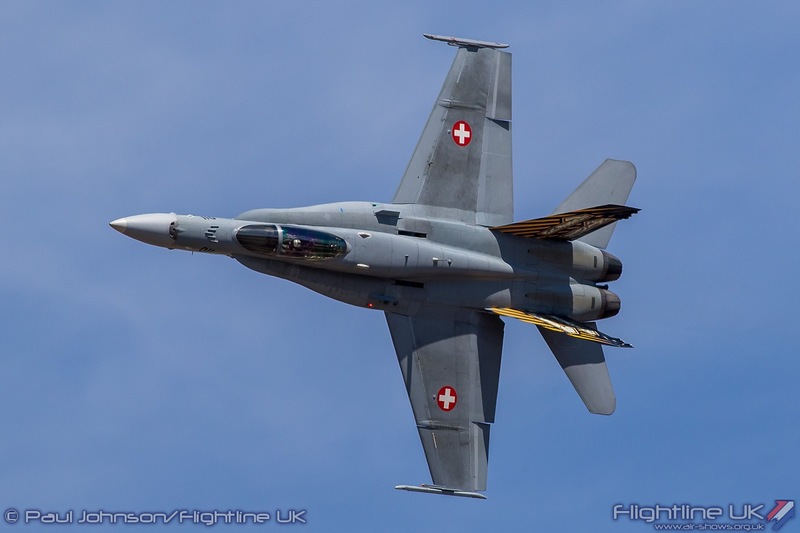 The Swiss Air Force made an impressive contribution to the show with both the PC-7 Team and the McDonnell Douglas F/A-18C Hornet solo display appearing in the flying display. 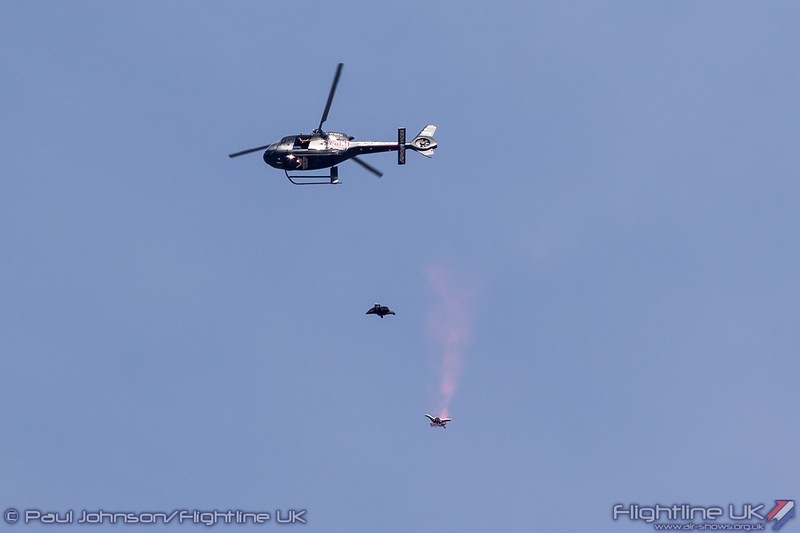 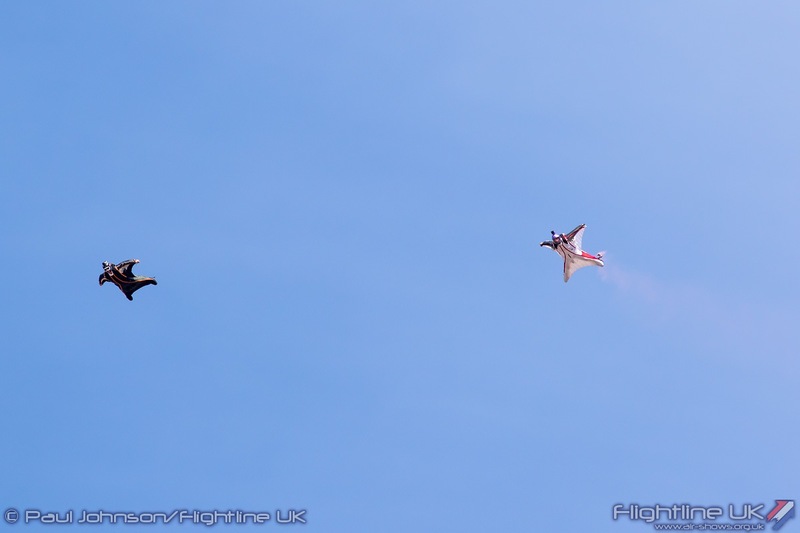 The two displayed were programmed together on both days and opened their sequences with a spectacular joint flypast. 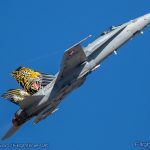 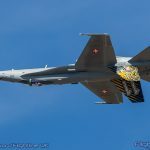 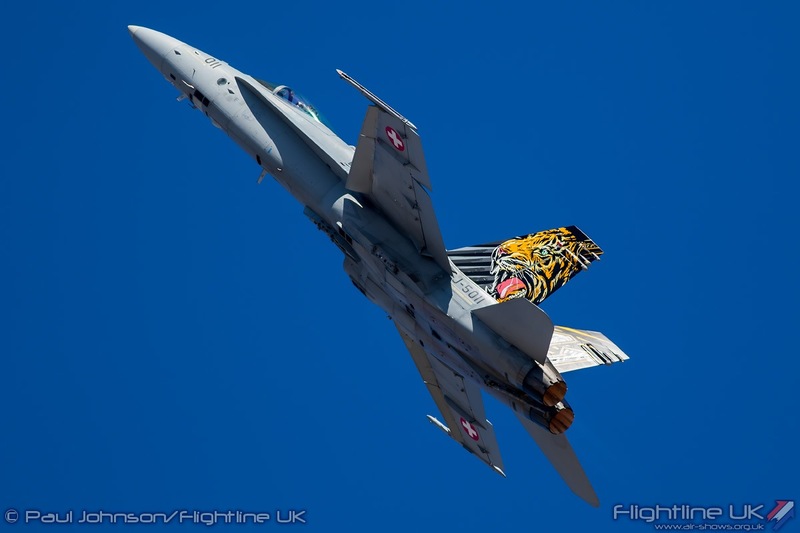 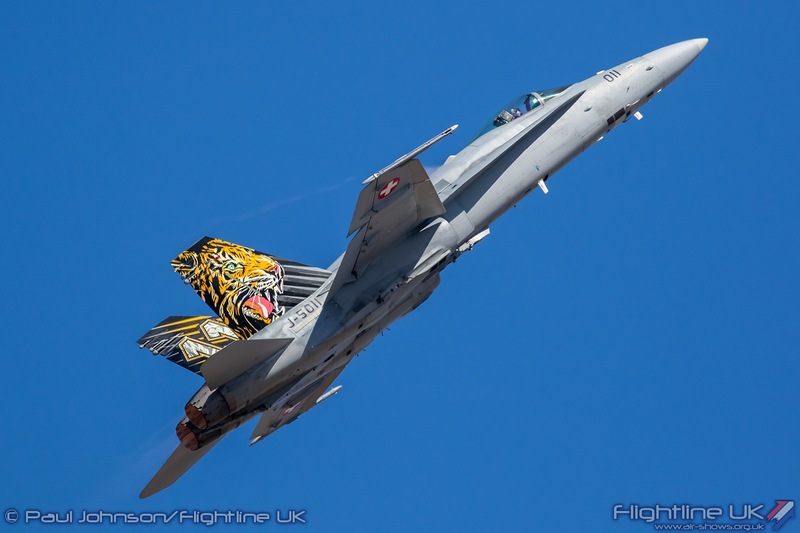 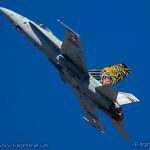 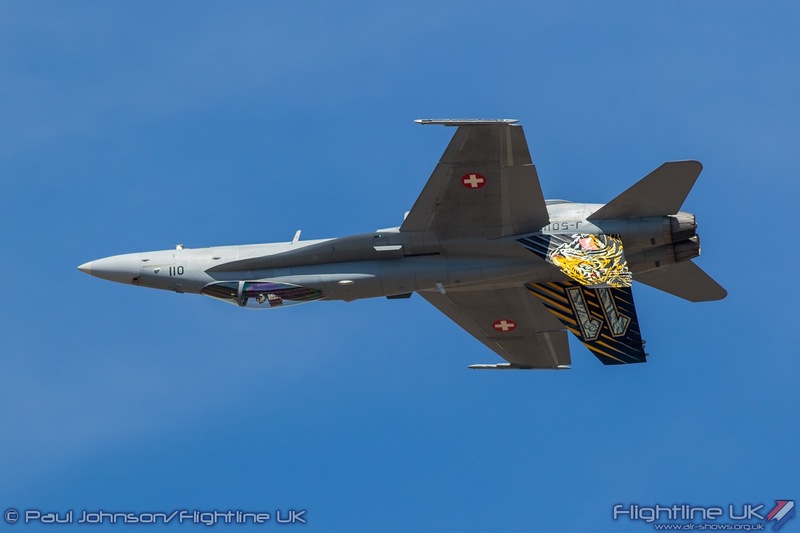 Unusually, the F/A-18C which displayed at Tanagra wore the Tiger markings of Fliegerstaffel 11 which added some colour to the routine of Captain Nicolas “Vincent” Rossier. 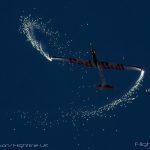 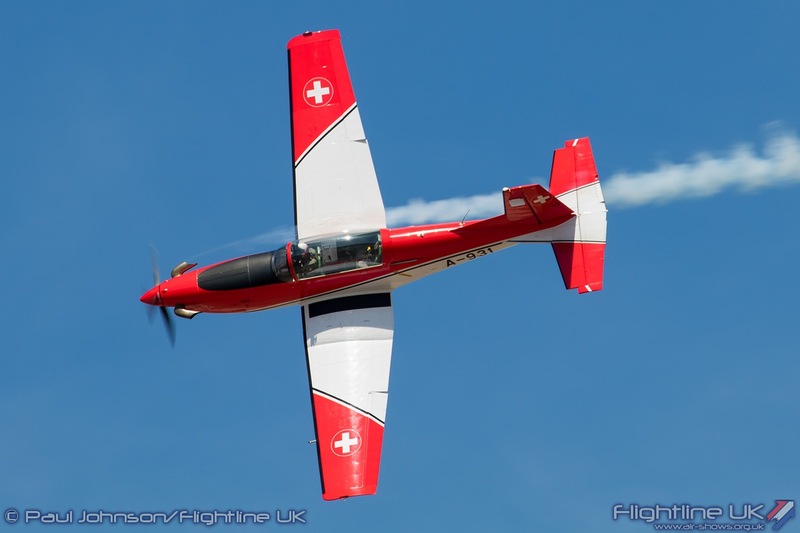 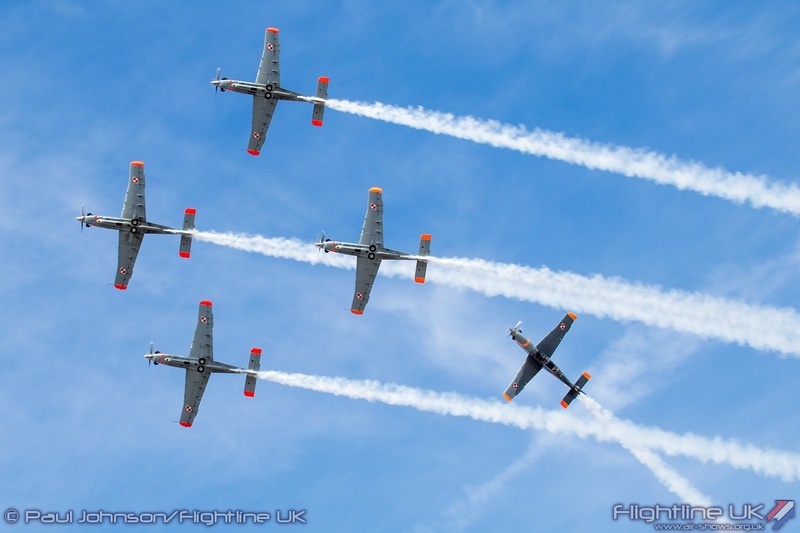 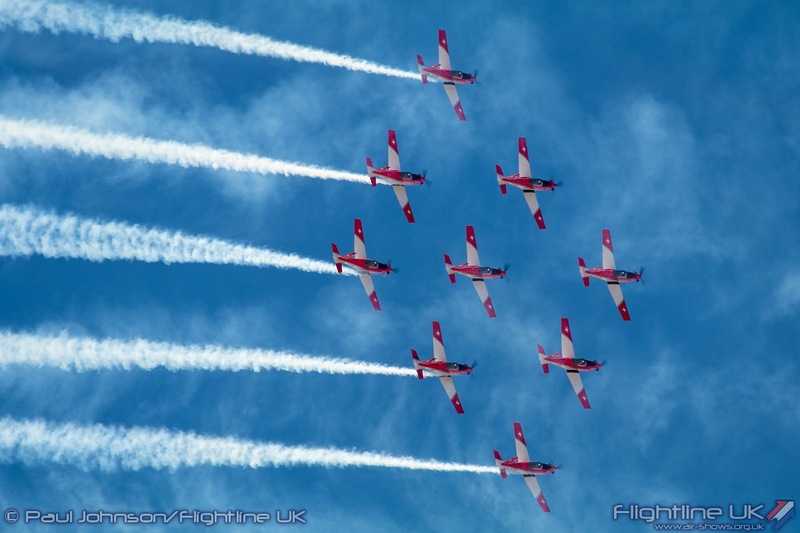 The PC-7 Team closed the Swiss segment of flying which their pretty and very precise display routine which includes some very original figures such as the waterfall and a dogfight sequence. 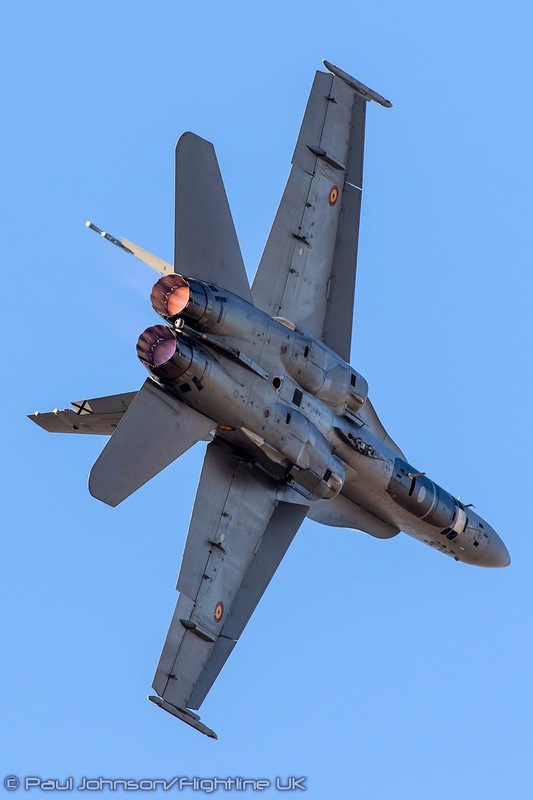 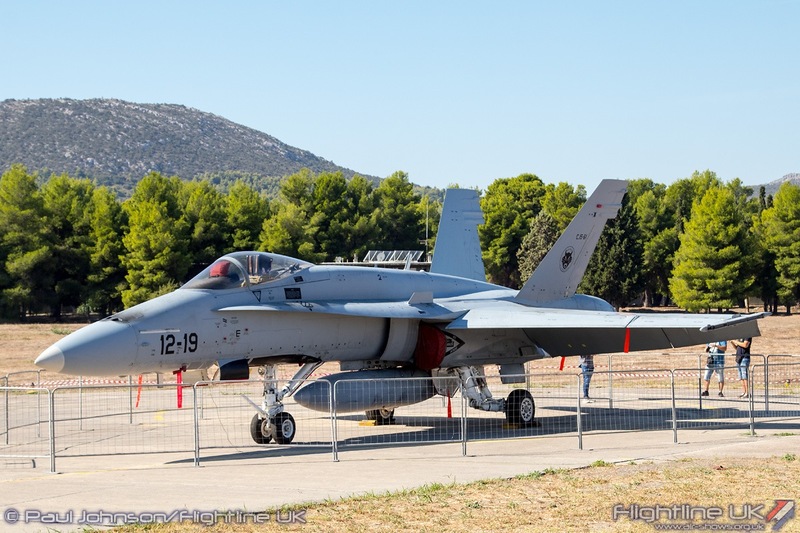 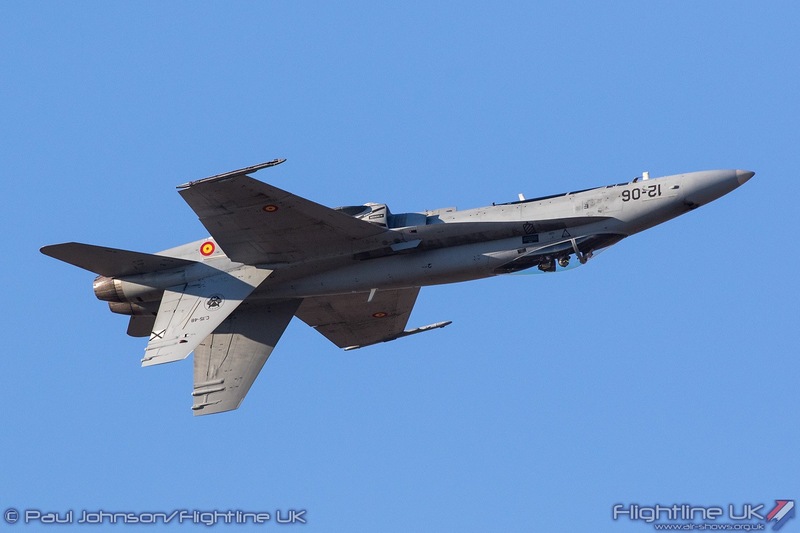 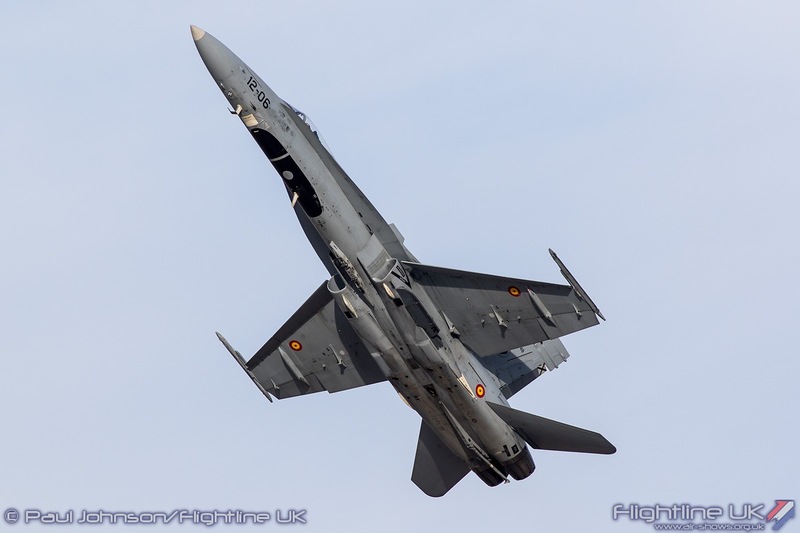 Further Hornet action came from the Spanish Air Force with a EF-18M (C.15) Hornet from Ala 12. 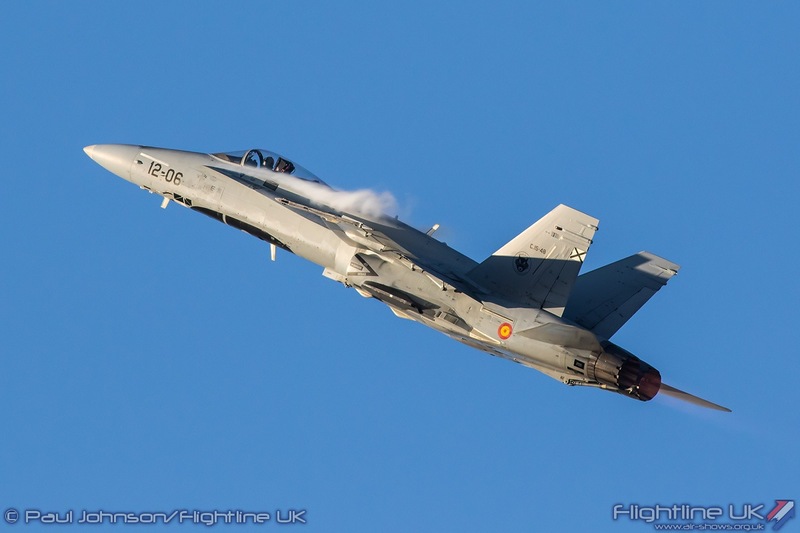 Spain is unusual in that it had two EF-18M solo displays originating from two different squadrons, Ala 12 and Ala 15. 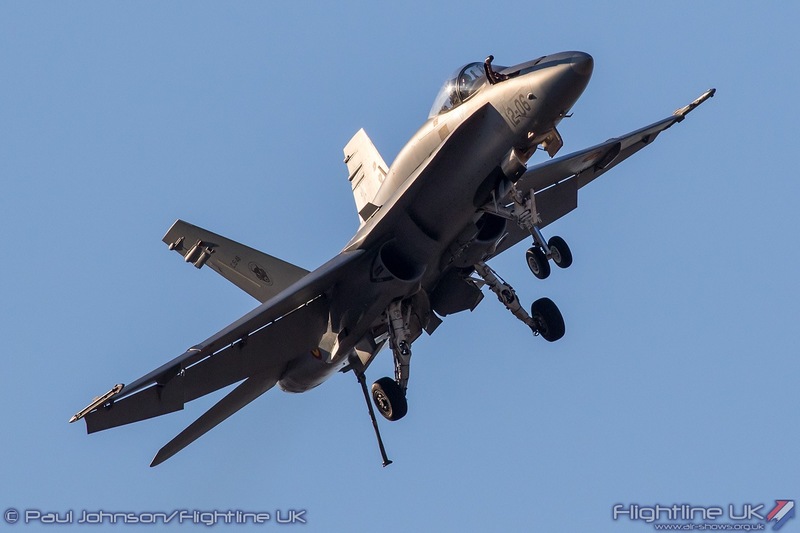 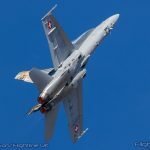 This year’s routine from Ala 12 really highlights the high angle-of-attack and slow speed handling capabilities of the Hornet with some dramatic tight turns and an outrageous high-alpha pass which makes the jet appear as though it is standing on its tail. 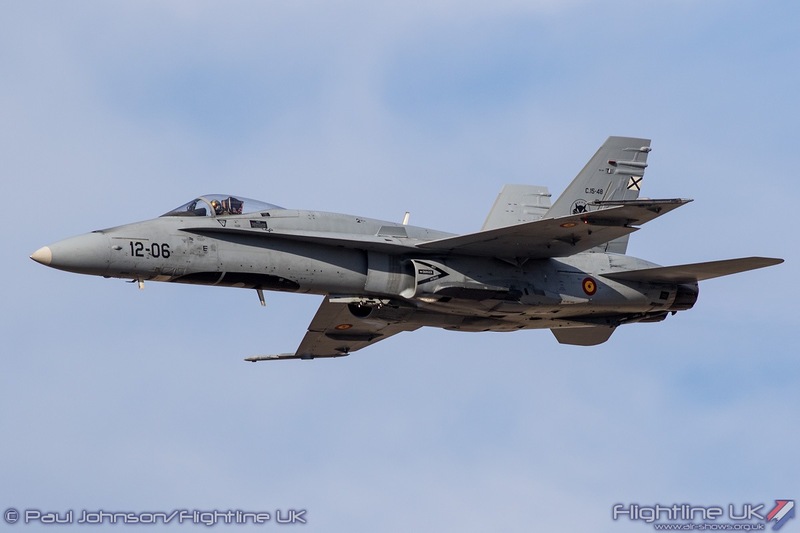 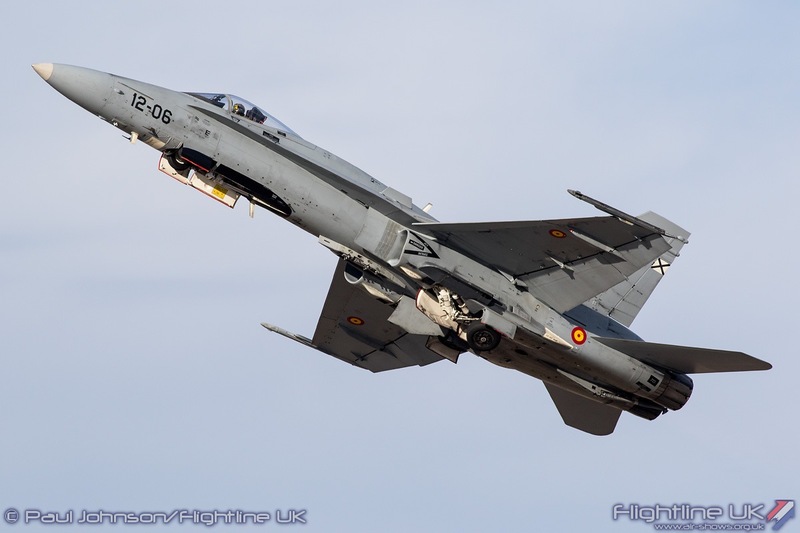 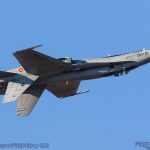 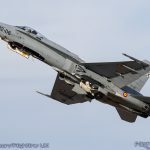 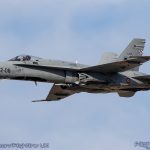 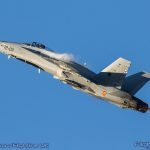 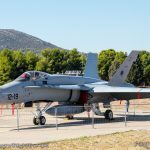 2018 was the first time the Spanish Air Force had contributed to the Flying Week with the EF-18, though they have previous attended with Patrulla Aguila. 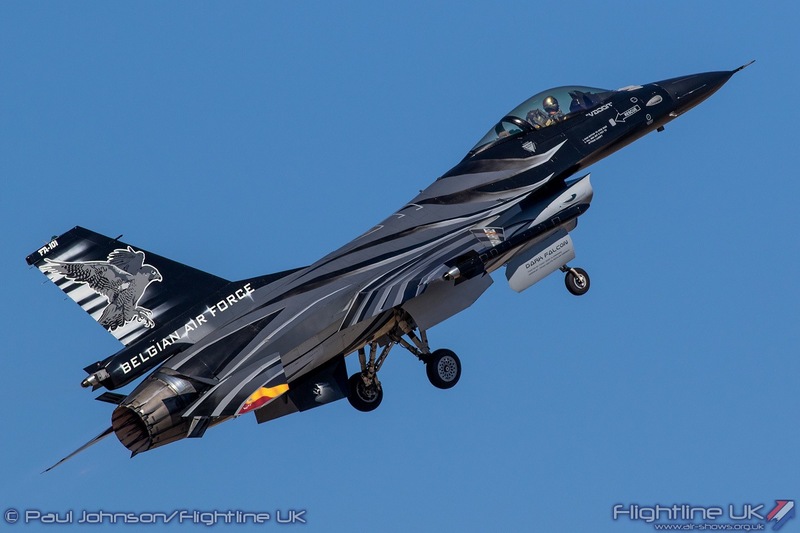 Completing the line-up of international fast jet displays was the Belgian Air Force’s Lockheed Martin F-16AM Fighting Falcon solo flown by Captain Stefan “Vador” Darte. 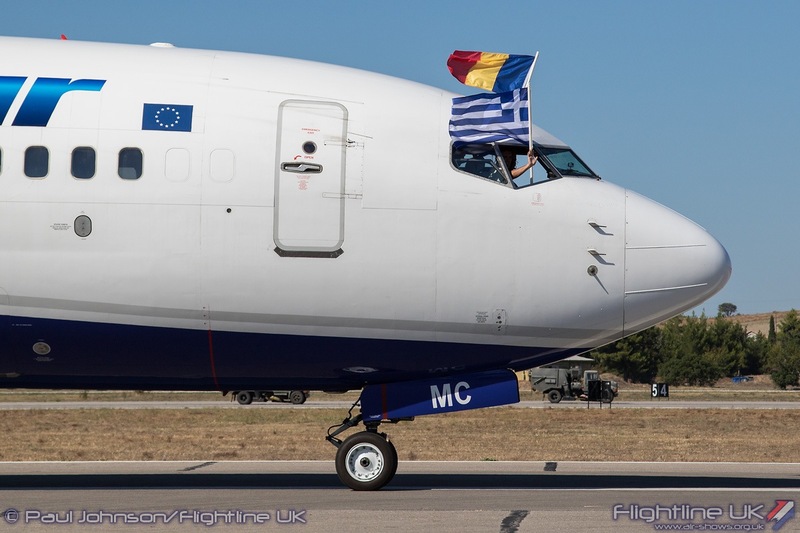 As with all of the team’s international performances this year, the aircraft’s special scheme was modified with the host nations flag on one of the horizontal stabilizers which is a very nice touch by the team. 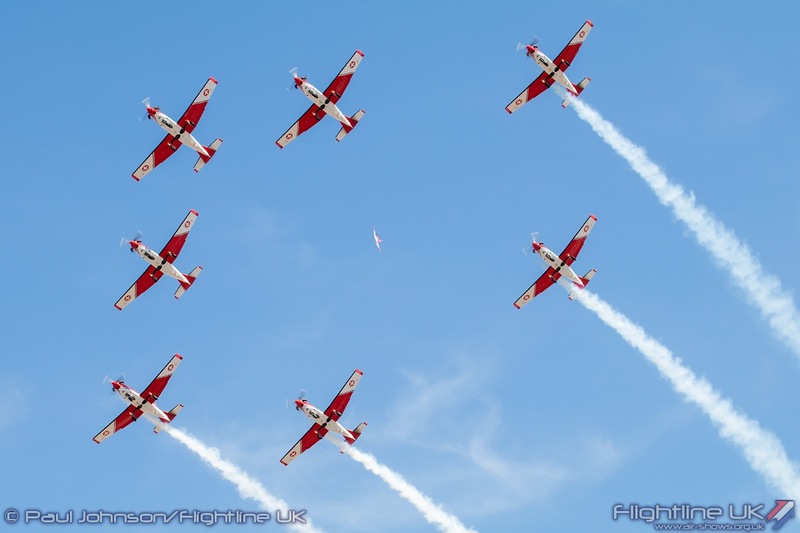 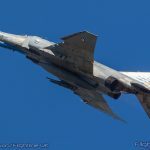 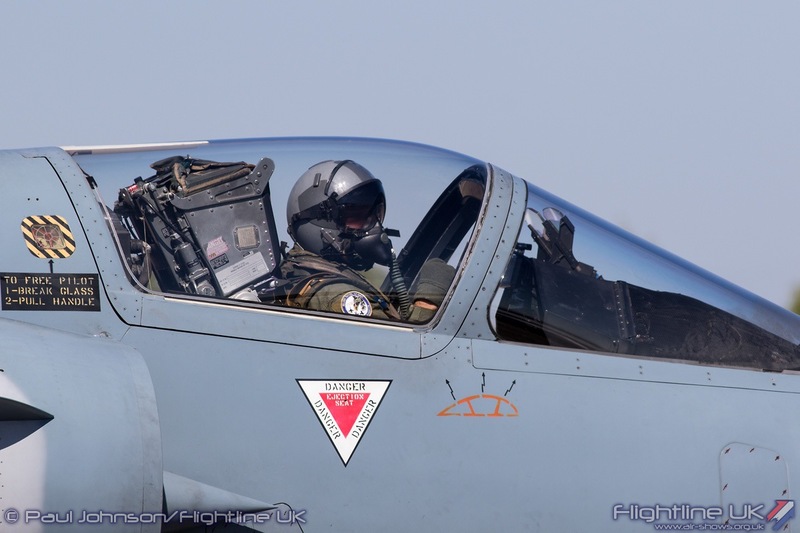 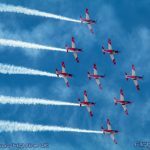 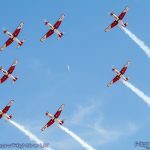 The Polish Air Force is been superb supporters of Athens Flying Week throughout the events history 2018 is an important year for the Polish Air Force as they celebrate 100 years of military aviation in Poland. 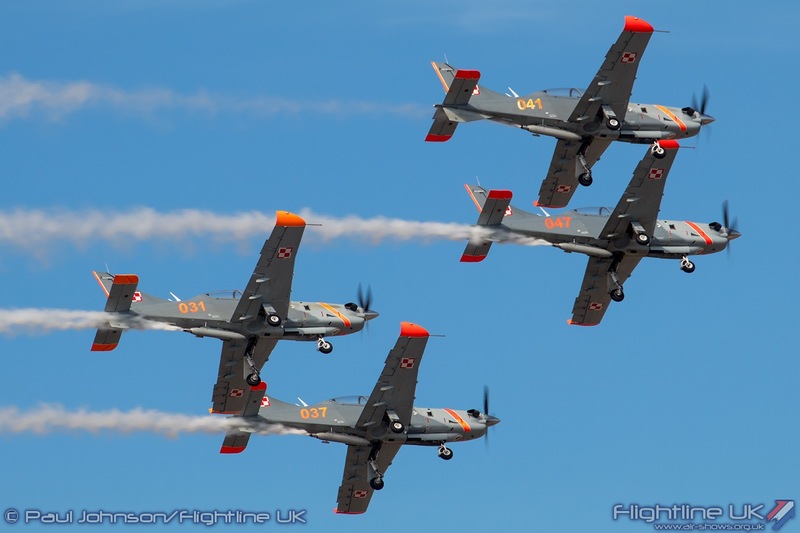 Sadly, the grounding of the MiG-29 fleet meant they were unable to add to the fast jet line-up but they did send the Zespół Akrobacyjny “Orlik” (Orlik Aerobatic Team.) 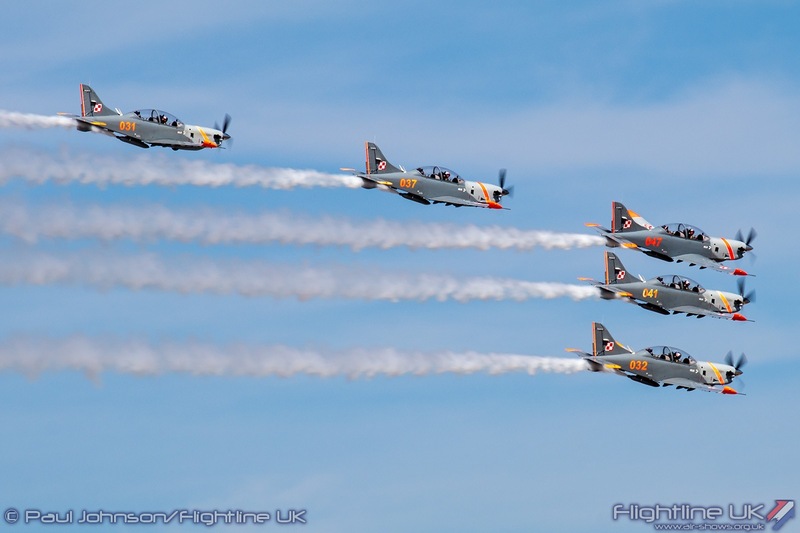 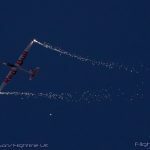 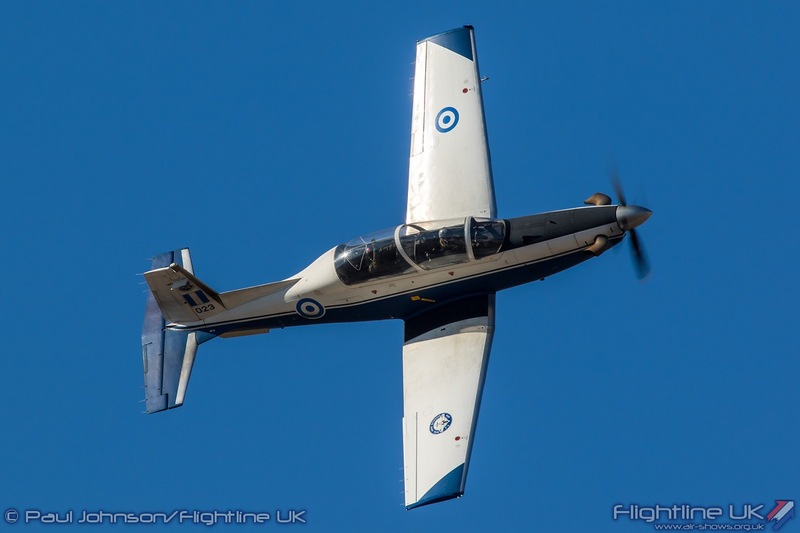 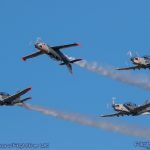 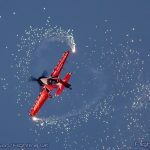 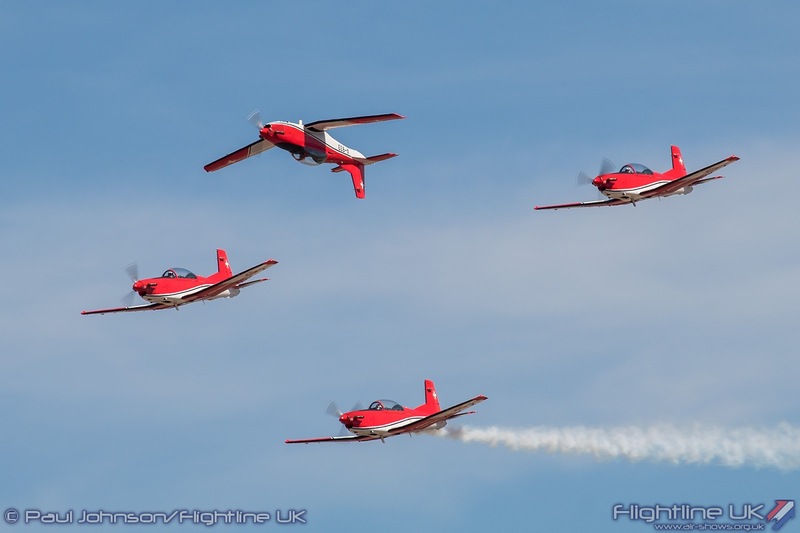 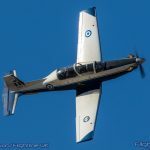 Flying the PZL 130TP-II Orlik basic trainer, the team have displayed in a variety of configurations during the 2018 season including duos, three-ships and even a routine with a pair of Harvards. 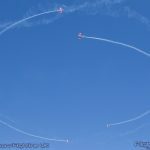 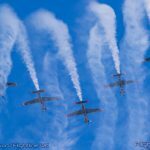 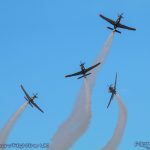 For AFW however they sent a team of five aircraft for eye-catching routine of formation and solo aerobatics. 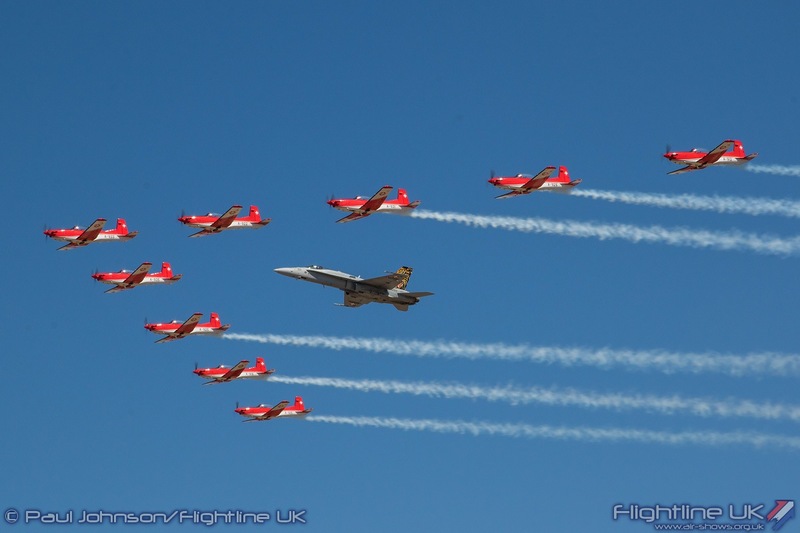 Joining the aerobatic and military displays were some airliners from various airlines. 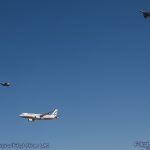 Each airliner not only took part in a flypast but also performed a landing before taxying around the aircraft and taking off again. 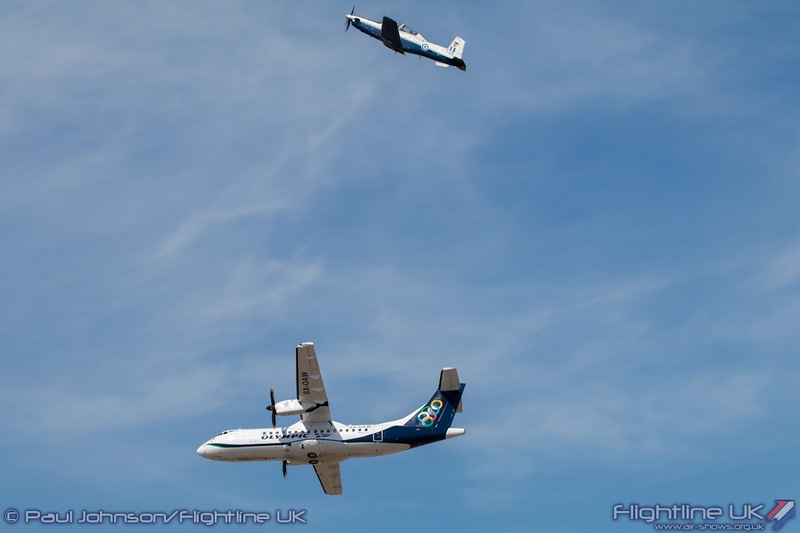 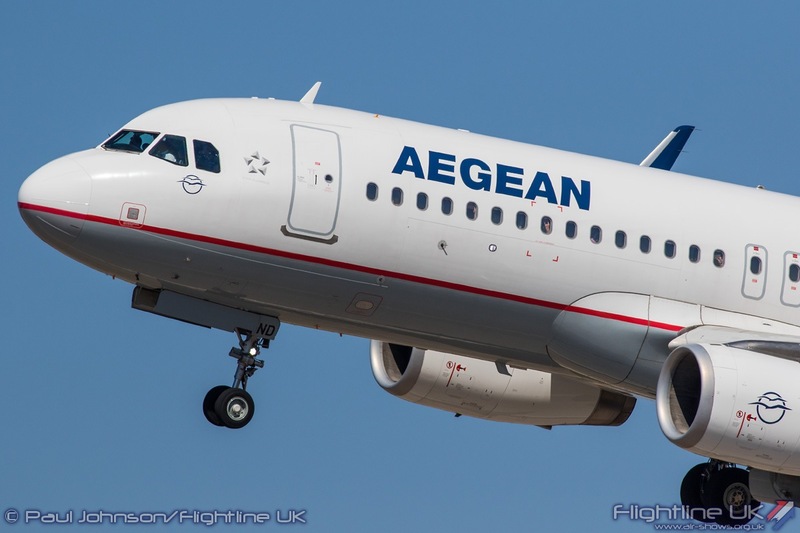 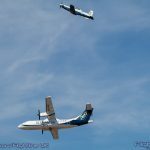 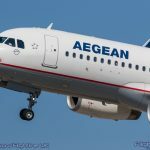 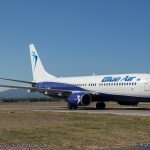 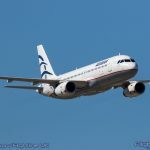 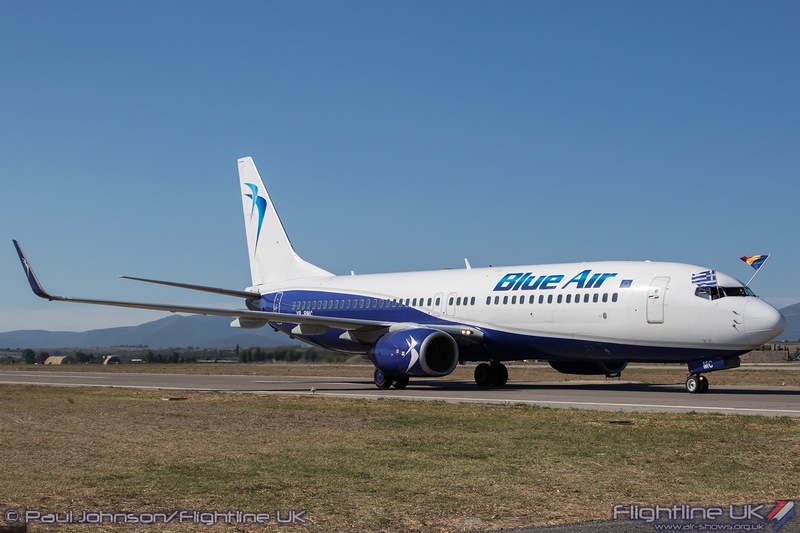 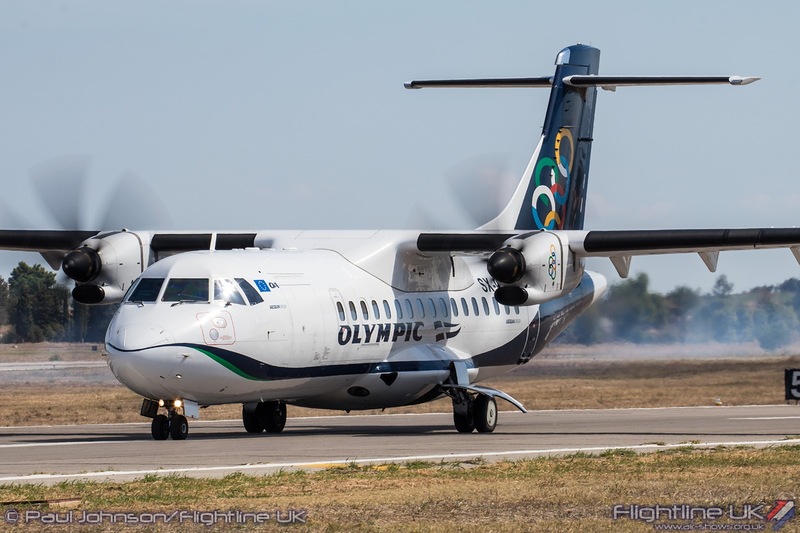 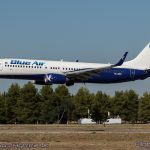 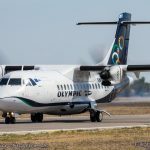 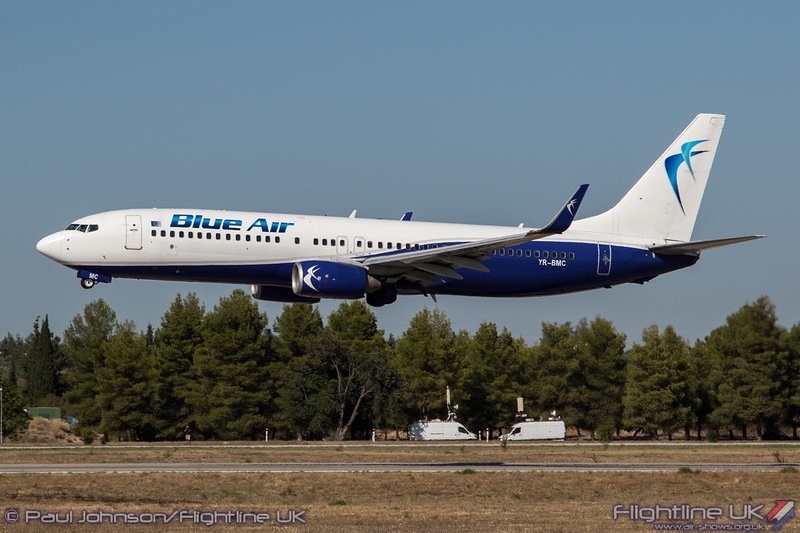 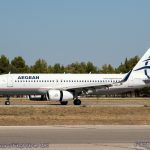 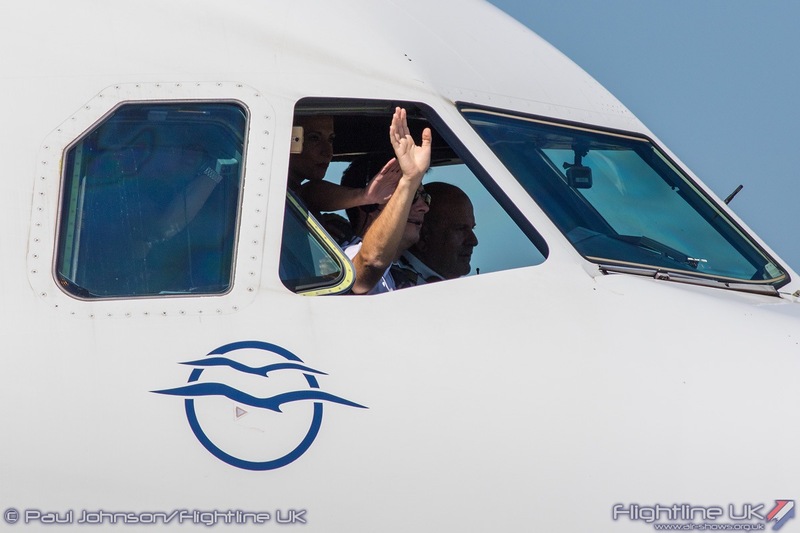 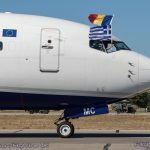 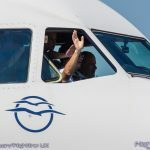 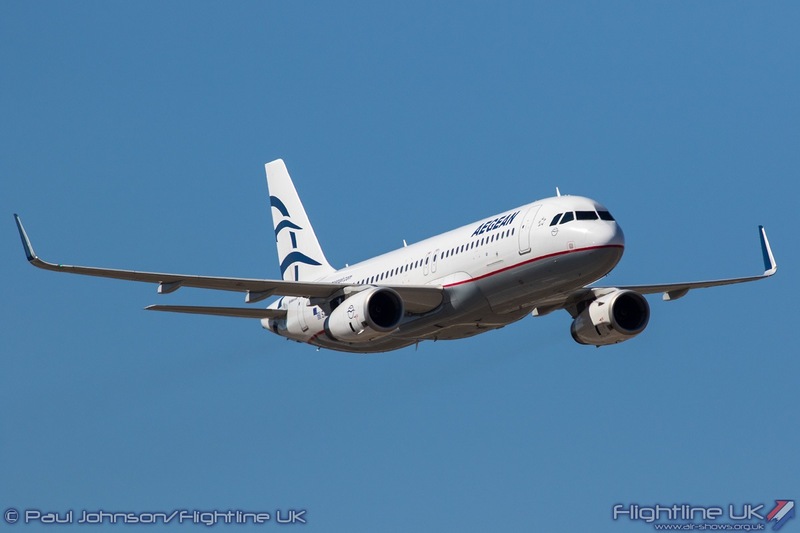 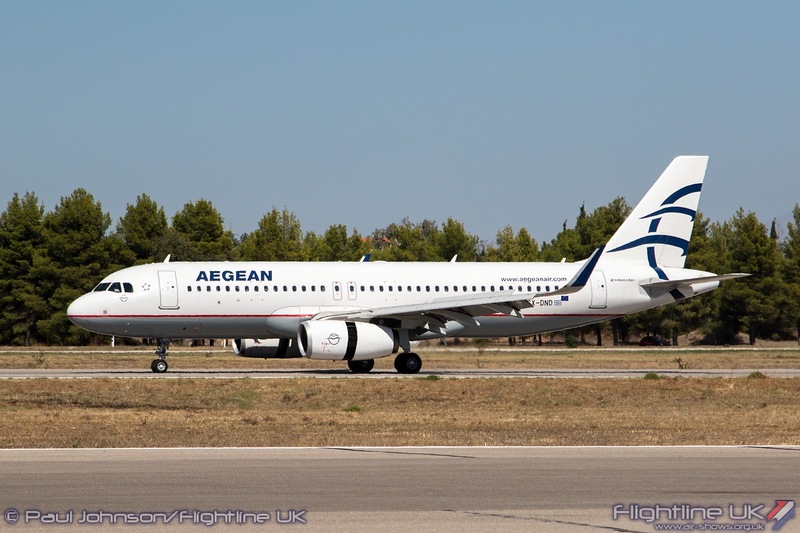 Saturday saw Olympic Air participate in the flying with an ATR 42-600 while Sunday saw an Aegean Airbus A320 and Romanian airline Blue Air participate with a Boeing 737-800. 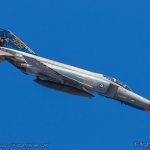 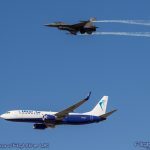 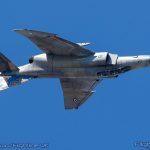 Each airliner was accompanied on their flypast by at least one of the Hellenic Air Force aircraft participating in the flying display. 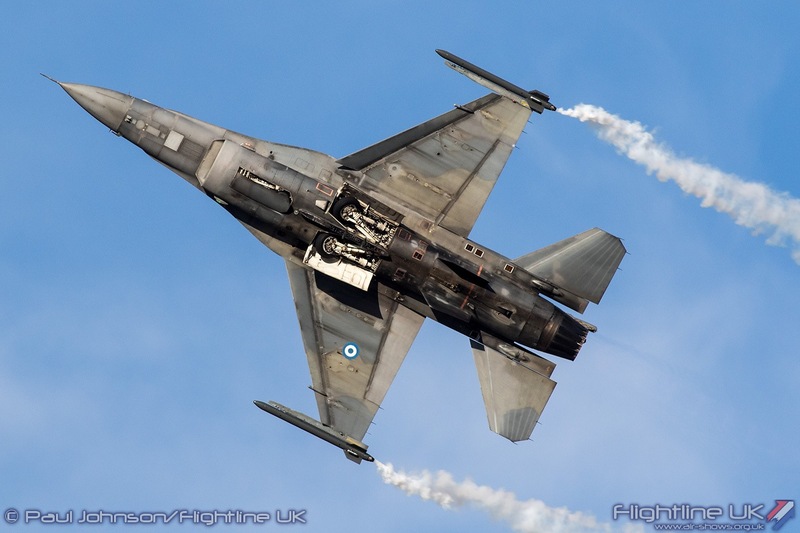 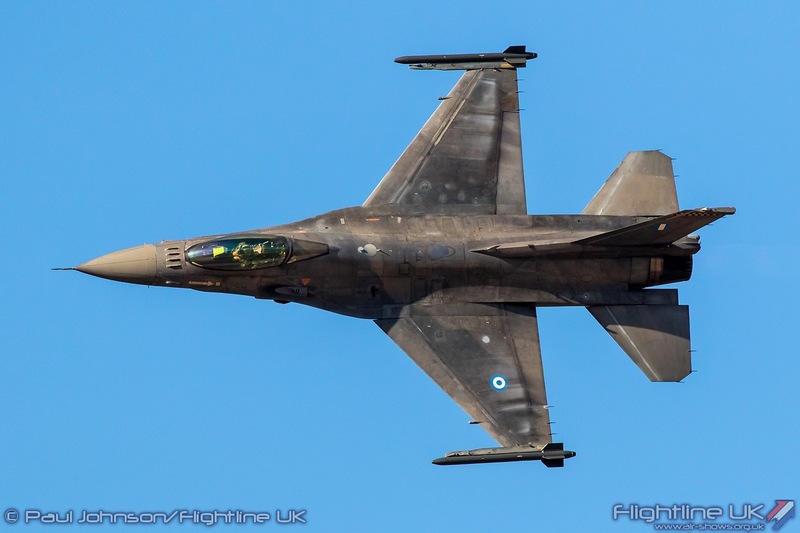 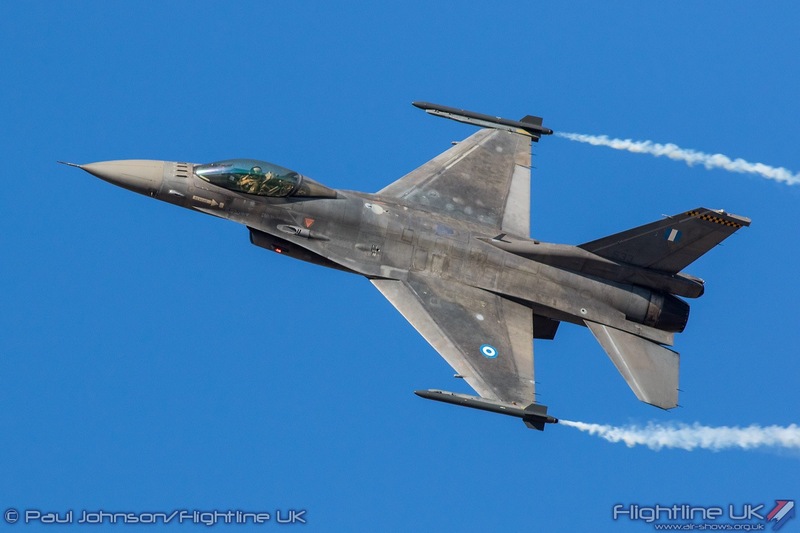 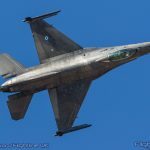 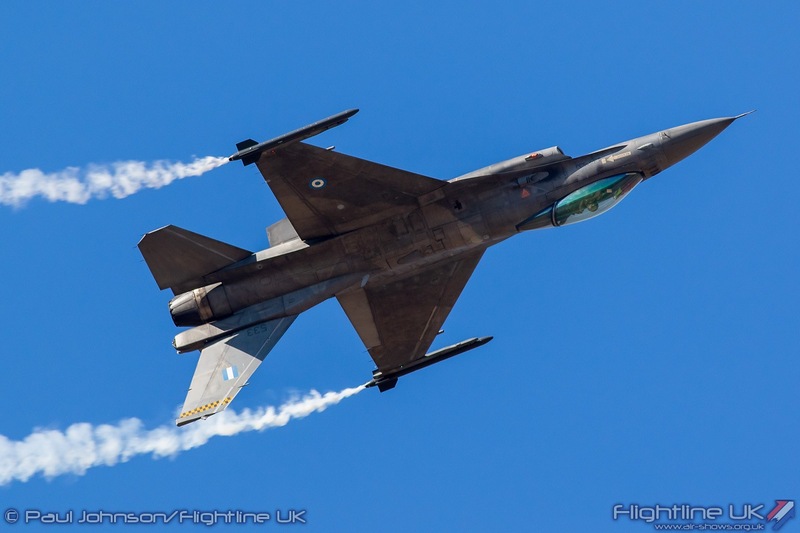 However, particularly for oversea visitors, the stars of the flying display were the Hellenic Armed Forces. 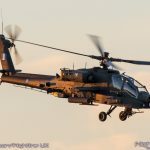 Saturday’s display saw the very popular Pegasus Apache Display Team from the Hellenic Army perform in the golden light of the early evening. 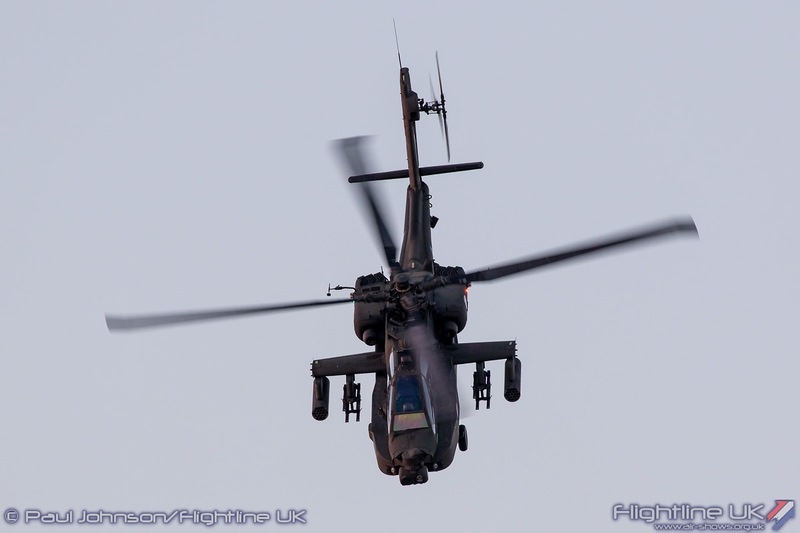 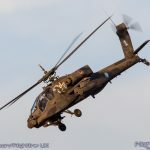 The team flew a specially marked Boeing AH-64A+ Apache. 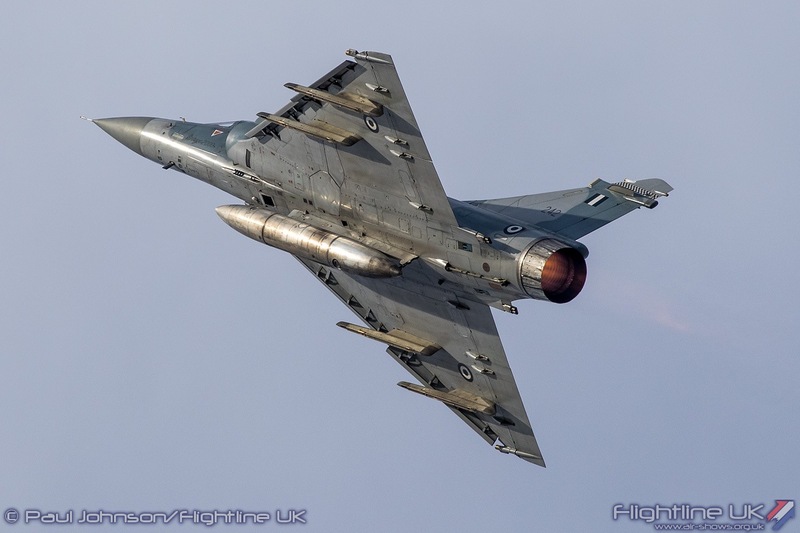 This impressive display is conducted at very low level as the aircraft would be used in combat operations and it kept well within the confines of the airfield. 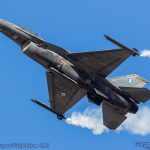 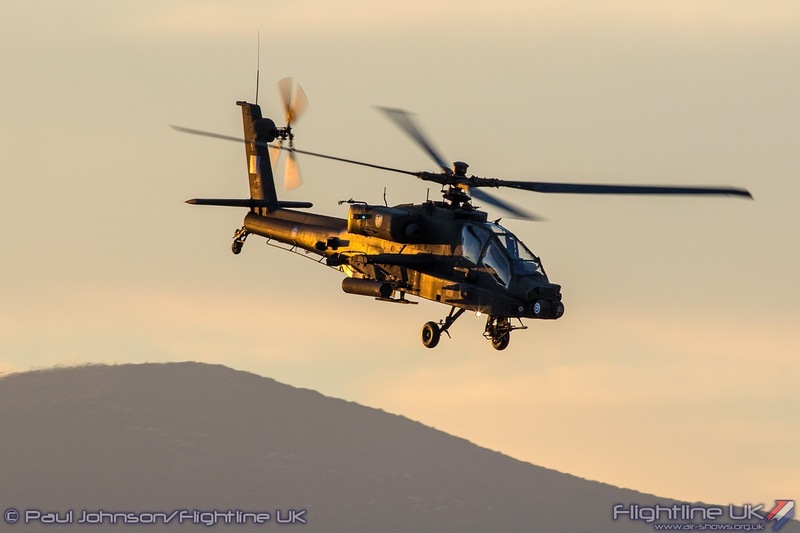 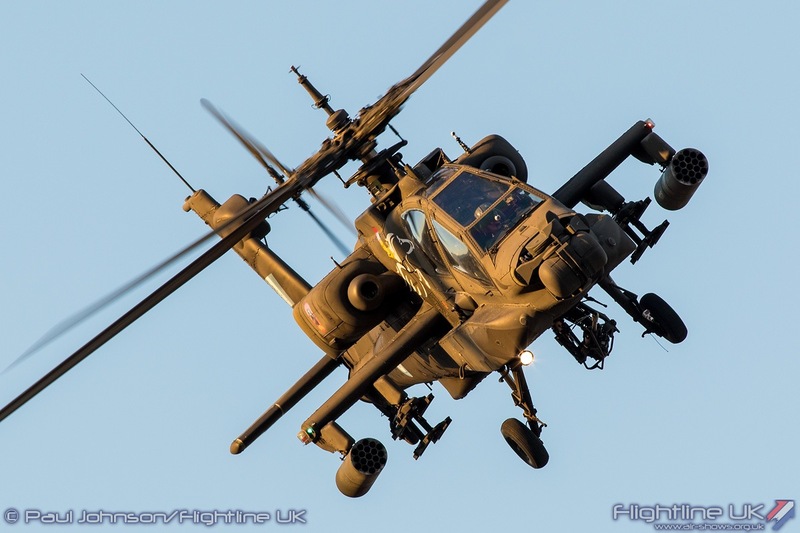 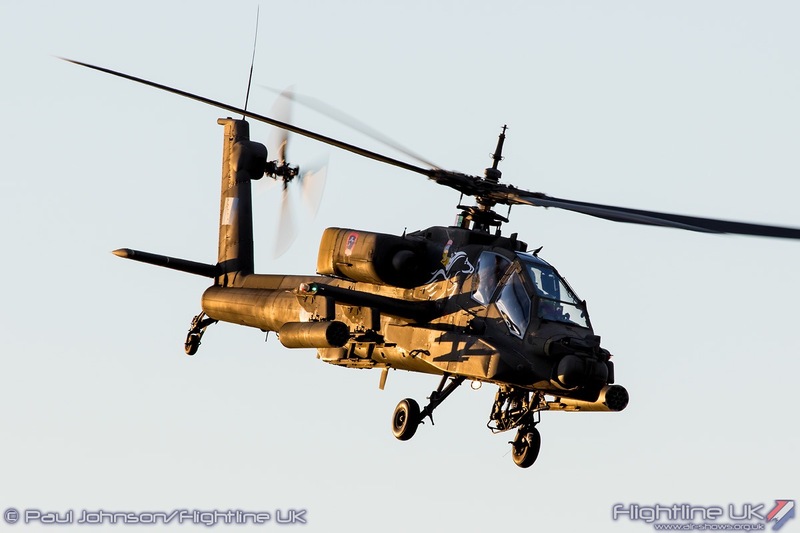 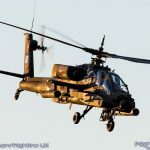 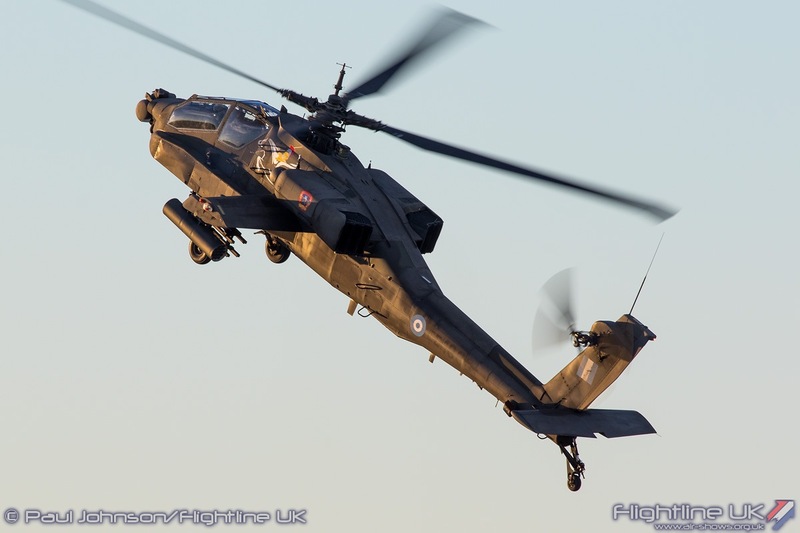 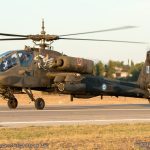 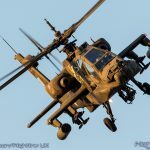 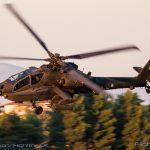 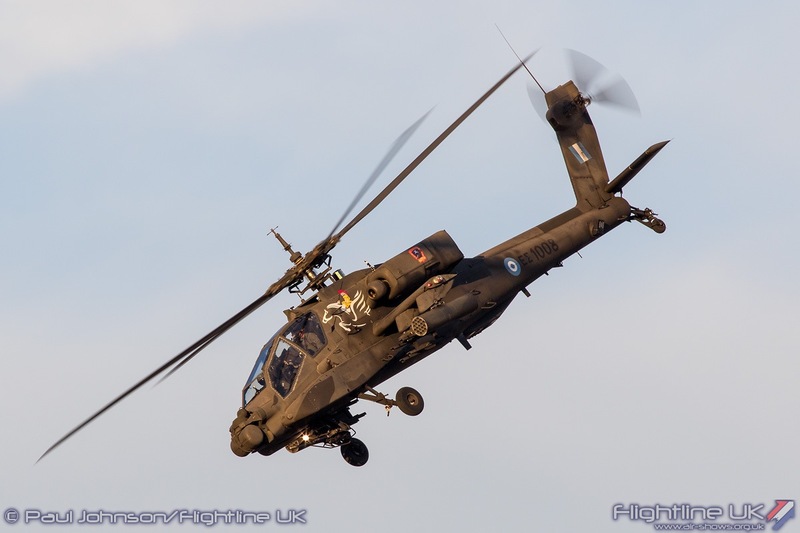 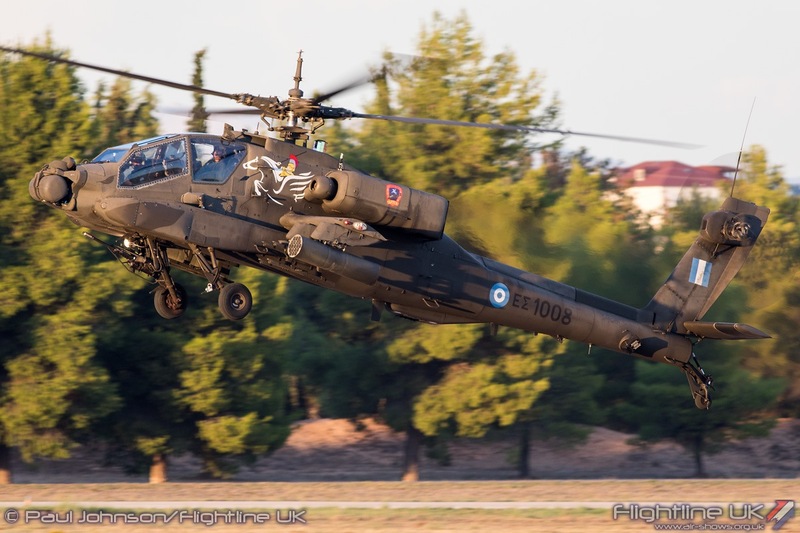 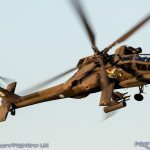 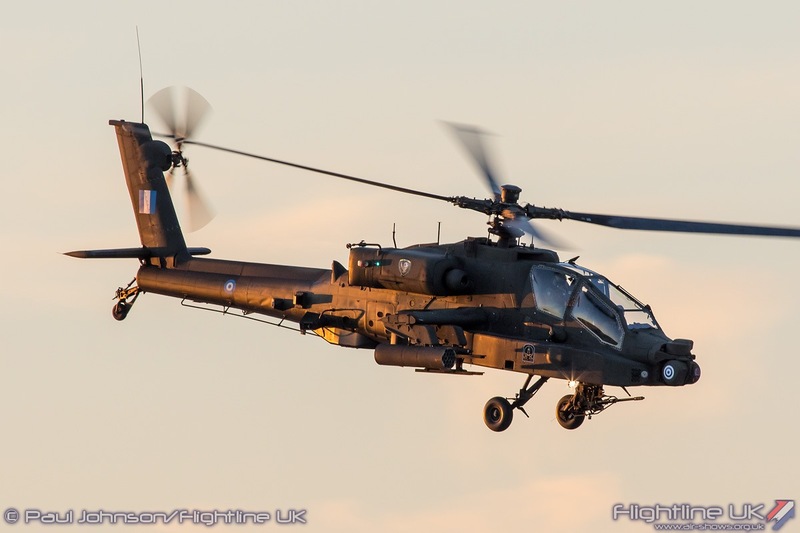 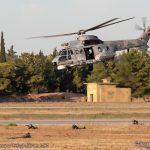 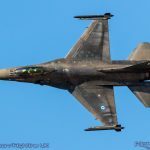 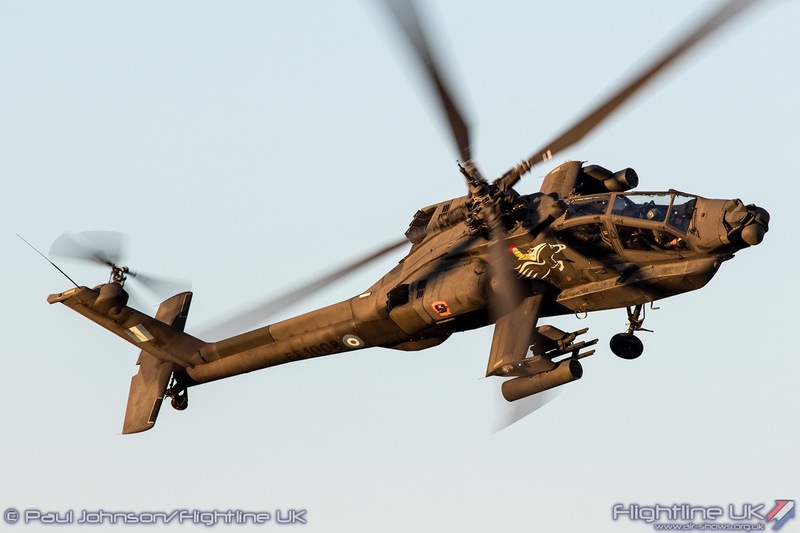 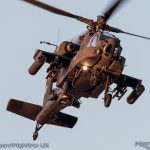 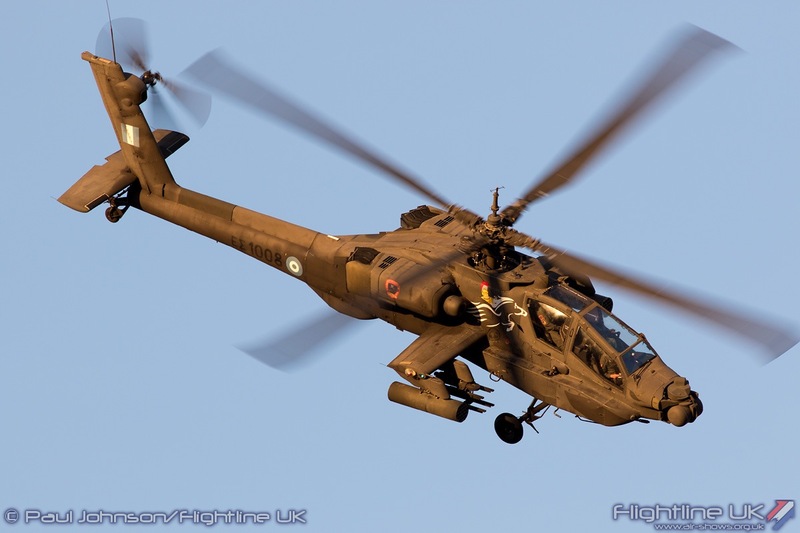 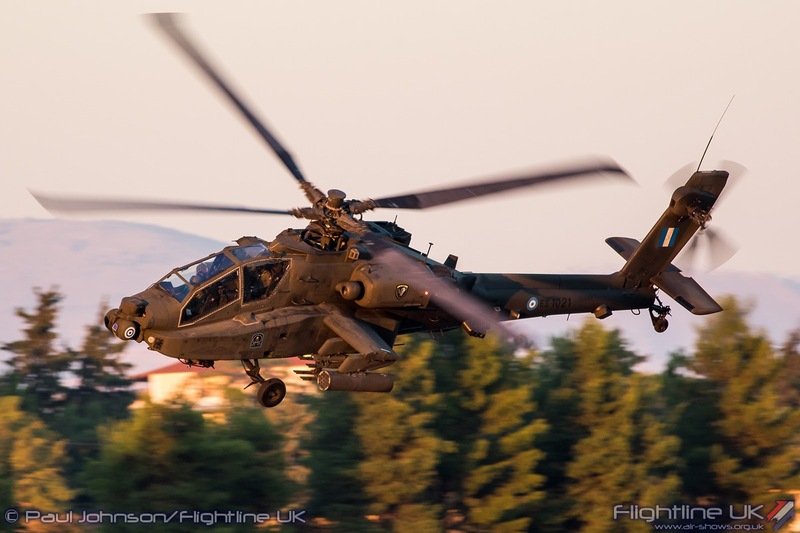 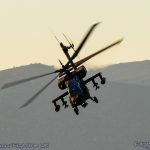 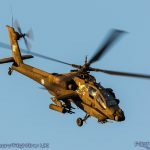 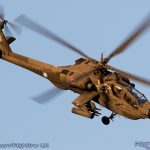 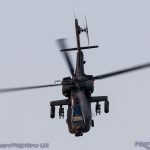 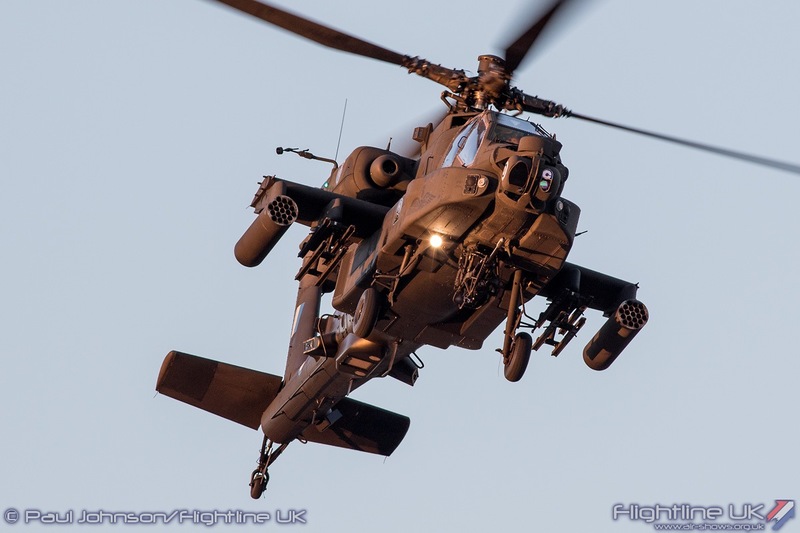 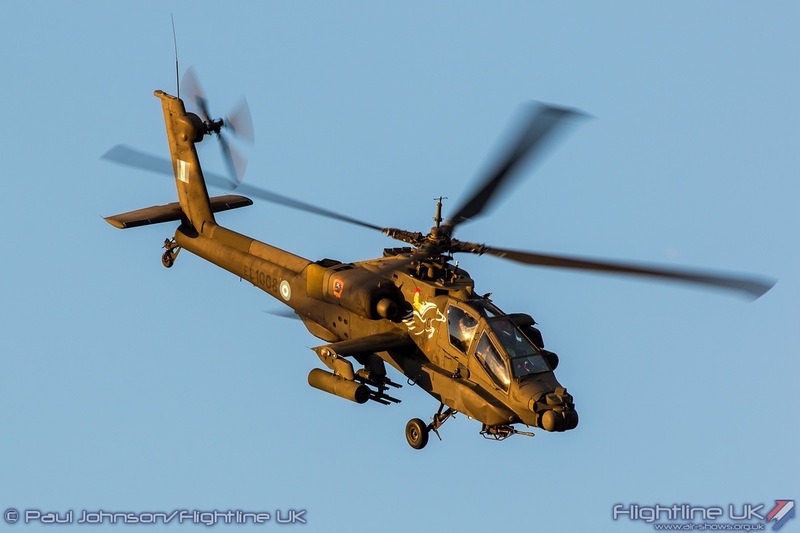 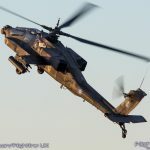 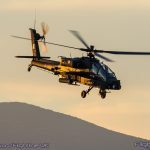 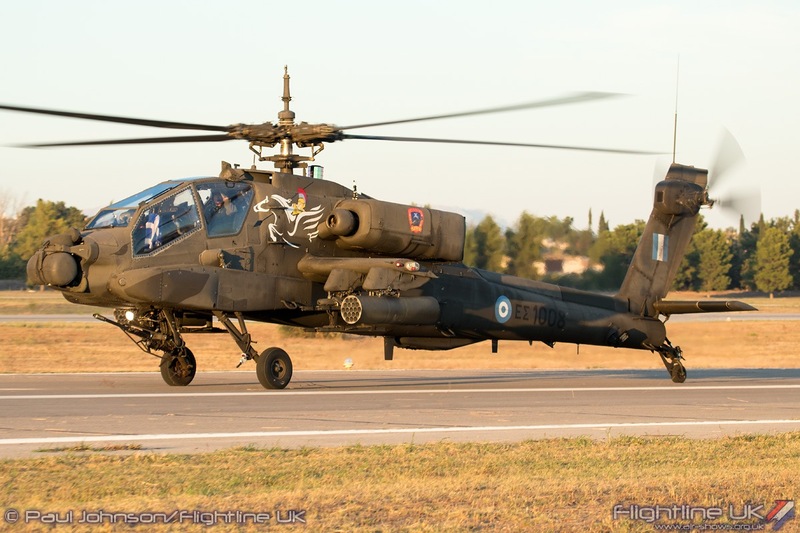 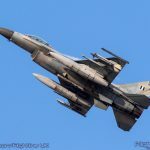 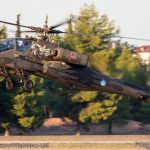 On Sunday, the crowds were treated to a role demonstration from one of the Hellenic Army’s newer AH-64DHA Apache aircraft which had been on static during Saturday. 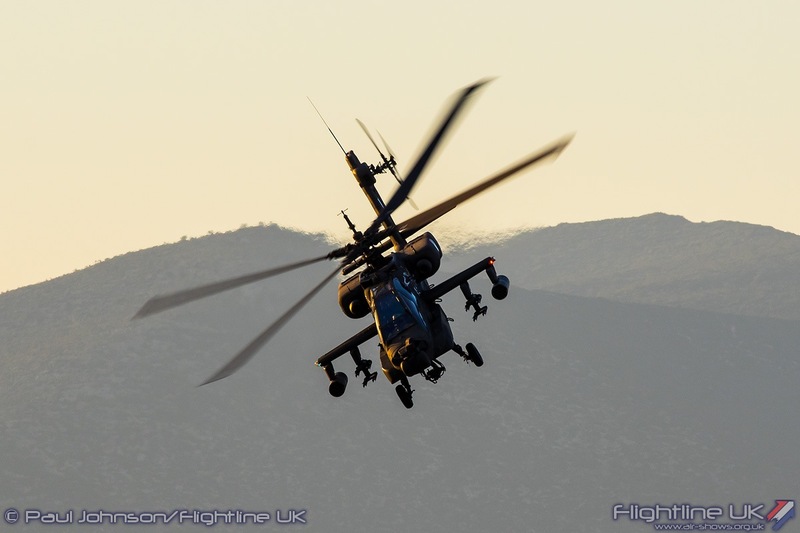 Whilst less punchy than the Pegasus demo, the AH-64DHA put on an impressive display of the types agility. 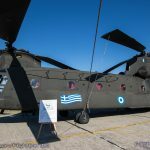 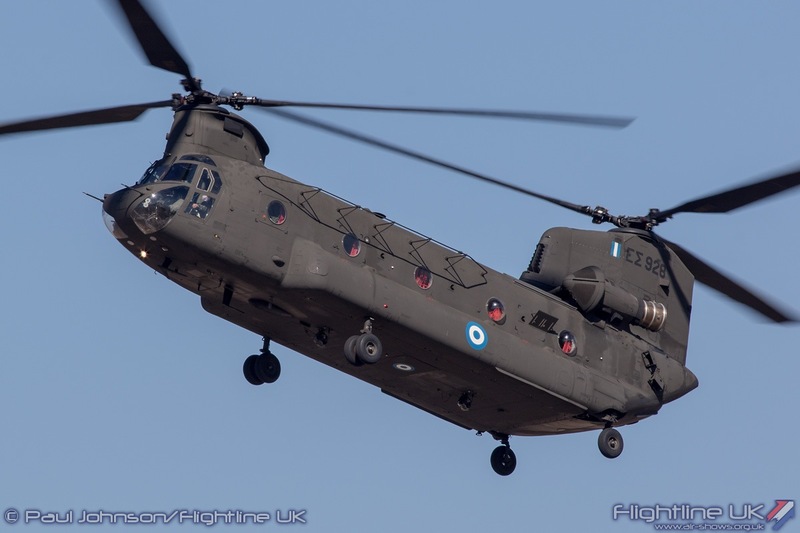 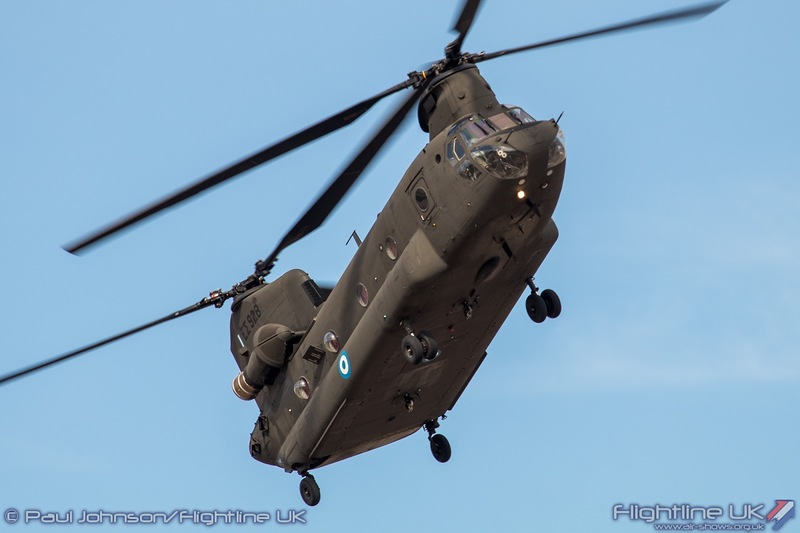 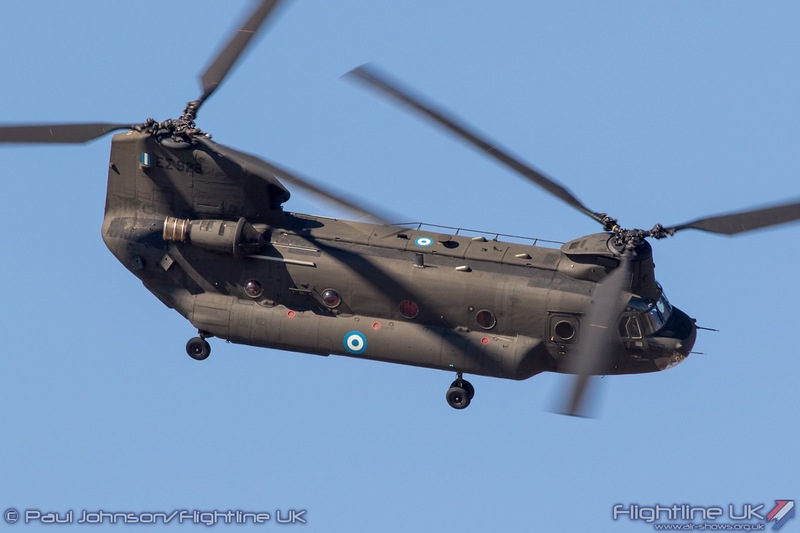 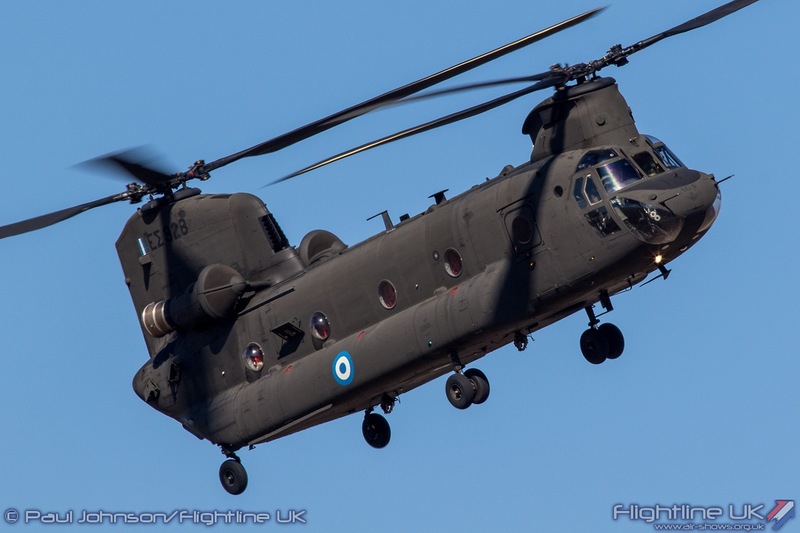 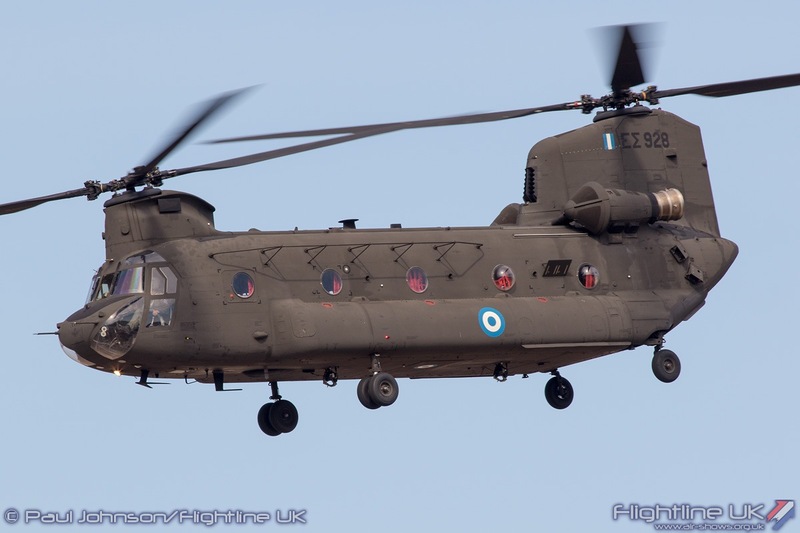 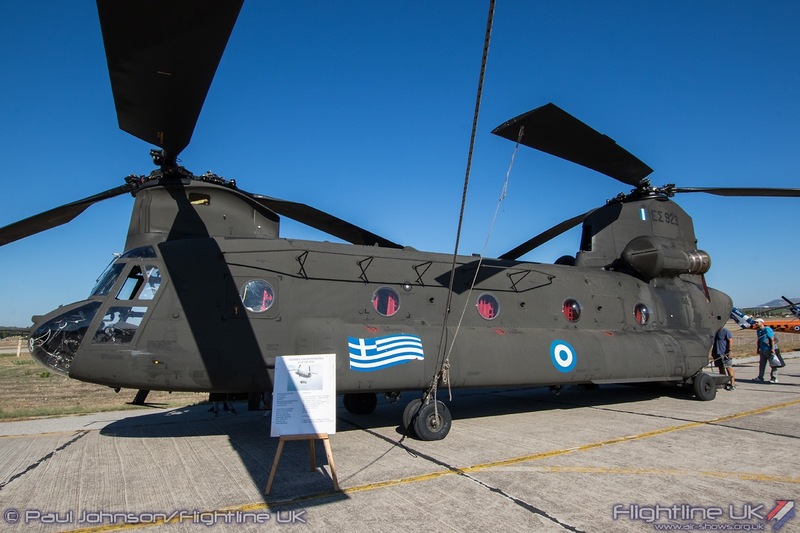 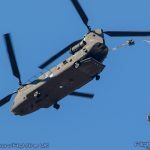 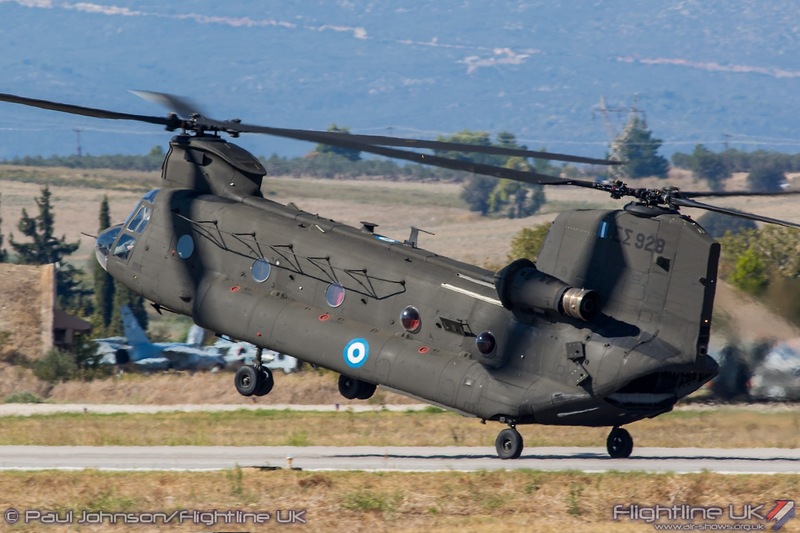 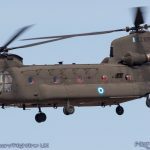 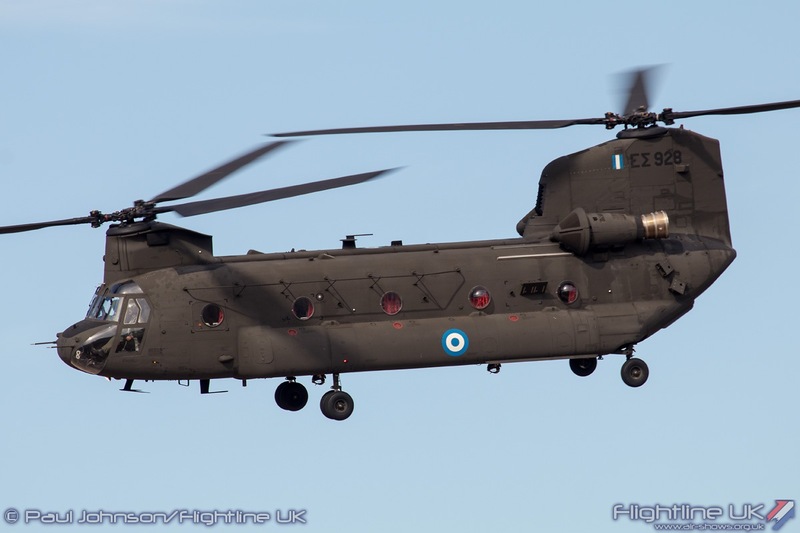 The Hellenic Army also presented a Boeing CH-47D Chinook in the flying display. 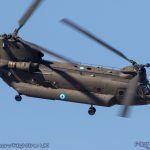 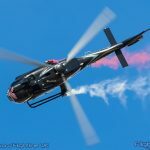 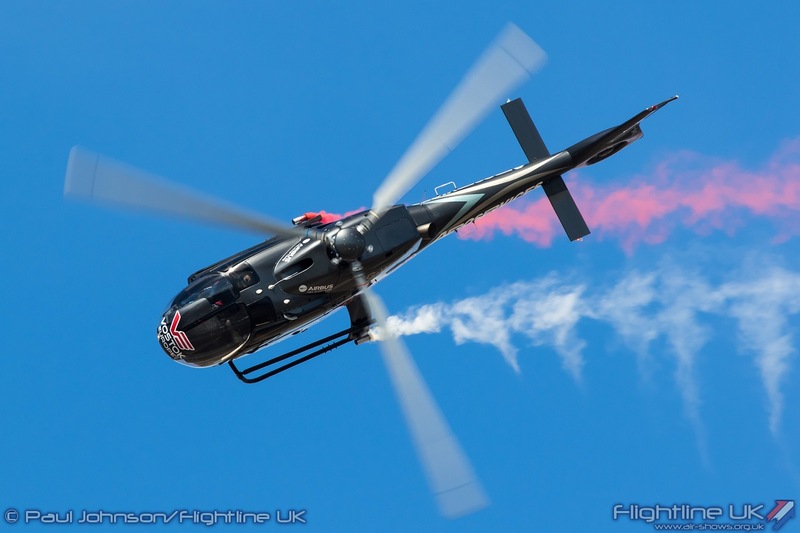 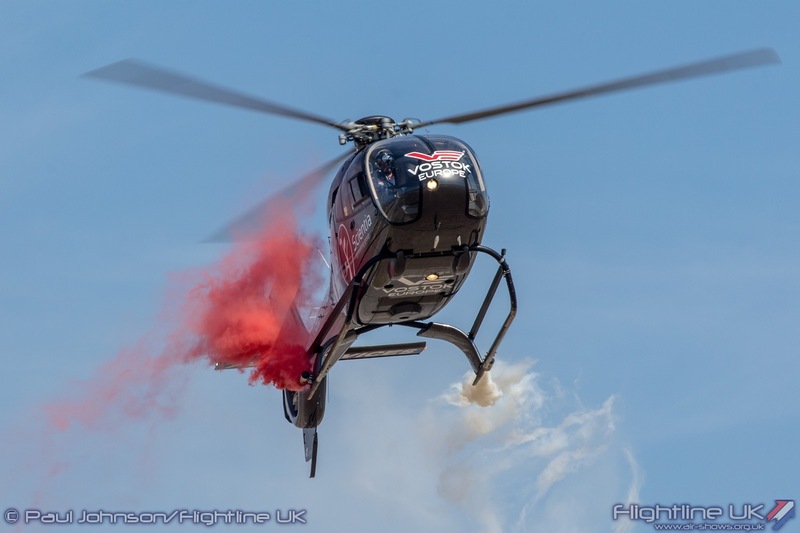 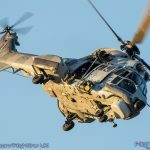 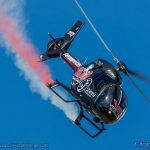 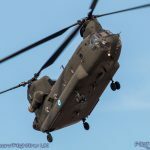 Both days saw a display from the twin-rotor helicopter which also included a running landing on the rear wheels just as we see with the RAF displays. 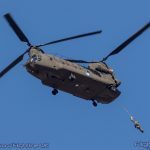 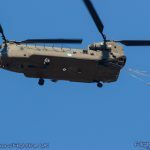 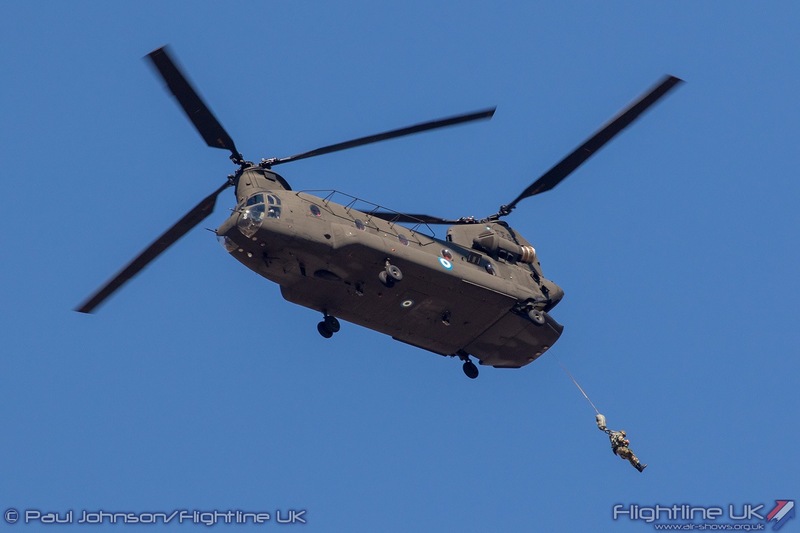 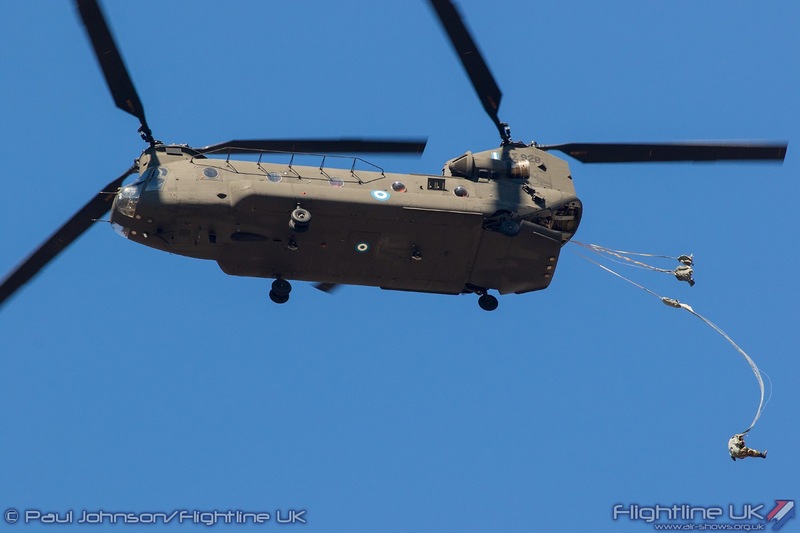 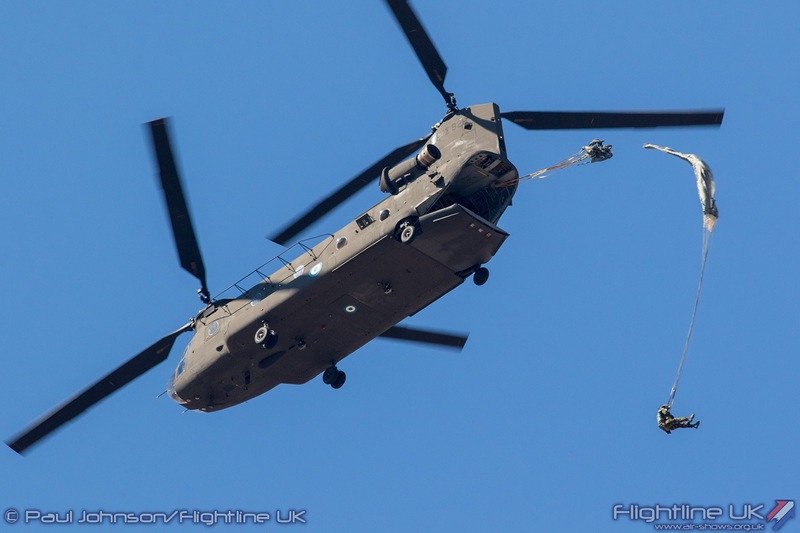 However, for Sunday’s display the Chinook also conducted a paratrooper insertion demonstration. 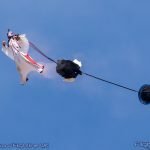 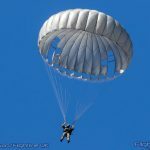 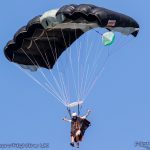 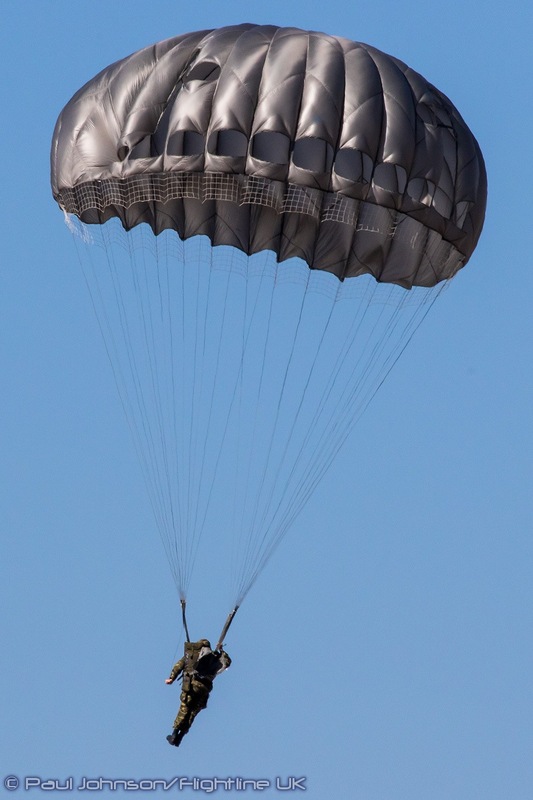 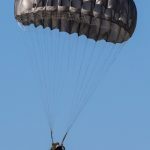 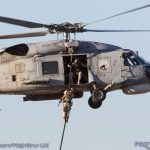 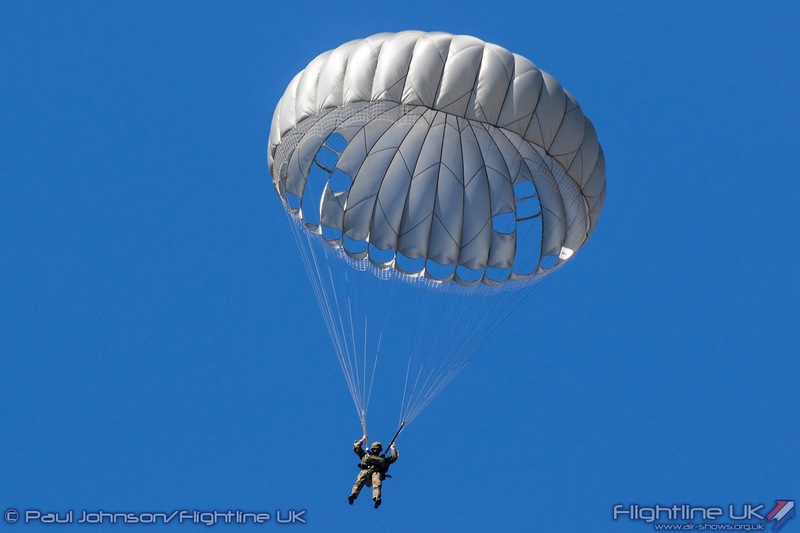 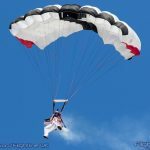 The troops performed a static line jump out of the rear of the aircraft at quite low level and used circular dome parachutes. 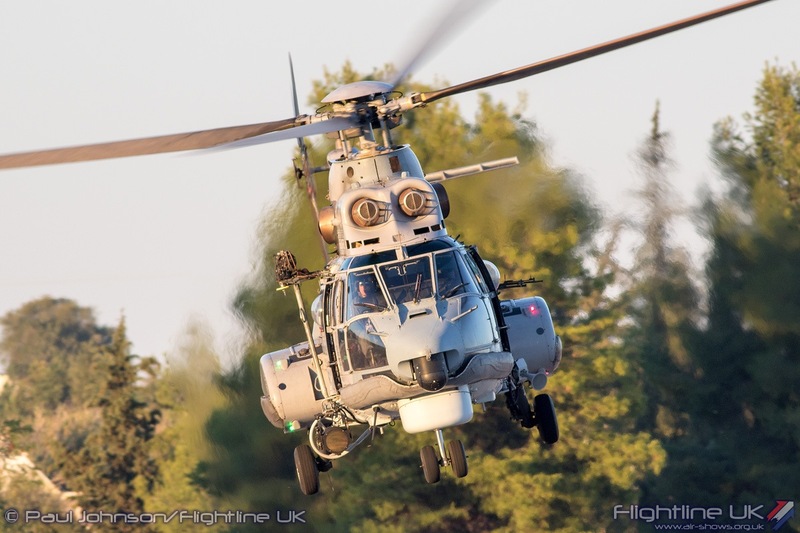 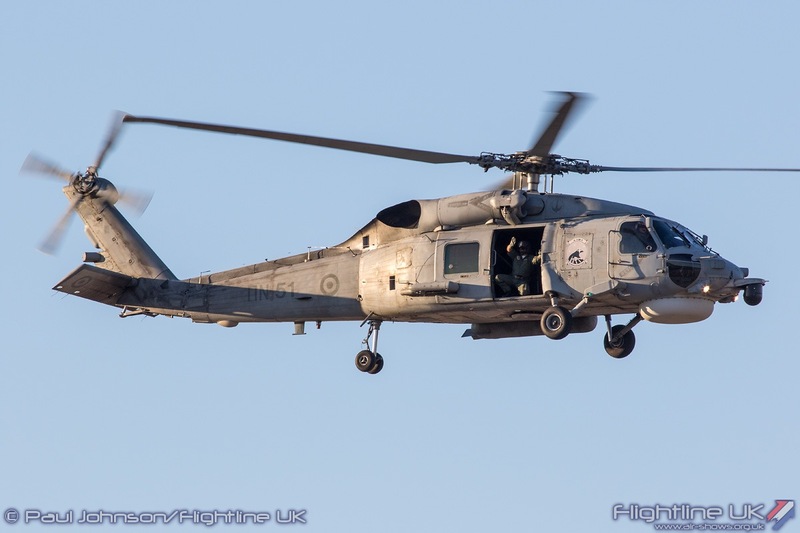 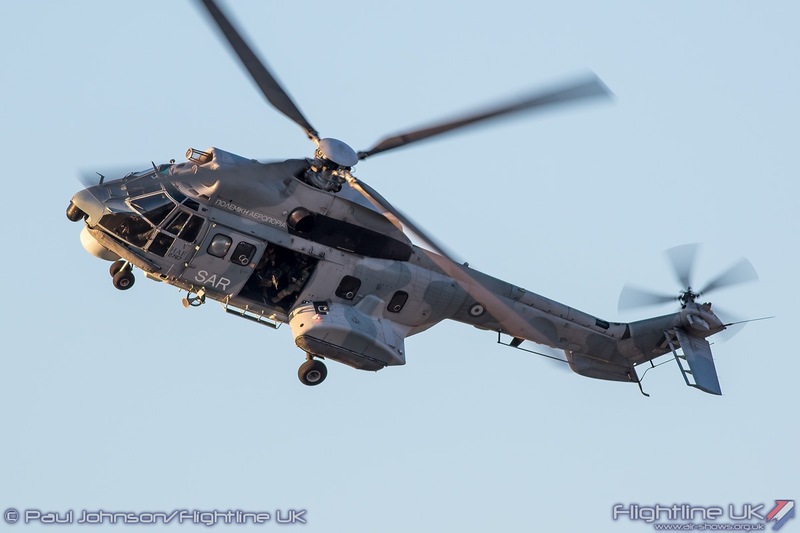 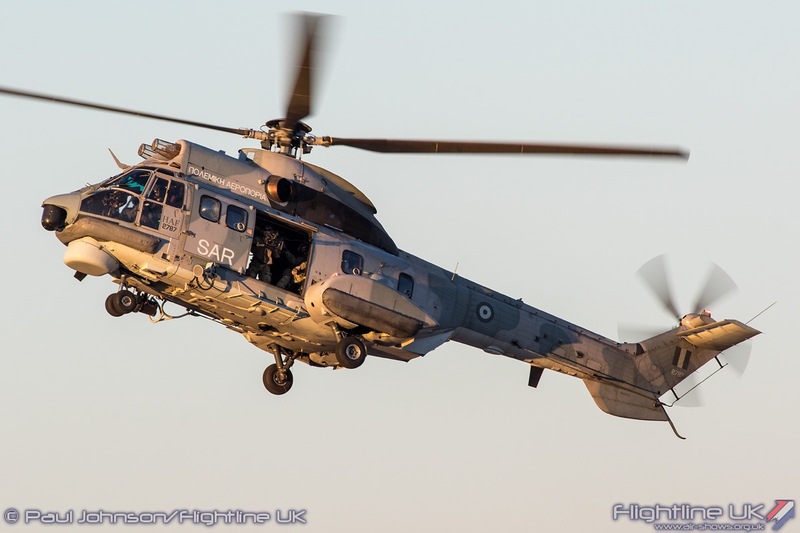 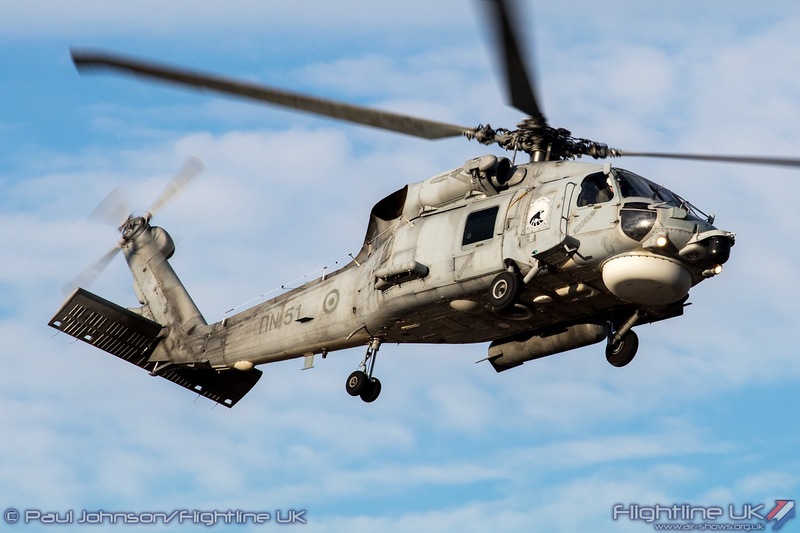 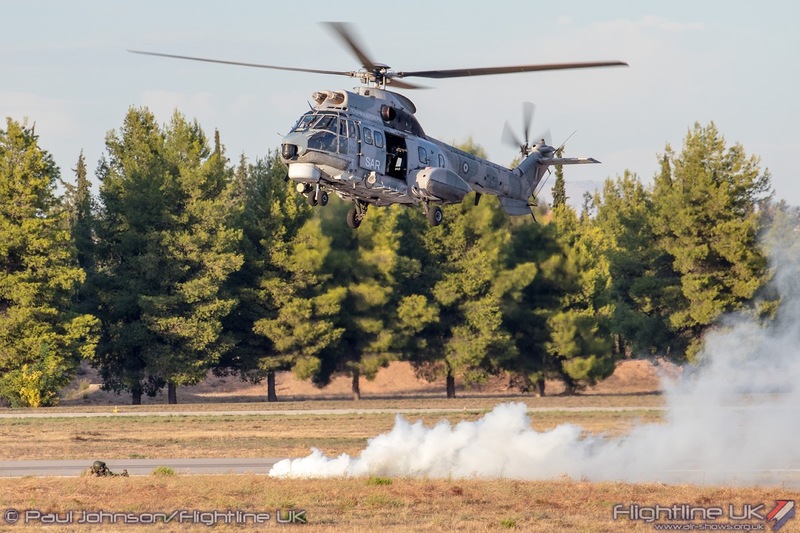 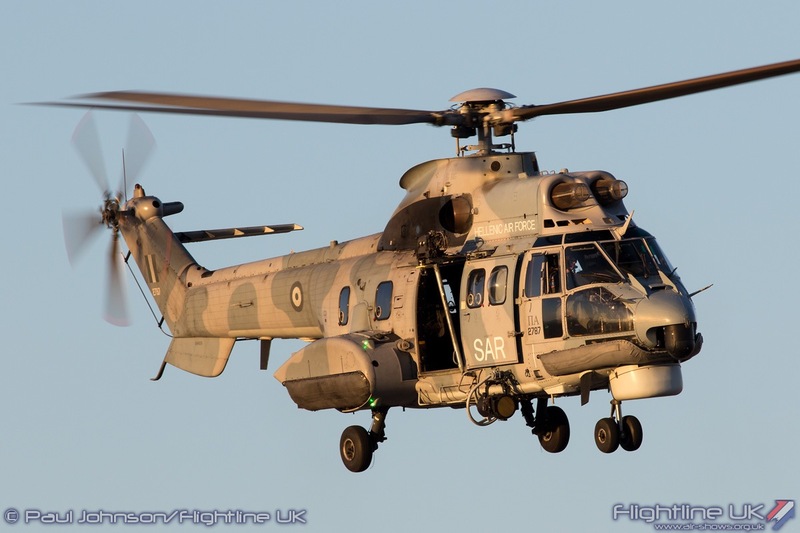 More military helicopter action came from the Hellenic Navy which participated with a Sikorsky S-70B-6 Aegean Hawk. 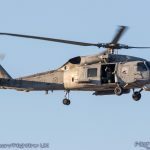 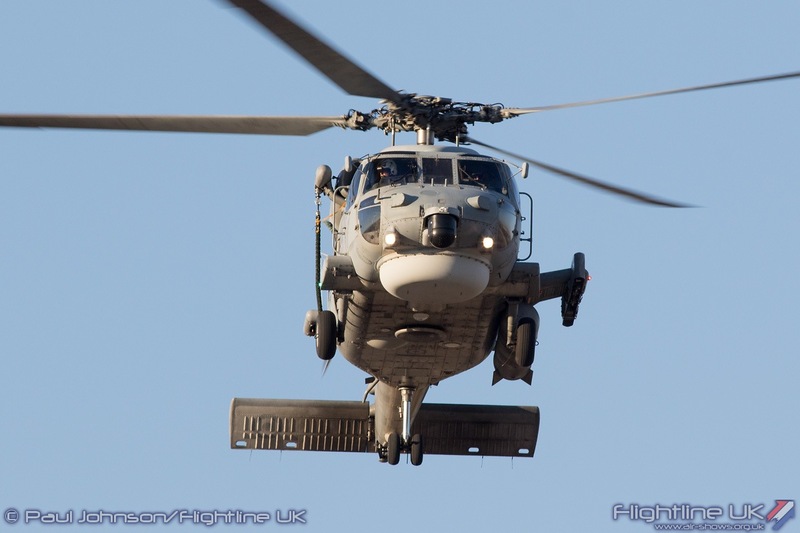 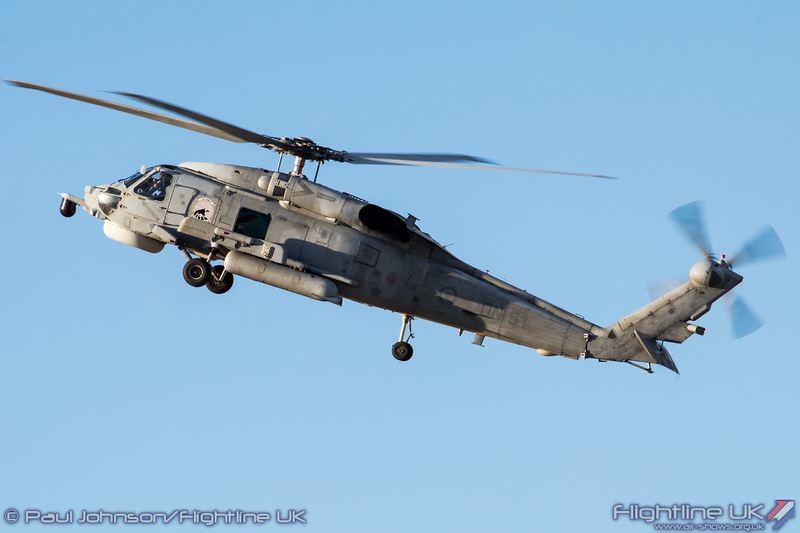 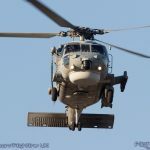 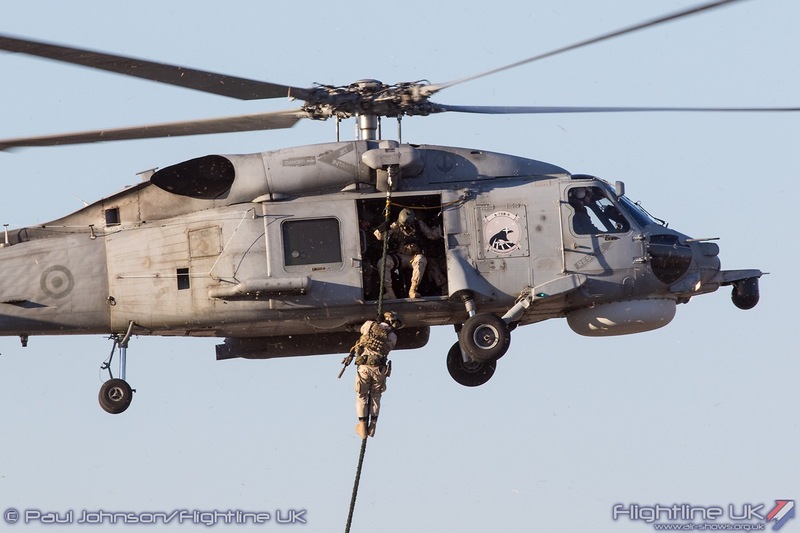 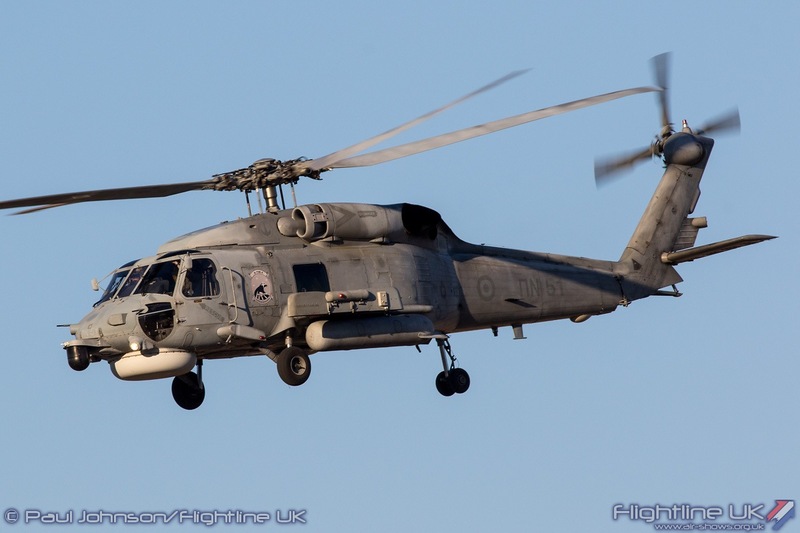 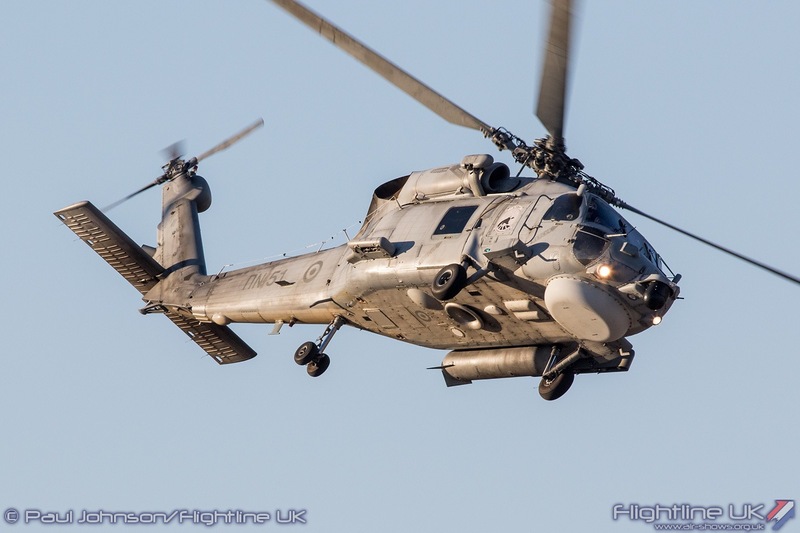 Developed from the SH-60 Seahawk used by the US Navy, the Aegean Hawk is used for a variety of maritime tasks including Anti-Shipping and Anti-Submarine warfare. 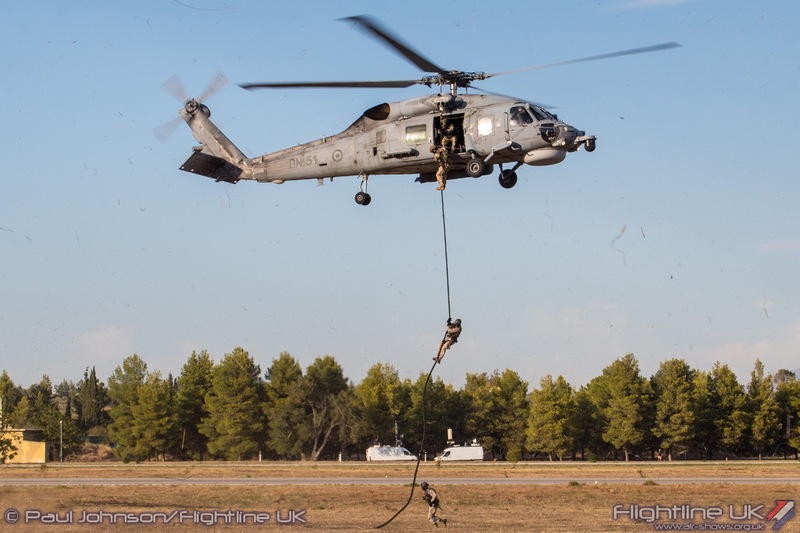 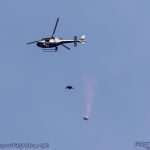 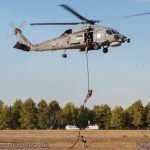 However for Athens Flying Week the crew demonstrated the ability of the Aegean Hawk to deploy and support Special Forces via fast-roping. 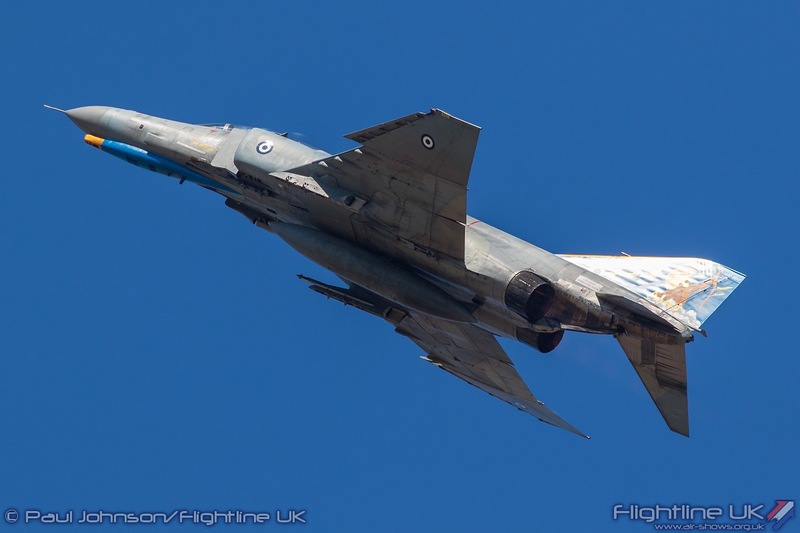 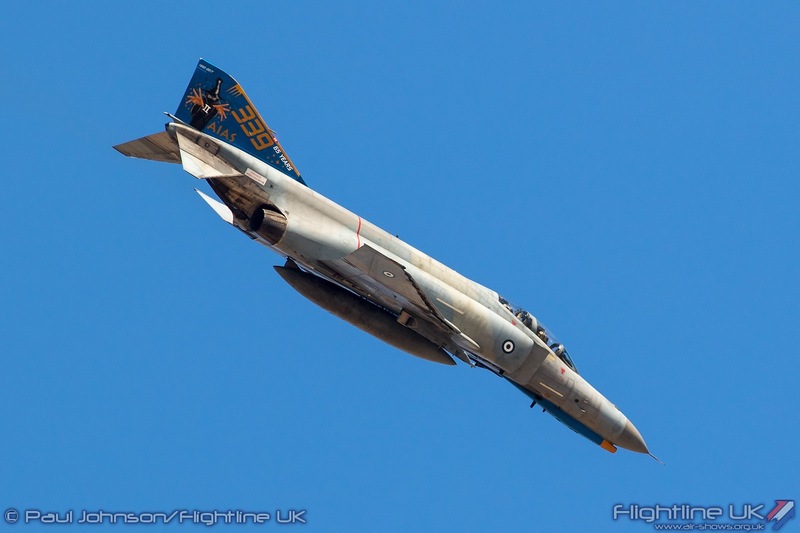 By the far the biggest contribution to the flying came from the Hellenic Air Force. 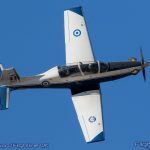 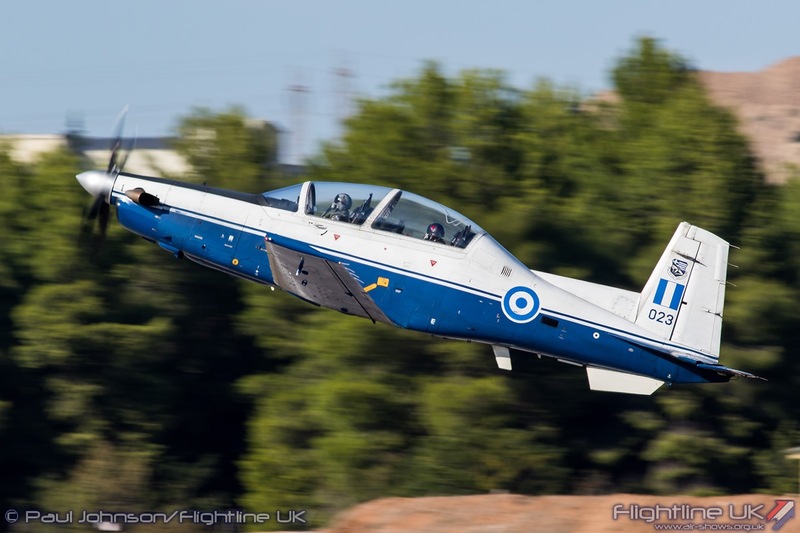 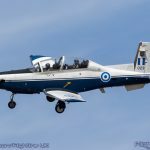 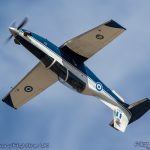 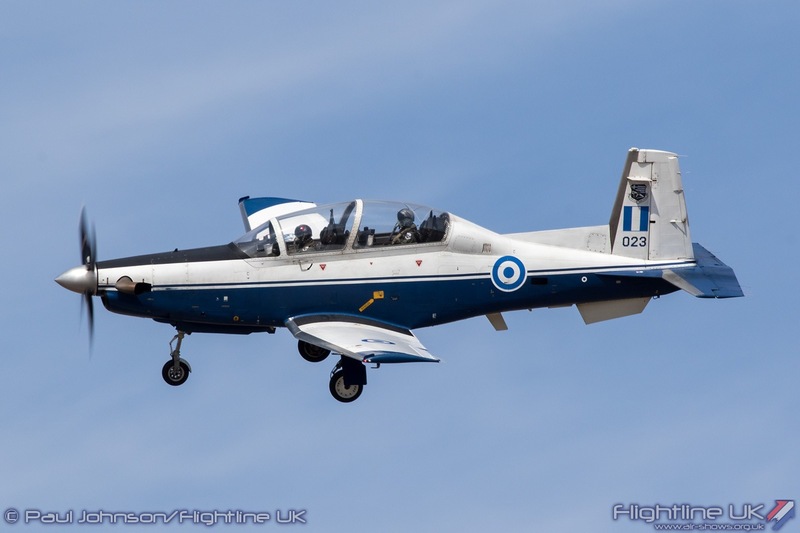 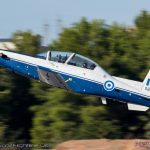 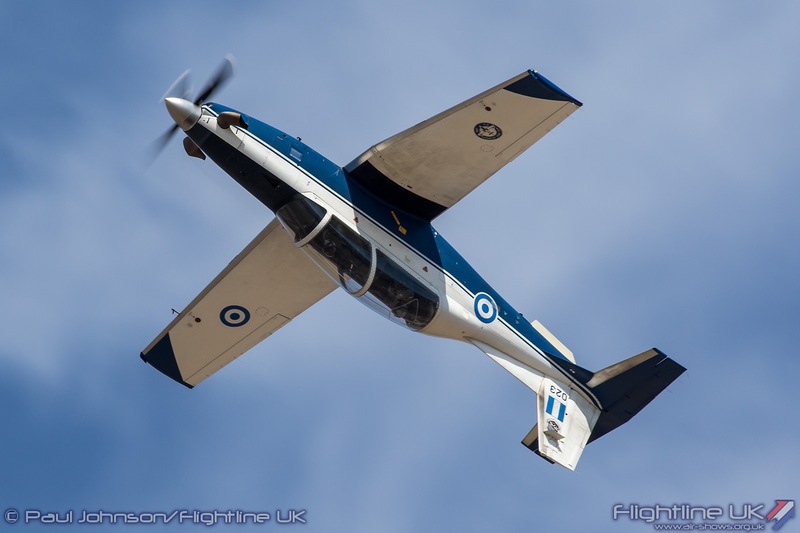 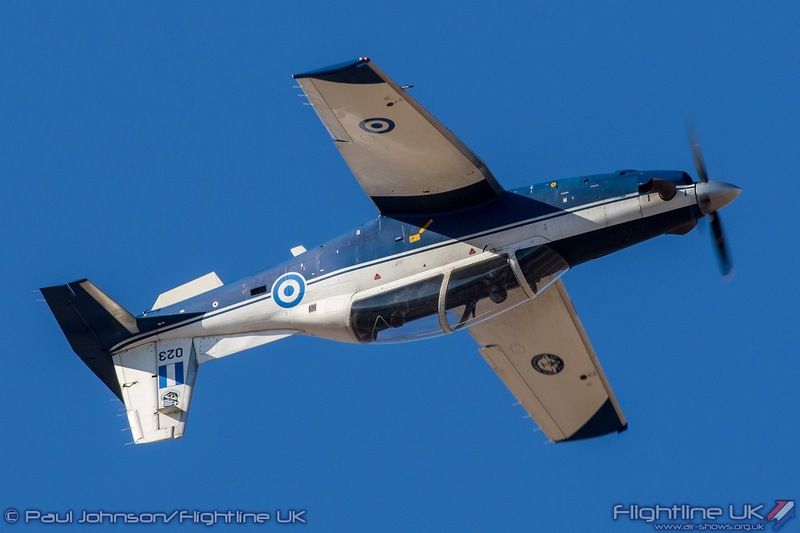 One of the first flypasts each day was performed by a Cessna T-41D Mescalero from the Hellenic Air Force Academy based at Tatoi. 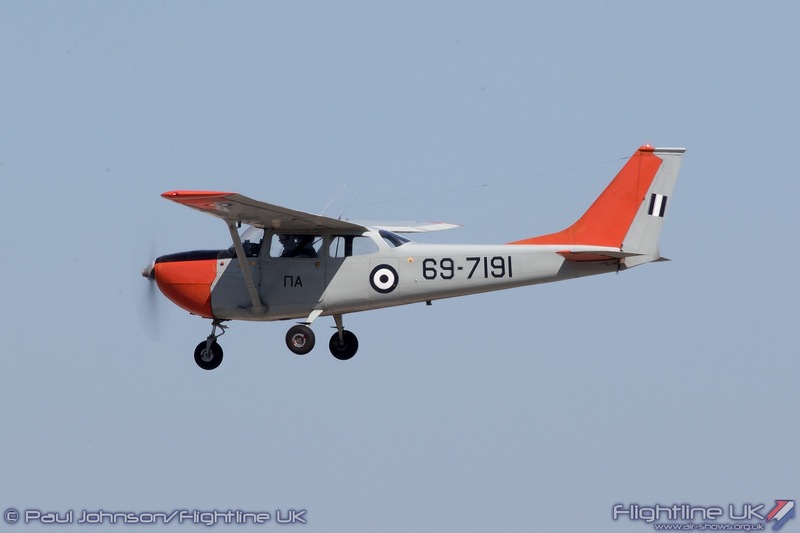 The T-41 is a military development of the popular Cessna 172 and provides elementary flight training. 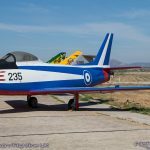 A further training type in the display was the Beechcraft T-6A Texan flown by the Daedalus Demonstration Team from Kalamata Air Base. 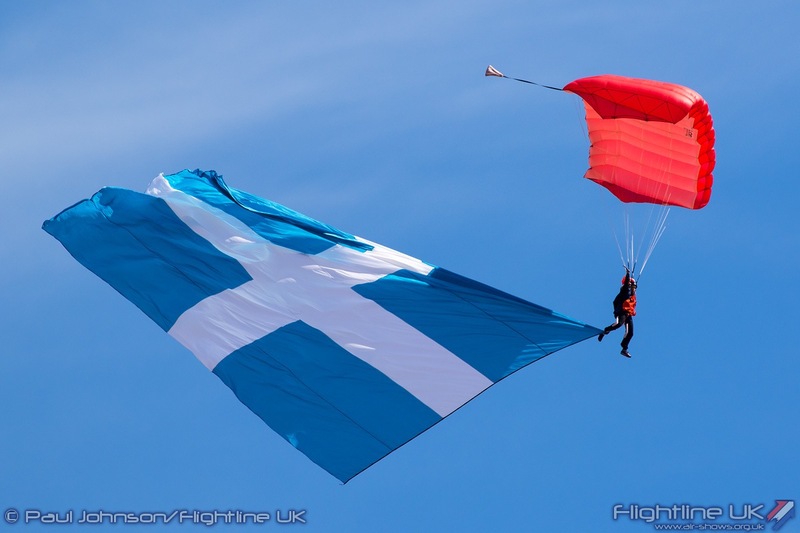 The team were formed in 2005 and have been a popular participant at a variety of Greek events. 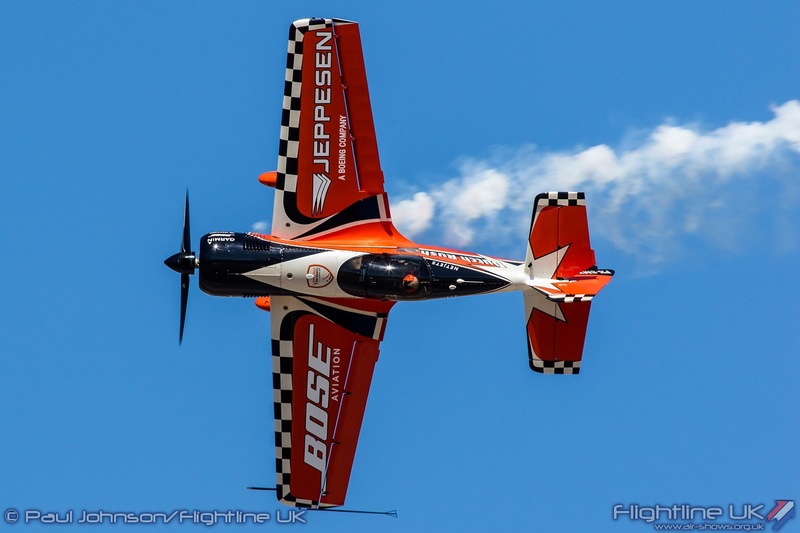 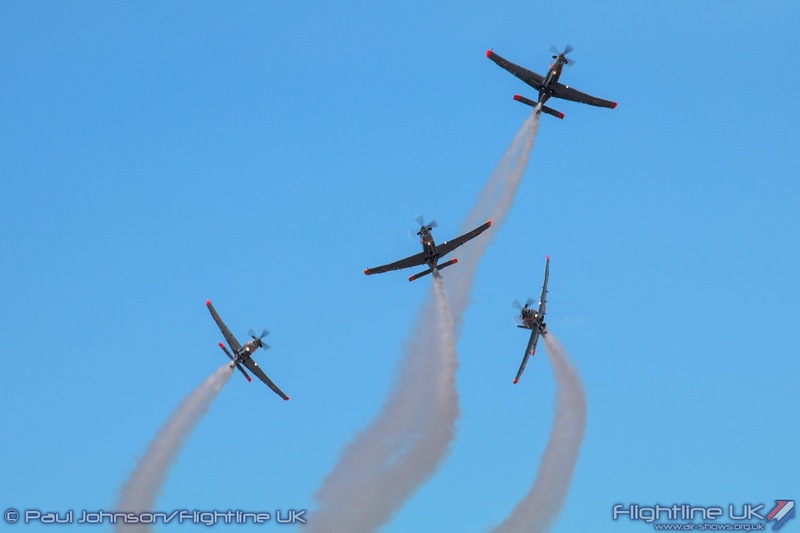 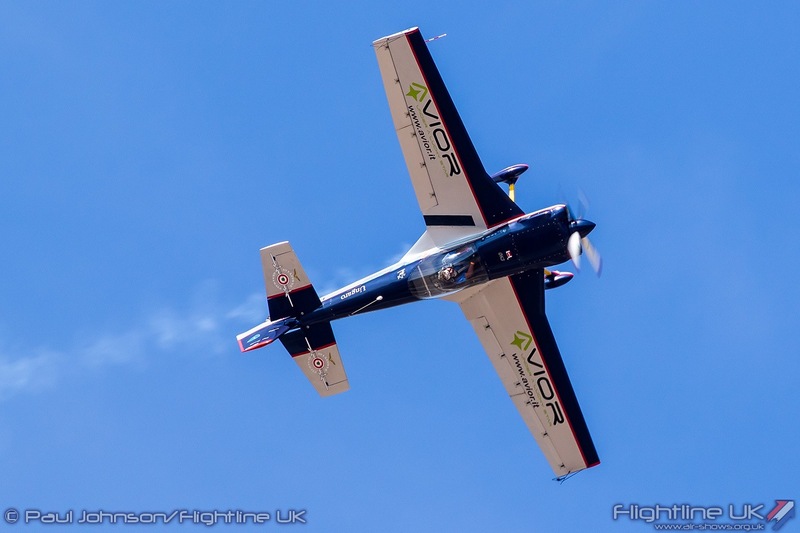 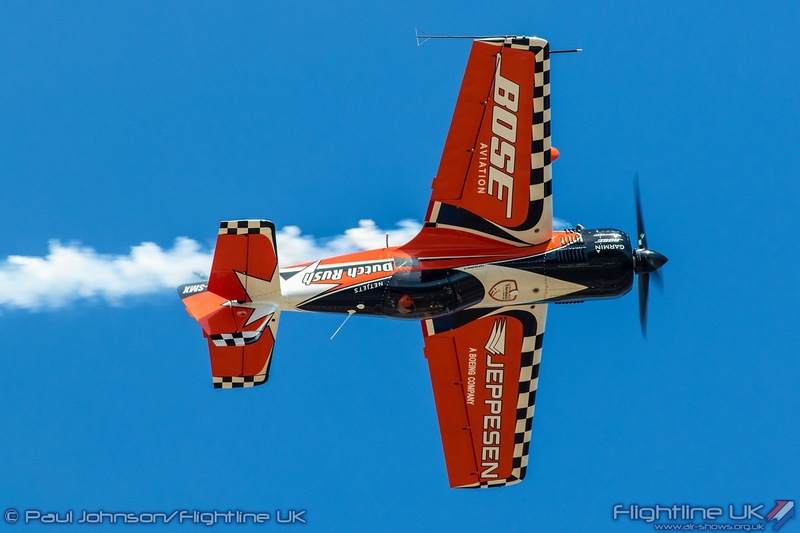 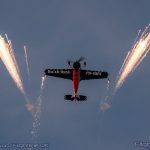 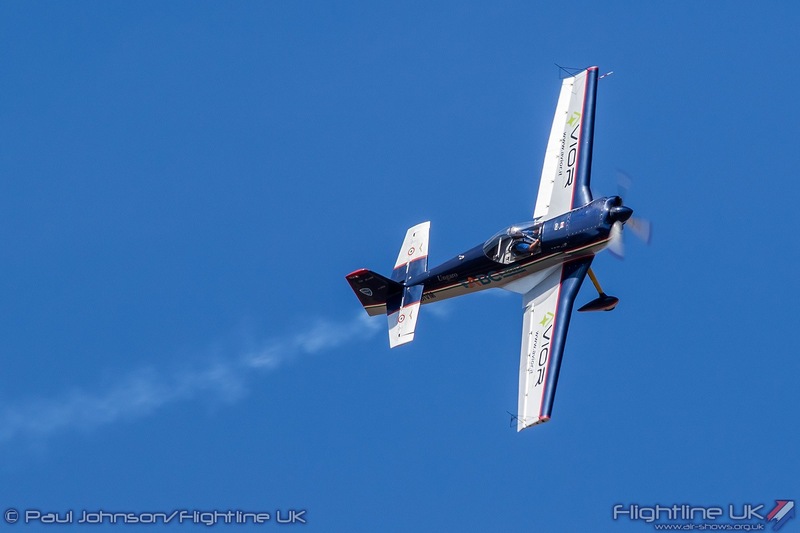 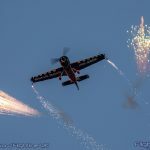 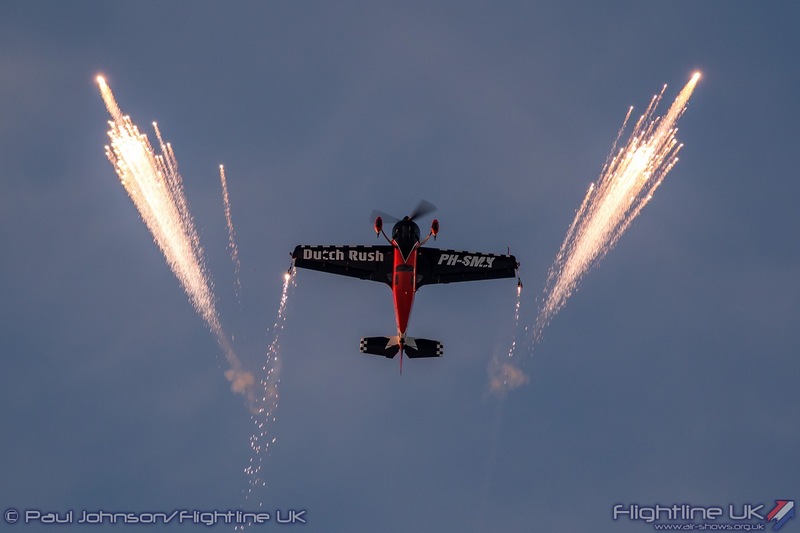 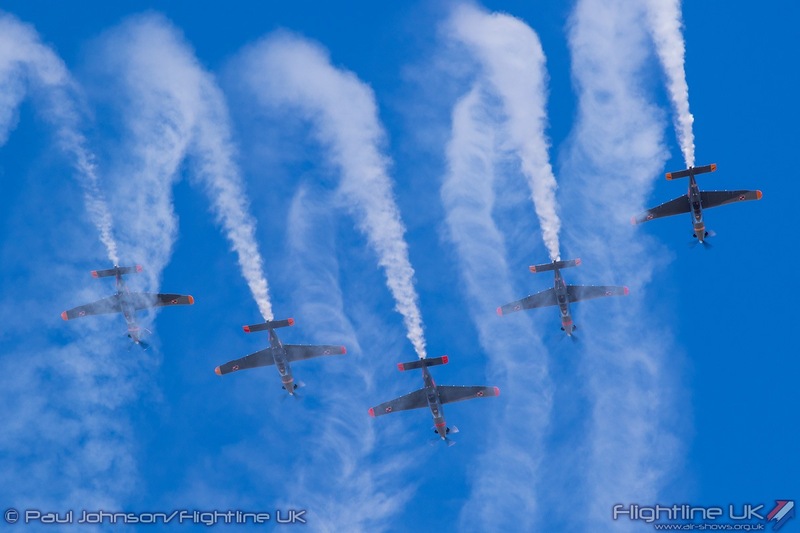 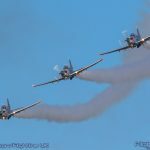 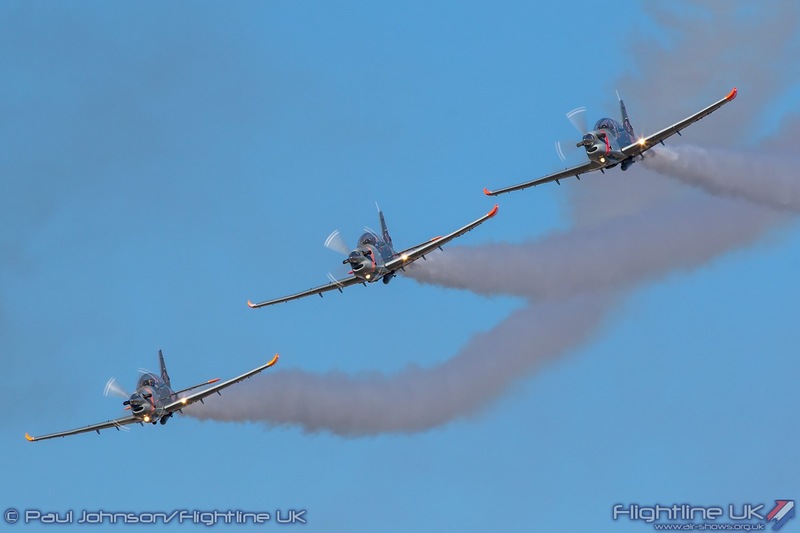 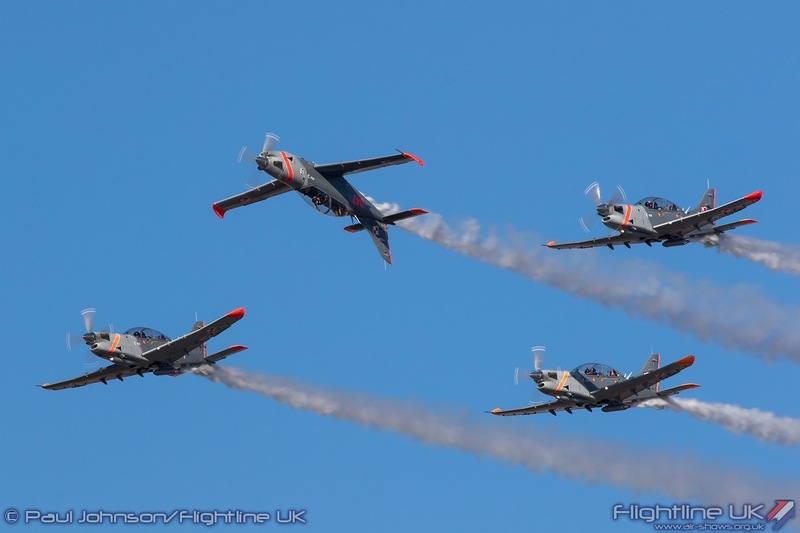 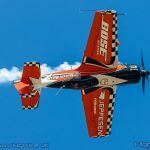 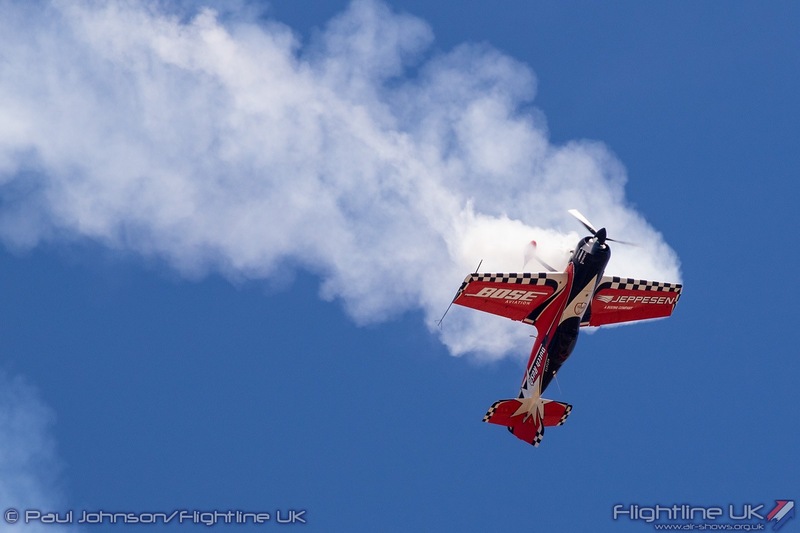 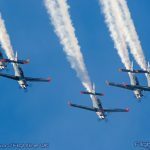 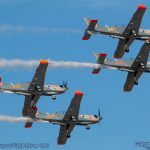 When the team were formed, they were trained by crews from the USAF T-6 Demonstration team and their display has a very American feel to it with a series of set-piece passes and aerobatic figures. 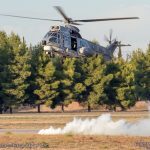 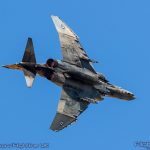 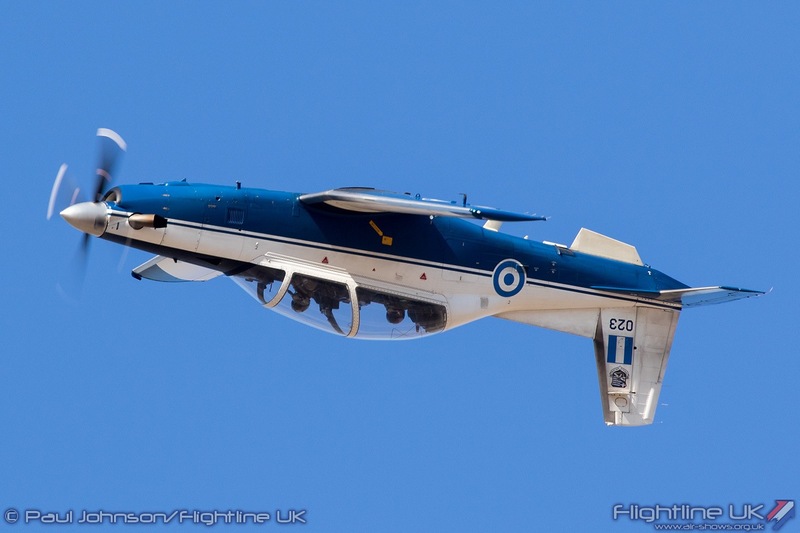 The Hellenic Air Force fire-bombing fleet has been high in the news this year following the devastating wildfires which occurred earlier in the summer during the European heatwave. 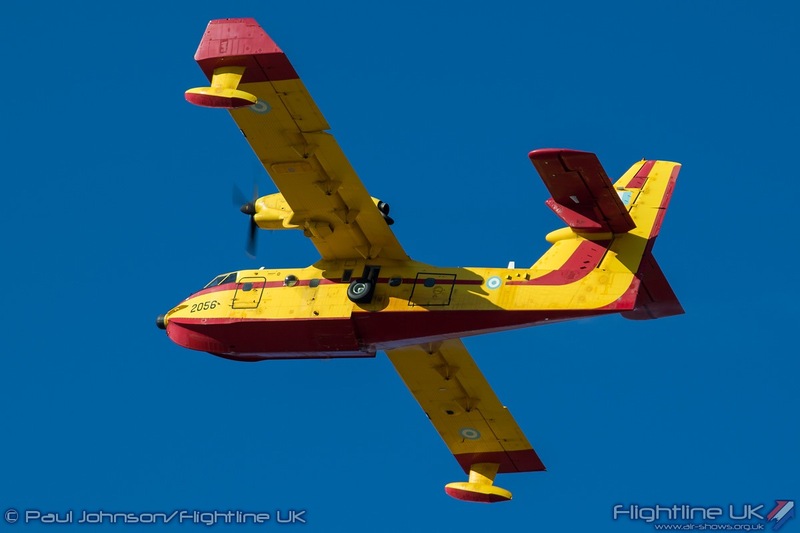 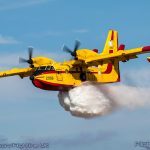 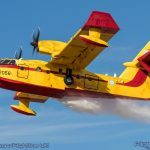 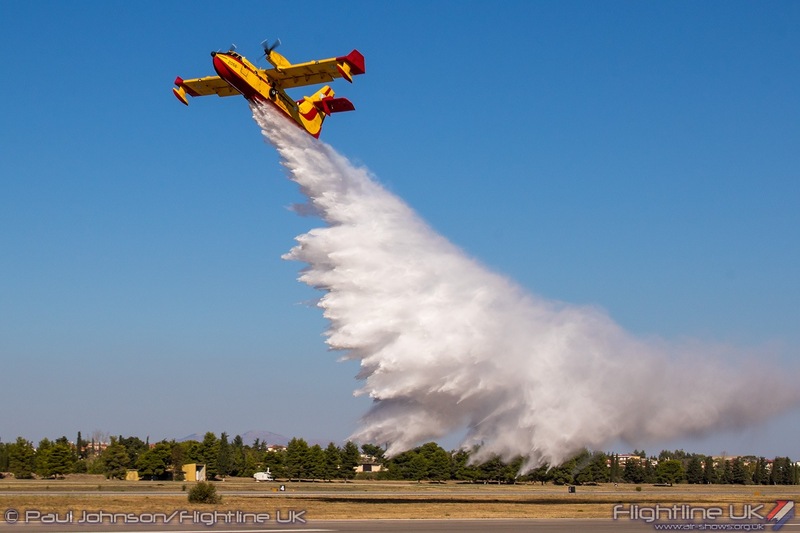 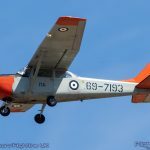 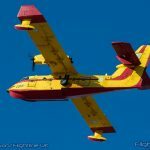 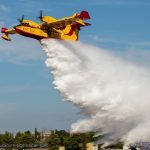 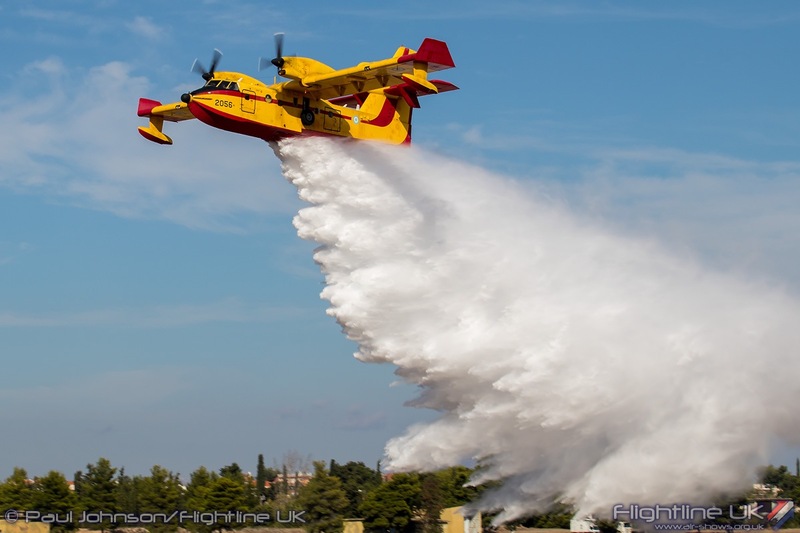 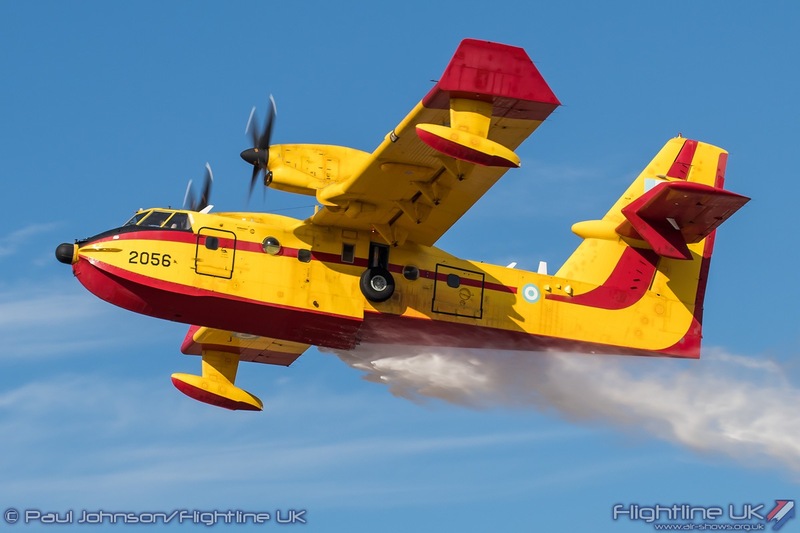 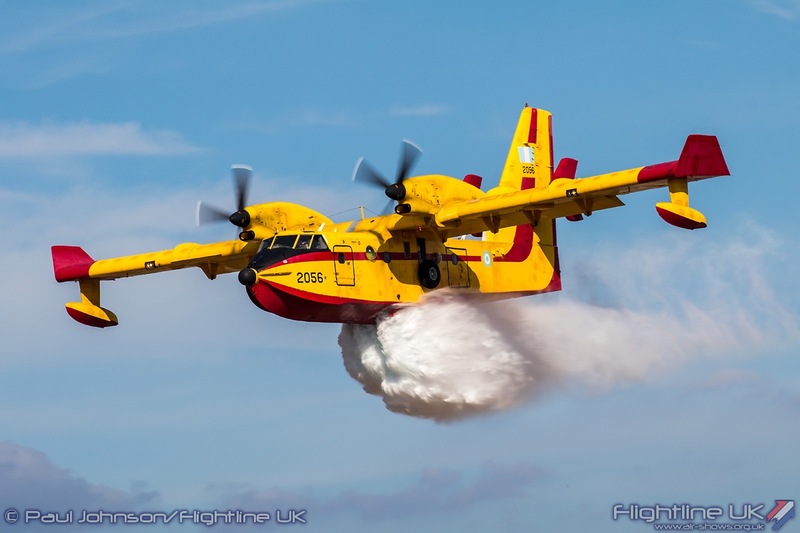 A Canadair CL415 from 383 “Proteas” Squadron based at Thessaloniki Air Force Base performed a single, but spectacular water drop on each day delivering some 5,000 litres in just 12 seconds. 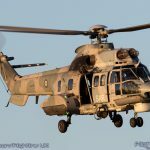 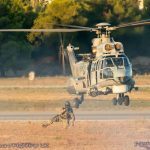 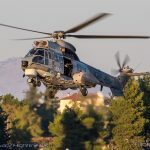 A very rare Hellenic Air Force participant was a Eurocopter AS332C Super Puma from 358 Squadron based at Elefsis Air Force Base. 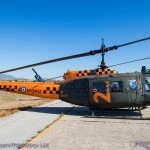 These aircraft are used for a variety of missions, but most notably conduct Search and Rescue missions across the country. 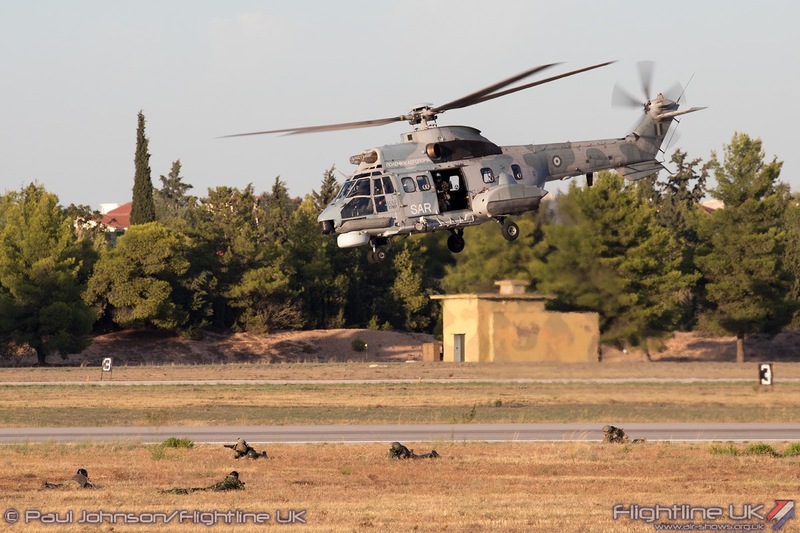 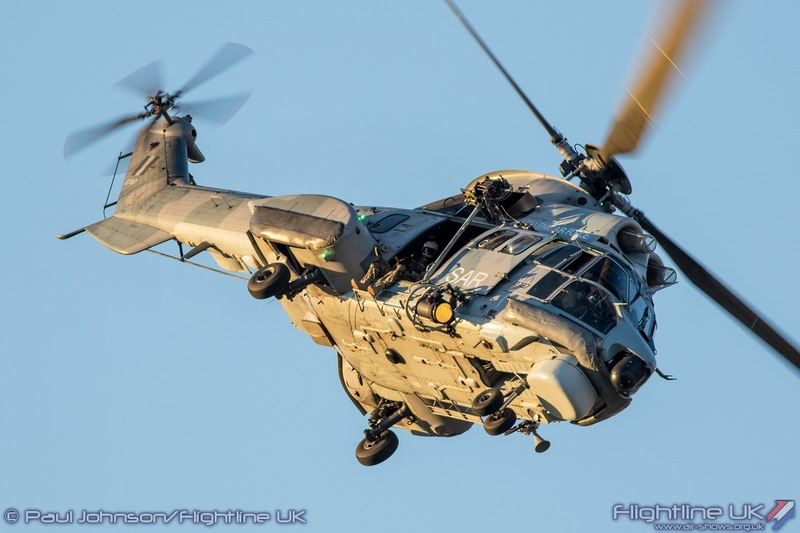 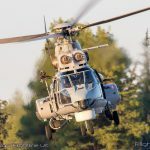 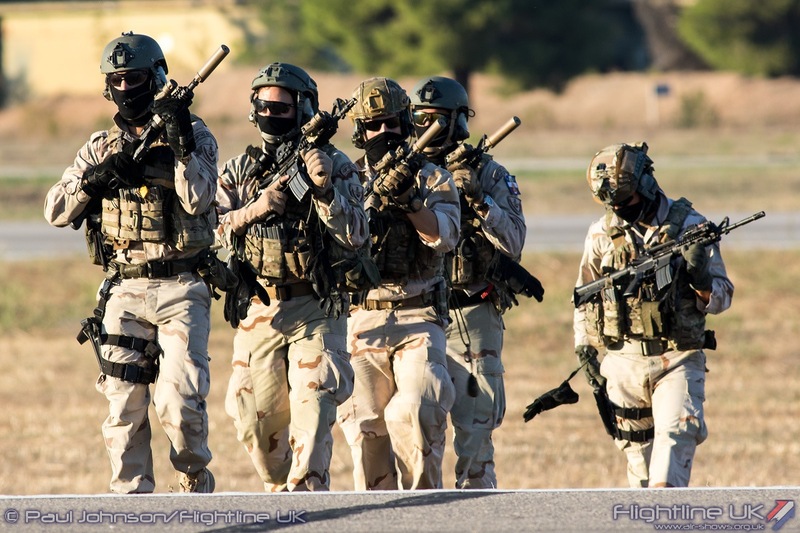 For the AFW display, the Super Puma demonstrated its Combat Search and Rescue role deploying special forces to retrieve straded military personnel. 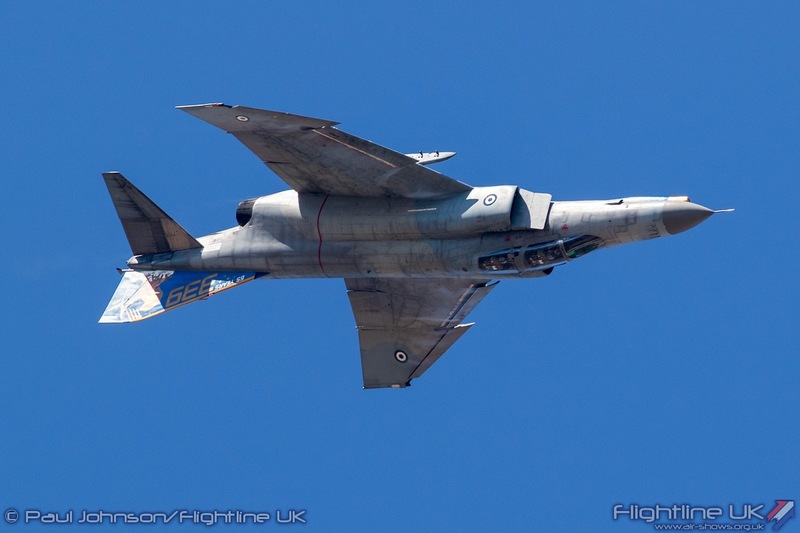 The highlight of the Hellenic Air Force contribution was the fast jets. 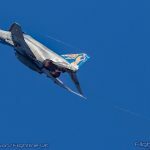 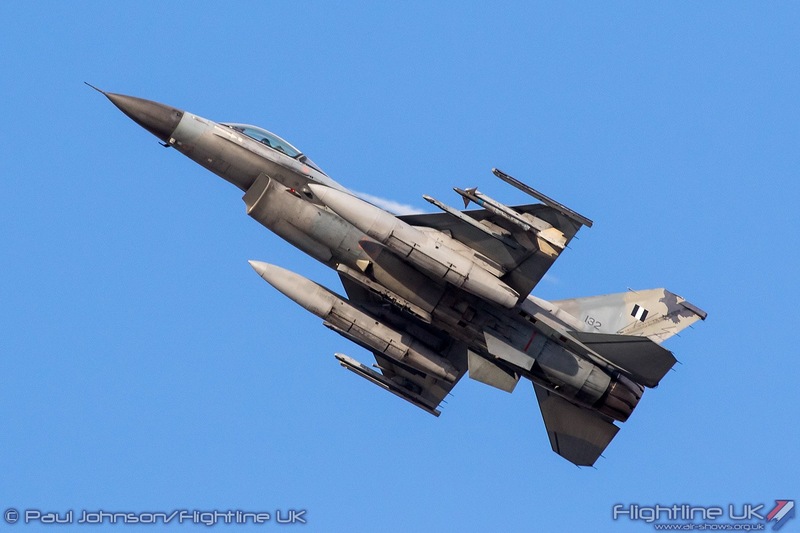 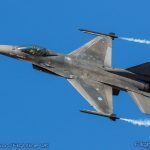 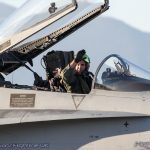 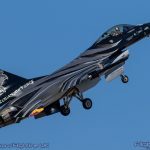 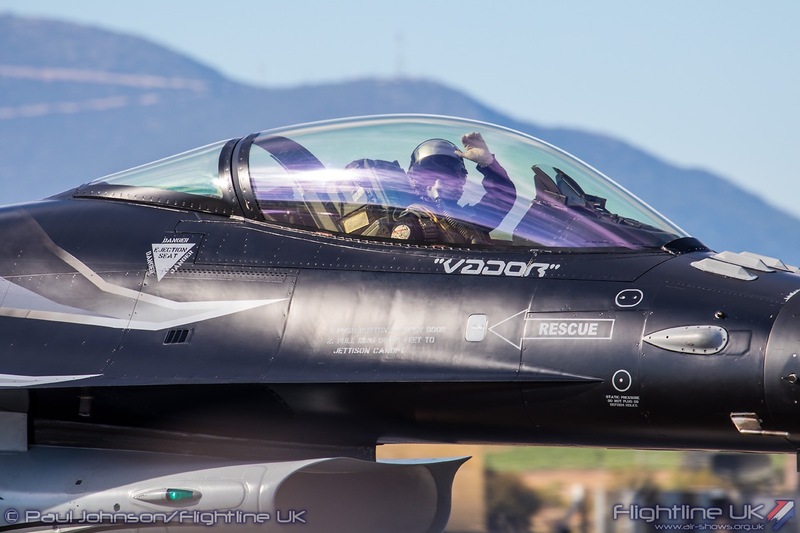 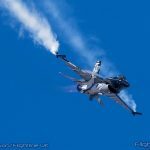 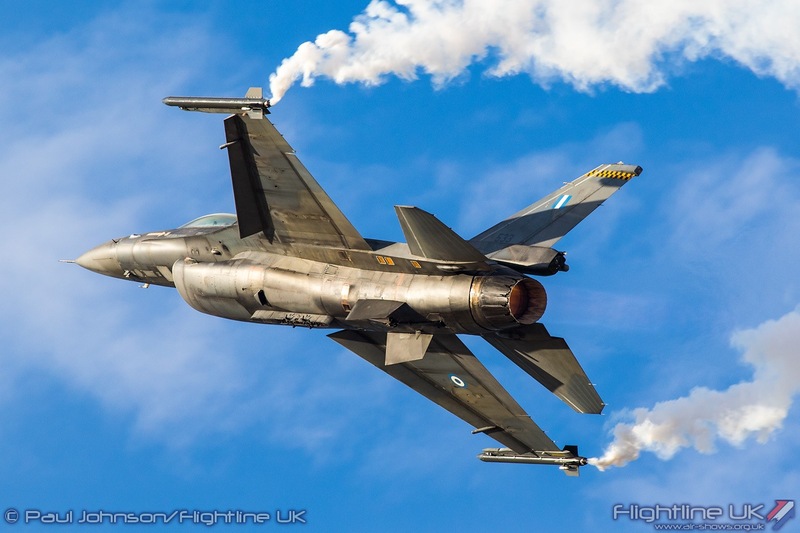 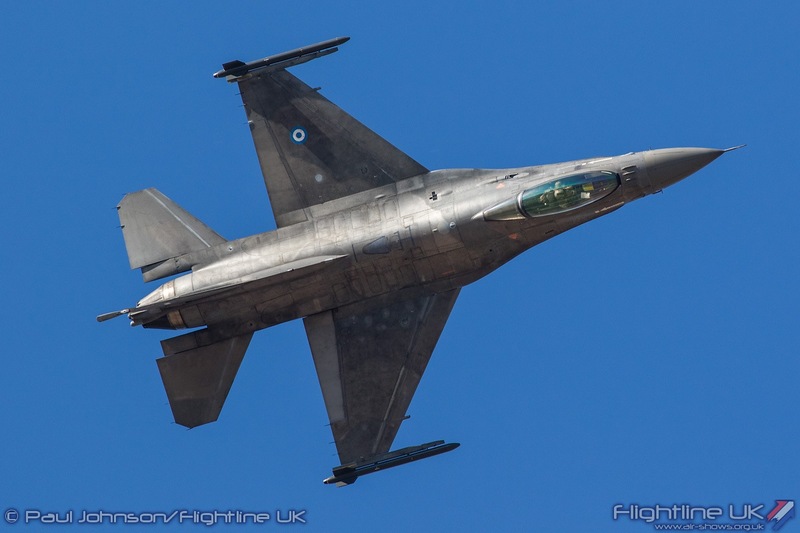 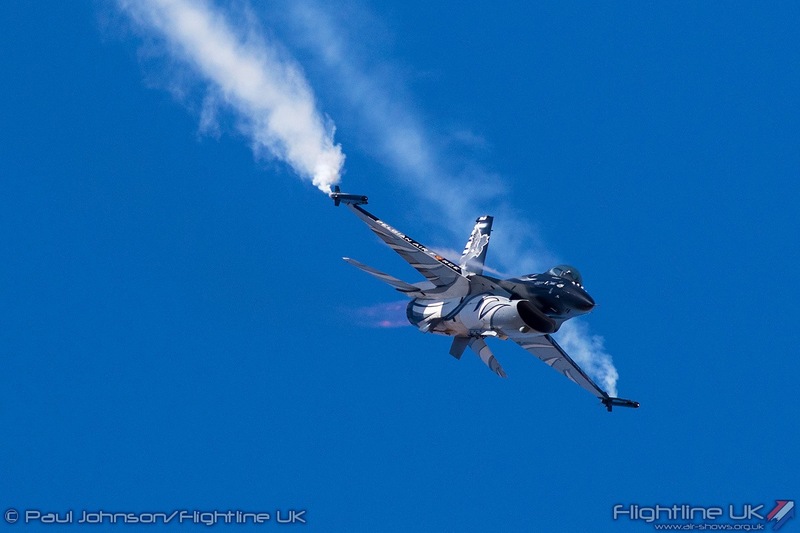 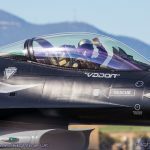 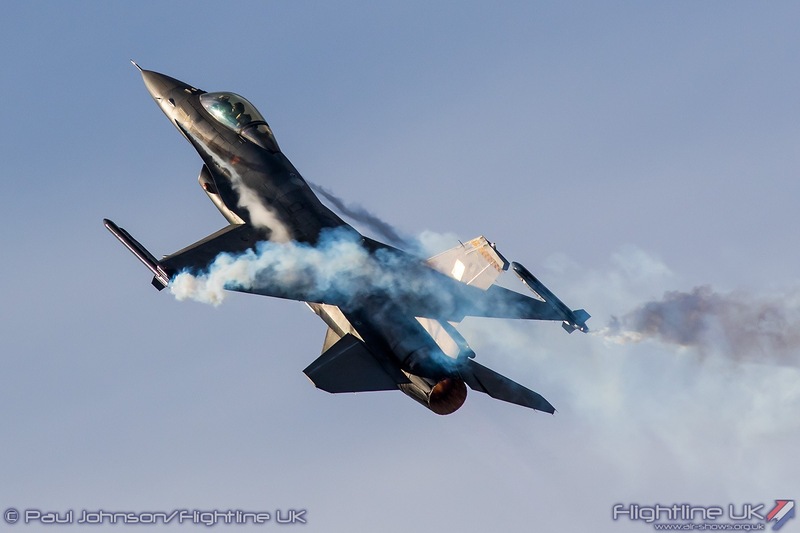 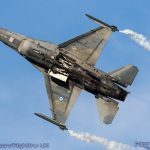 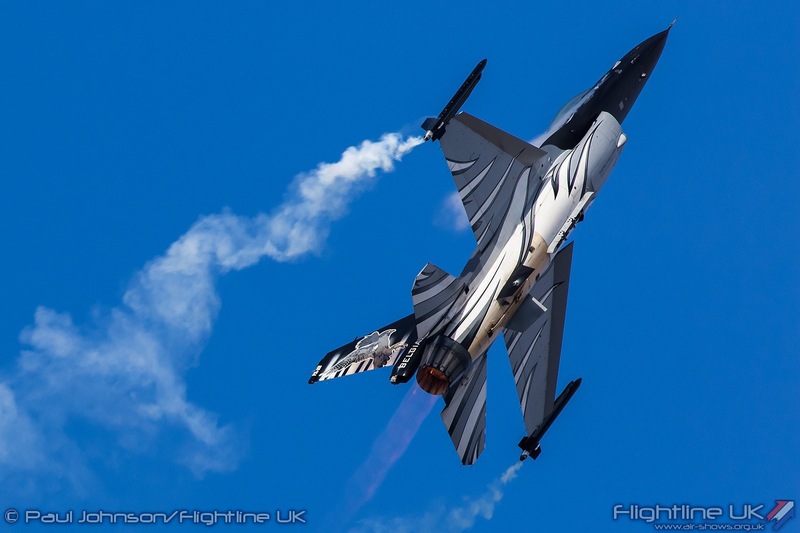 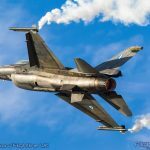 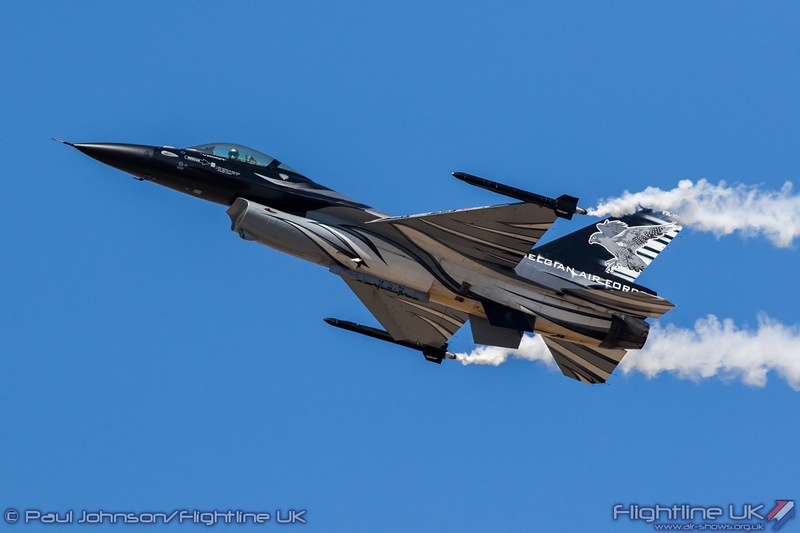 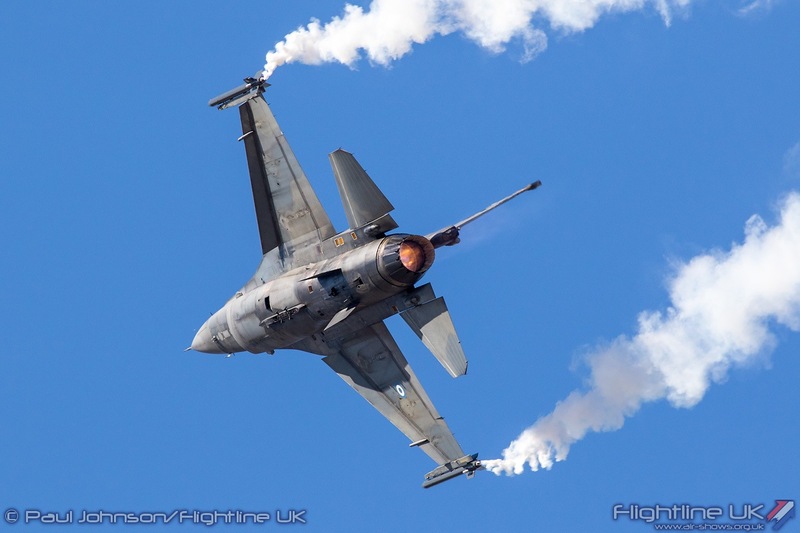 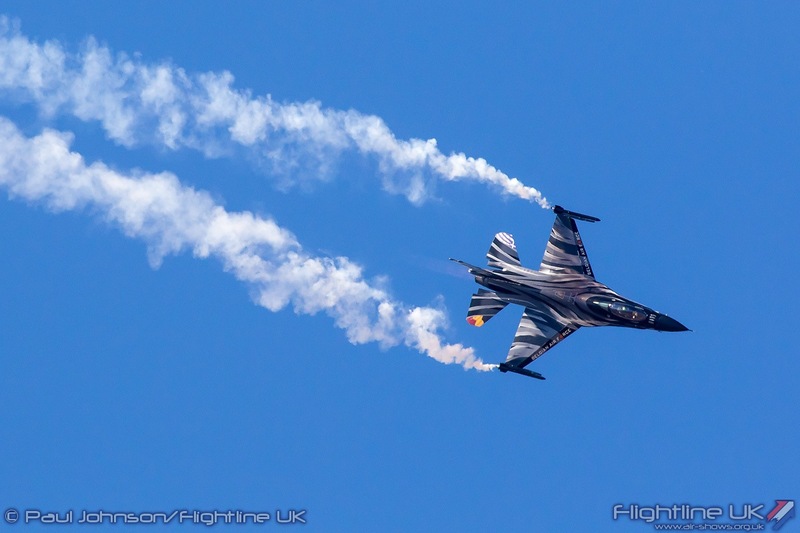 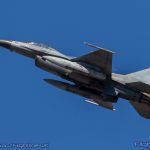 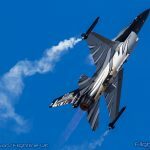 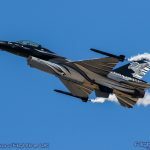 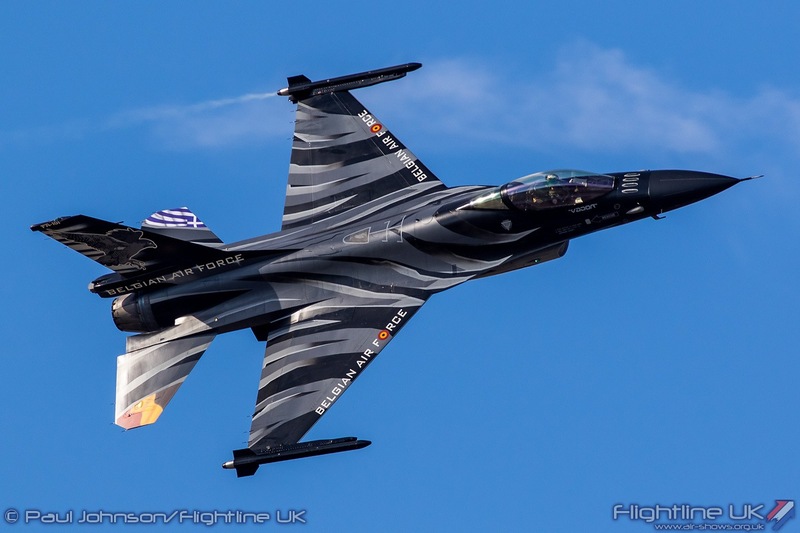 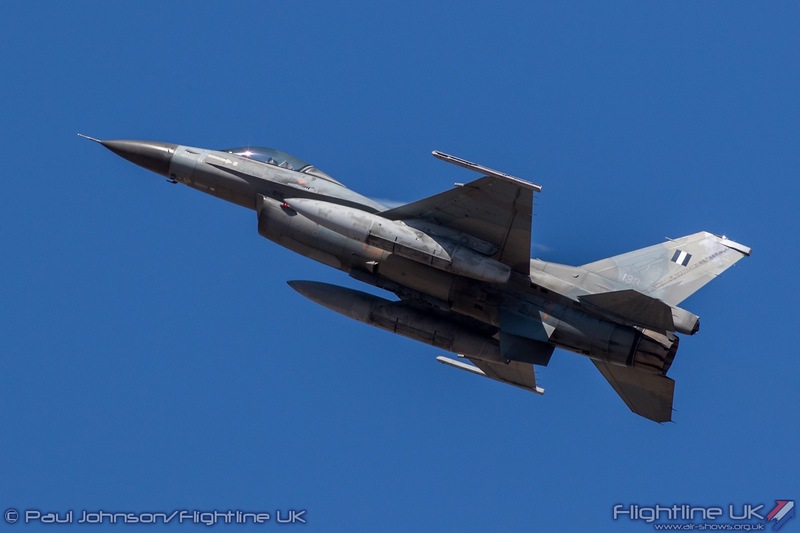 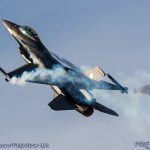 The Zeus Demo Team, one of the most popular solo displays on the European circuit, were on hand flying the latest Lockheed Martin F-16C Block 52 Fighting Falcon. 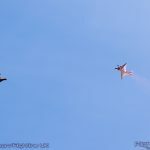 However, there were also some very unique fast jet demonstrations from the Air Force that were far less familiar that appeared in a linked sequence of displays. 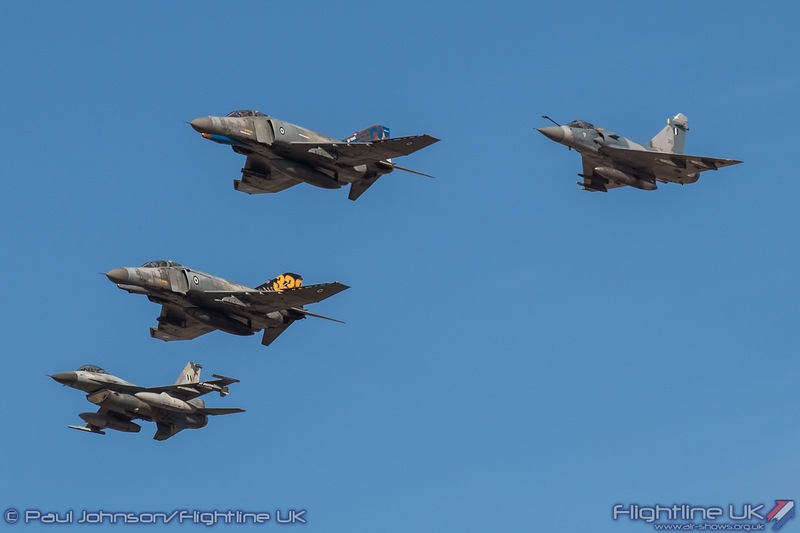 Opening the sequence was a four-ship formation of two McDonnell Douglas F-4E(HUP) Phantom IIs, a Dassault Mirage 2000EG and a Lockheed Martin F-16C Fighting Falcon. 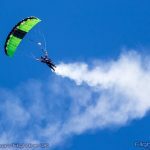 The various elements then split into two different demonstrations. 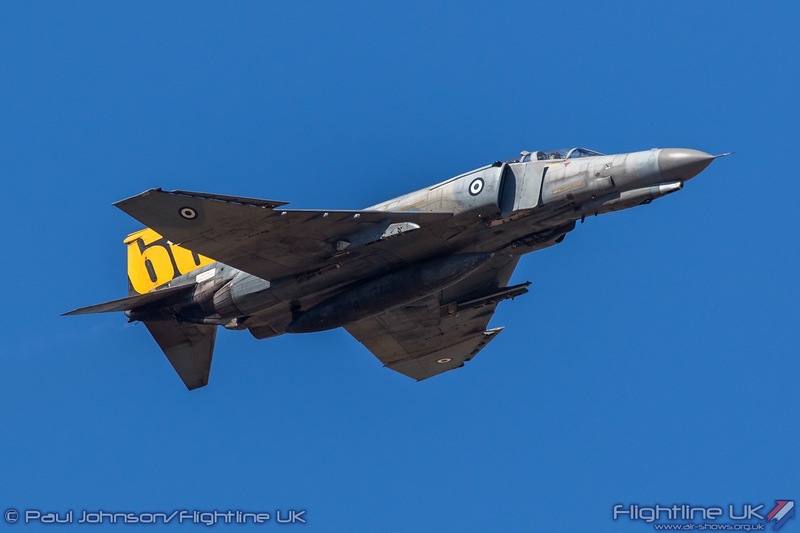 The two F-4E(HUP) Phantoms from 338 and 339 Squadrons based at Andrabida Air base performed an airfield attack pitching up and then reversing to simulate ground attack runs in different directions before performing a final fast pass and zoom climb. 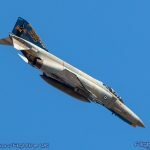 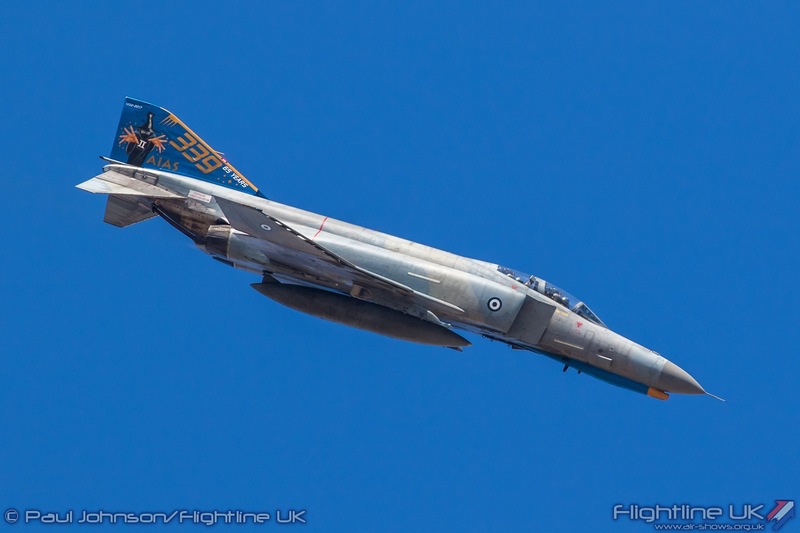 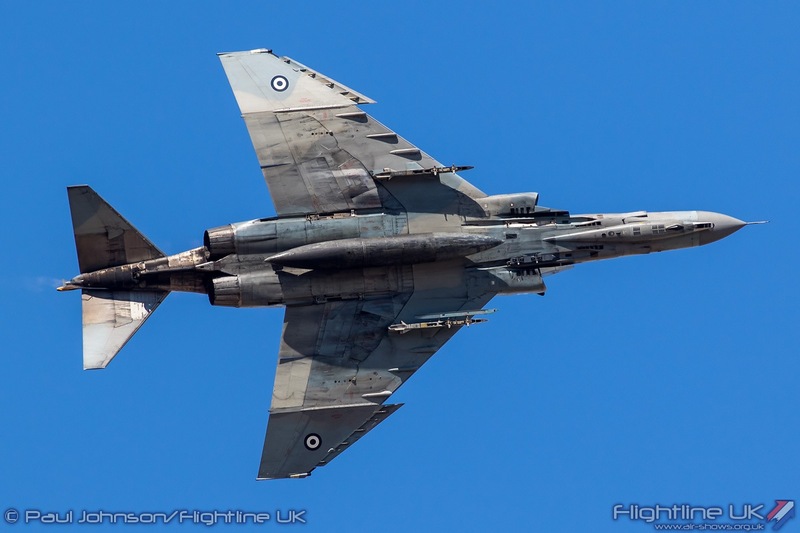 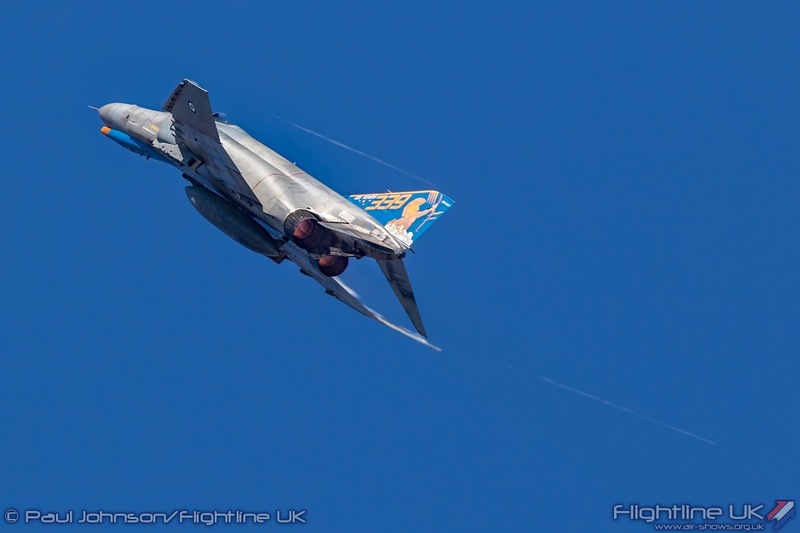 The Hellenic Phantoms are the last of their type in service within mainland Europe so to see them perform in a flying display was one of the highlights of the show both for the locals and overseas visitors alike. 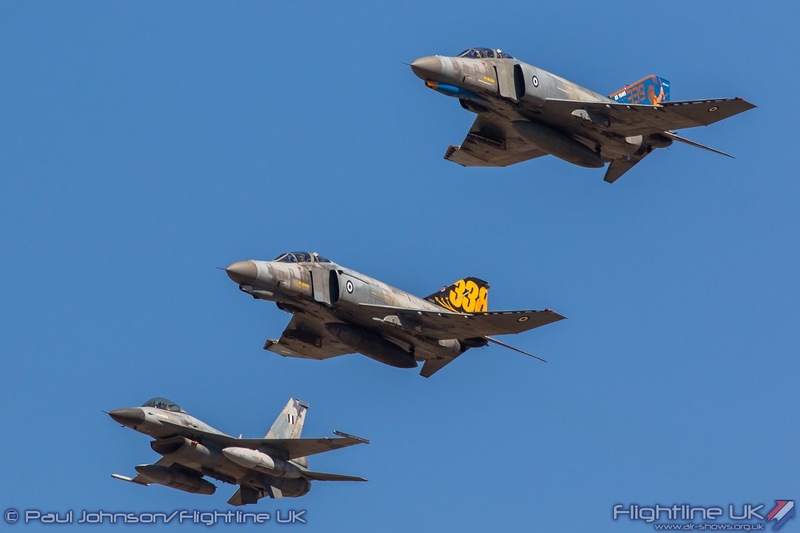 If there was one gripe, it was that the Phantoms appearance was all too short! 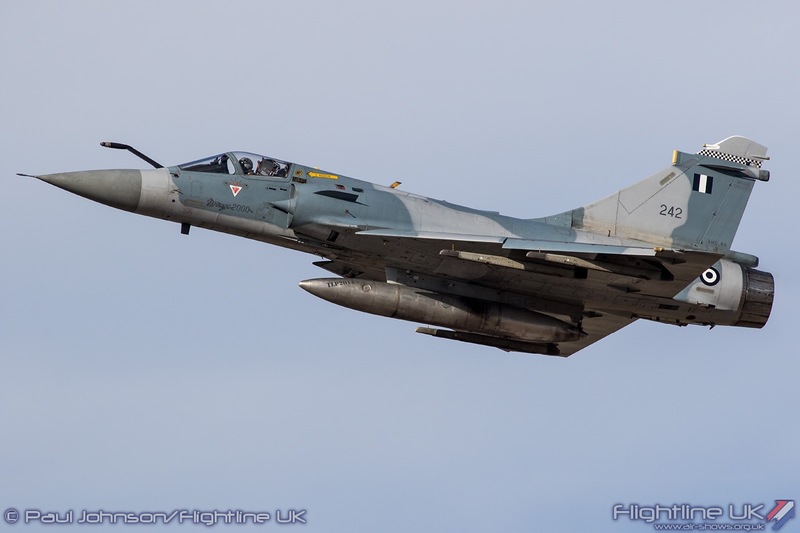 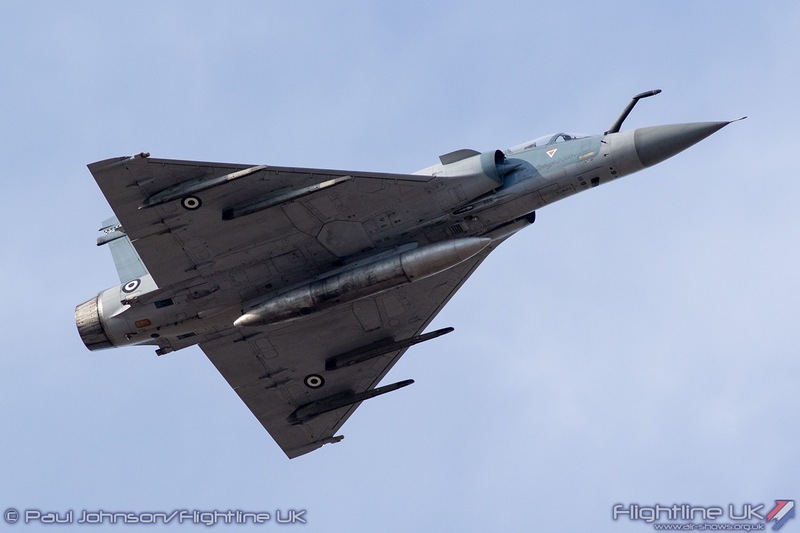 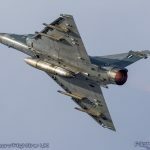 The Tanagra based Mirage 2000EG and the F-16C performed a simulated dogfight together highlighting some dramatic low speed air combat manoeuvres. 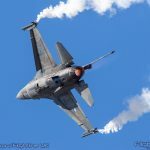 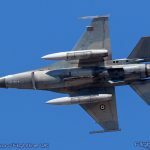 The F-16 played the part of the aggressor trying to evade the Mirage as they twisted and turned if front of the crowds. 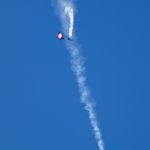 It was certainly a very unique demonstration and something I’ve not seen performed anywhere else. 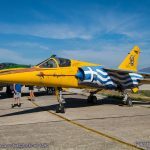 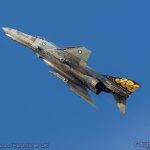 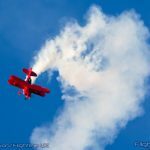 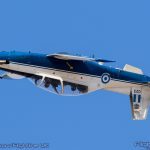 The Athens Flying Week airshow is a unique event on the European airshow calendar. 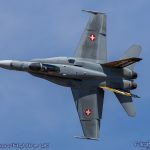 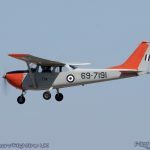 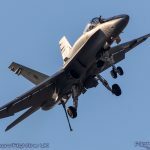 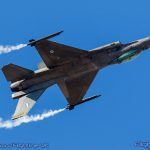 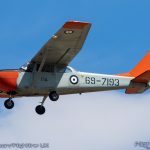 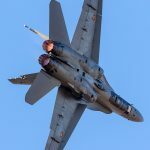 In 2018, as it has done in previous years, the airshow hosted a number of displays and aircraft both in the static and flying displays that simply are not seen elsewhere from both civilian and military operators. 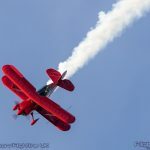 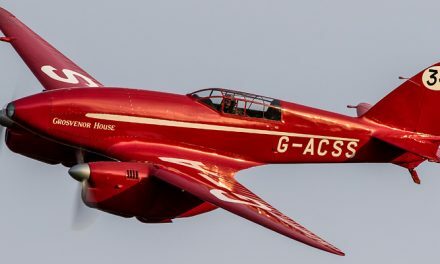 The event was full of spectacle and colour throughout and should definitely be on the radar for any airshow enthusiasts looking for something that bit different! 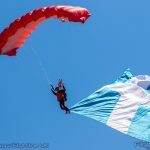 You are guaranteed the warmest of welcomes and the show can easily be combined with a short break in Athens or many other surrounding towns with much to explore within the region.